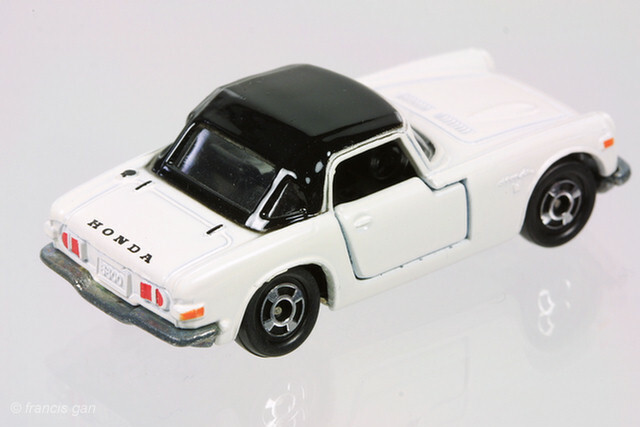 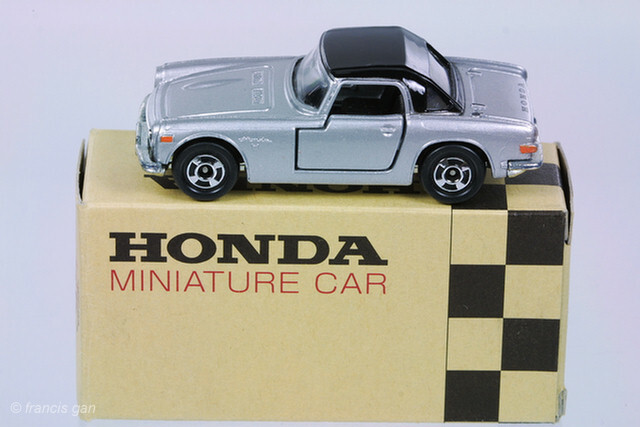 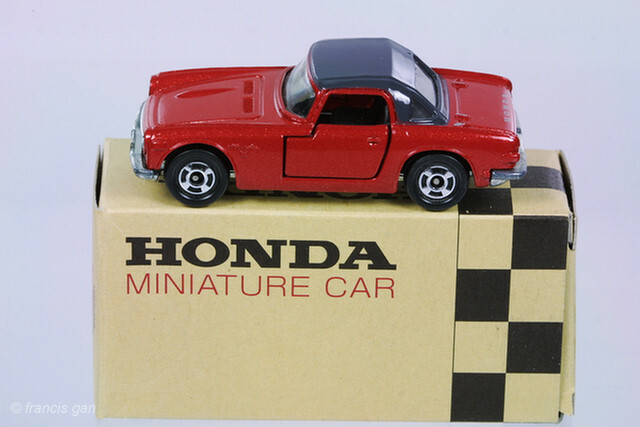 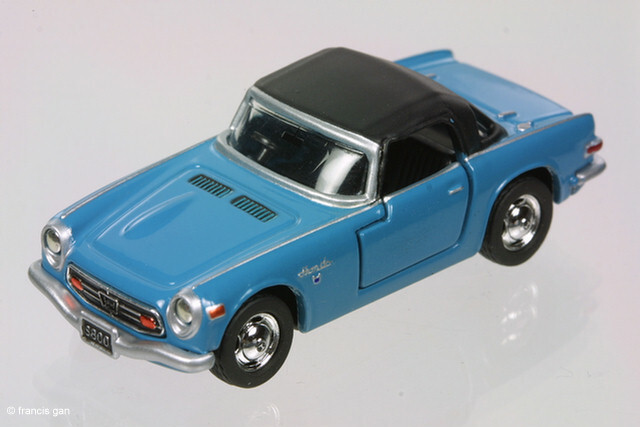 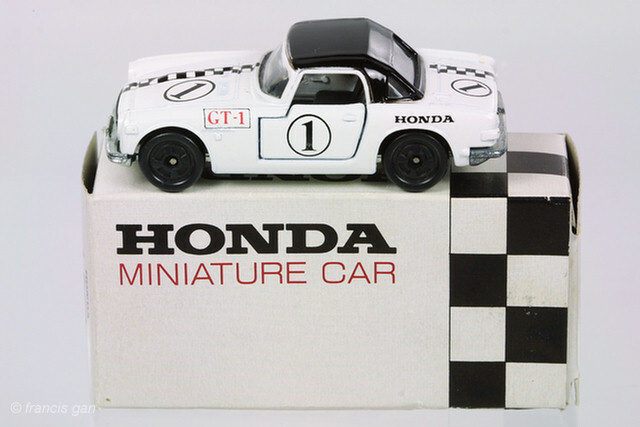 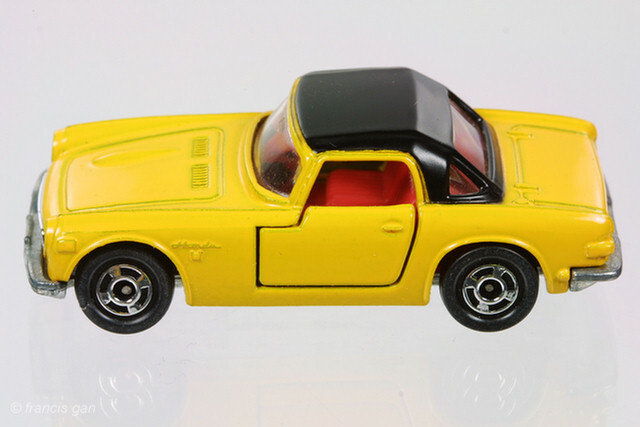 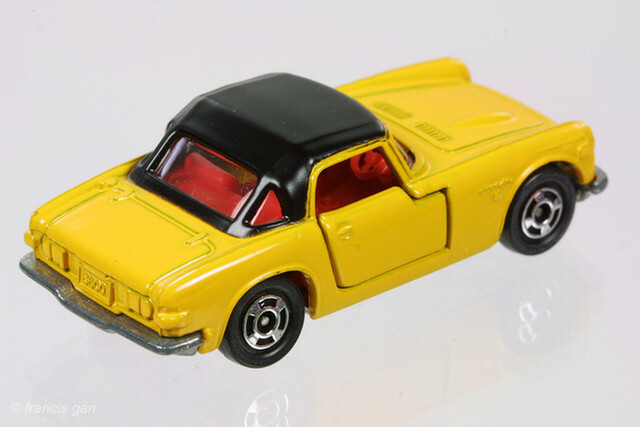 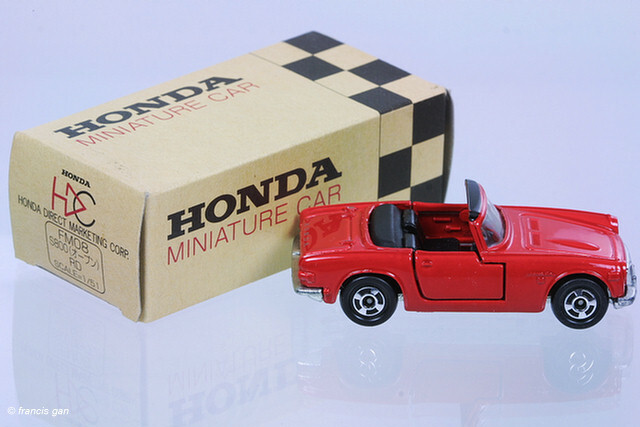 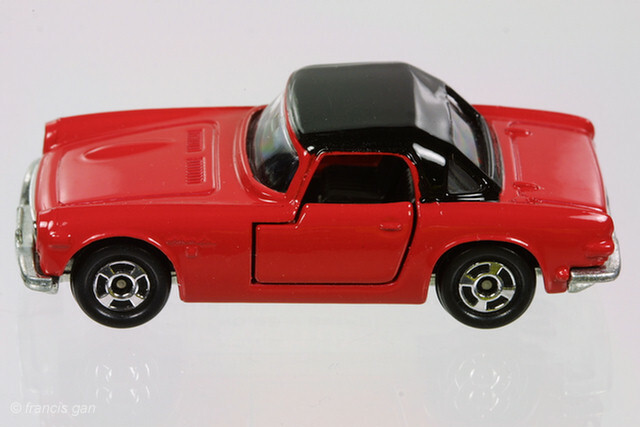 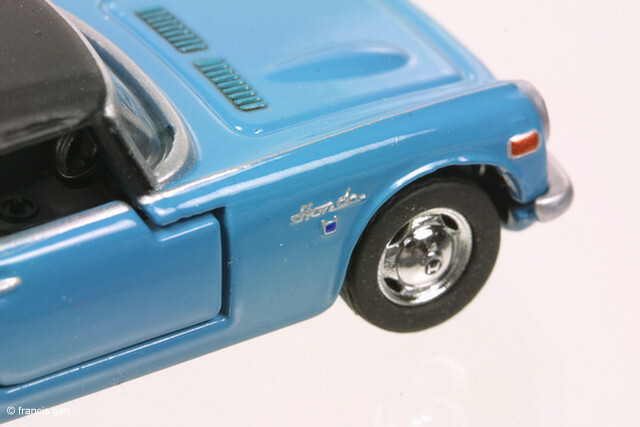 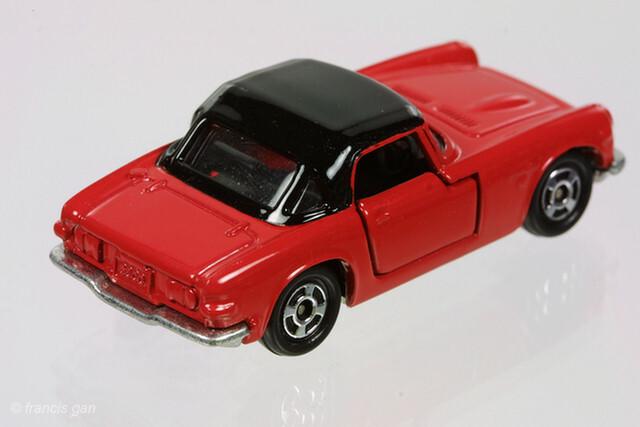 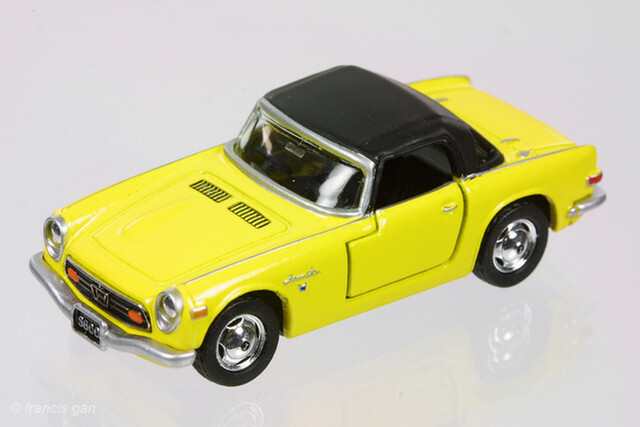 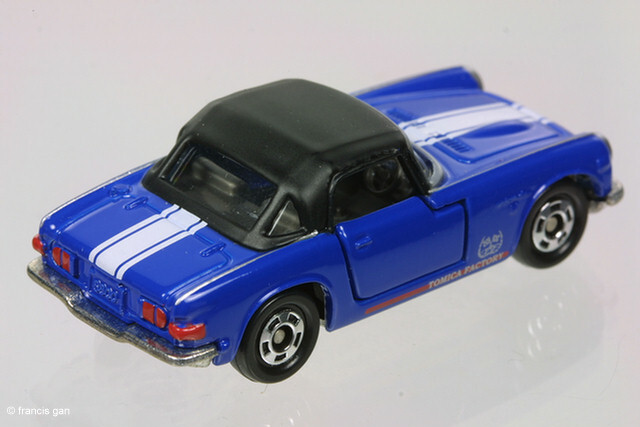 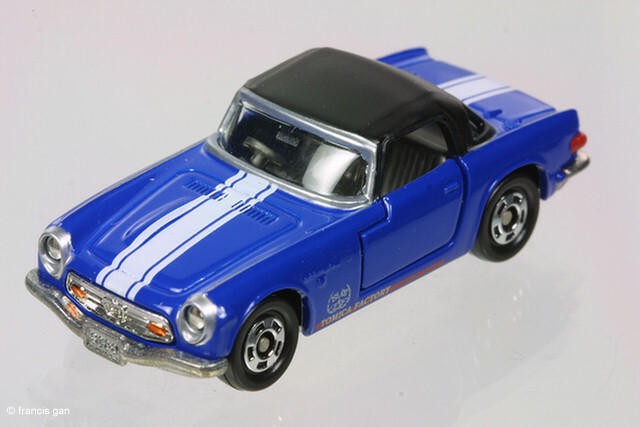 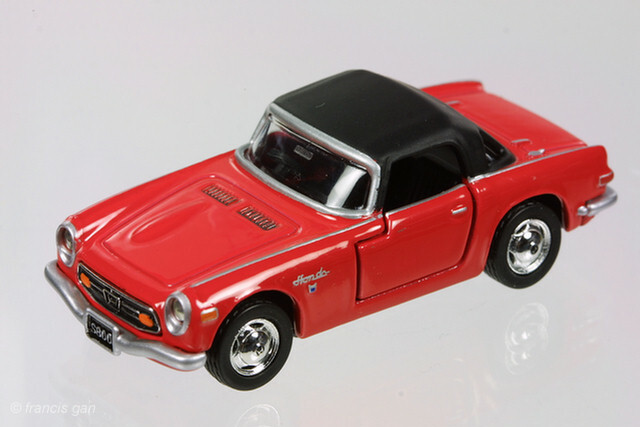 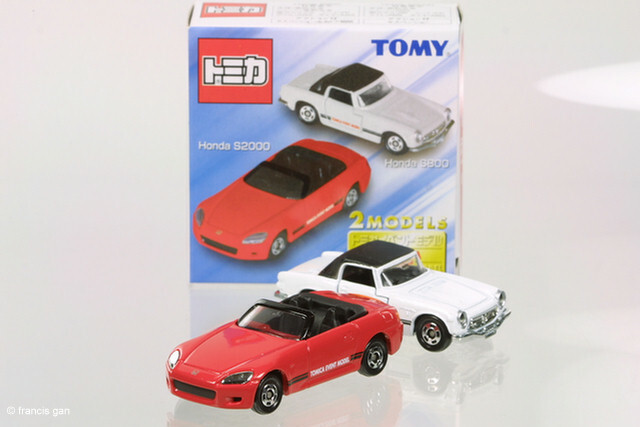 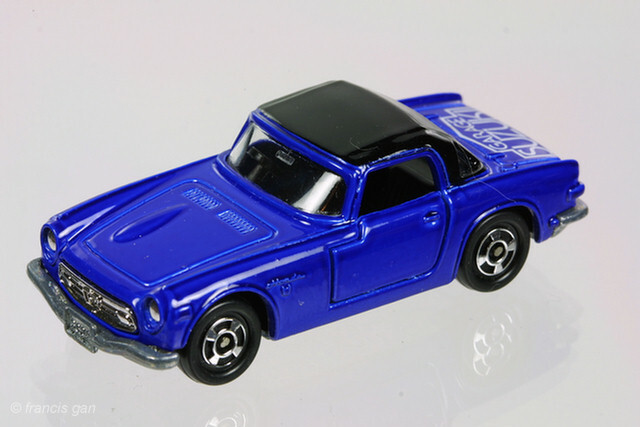 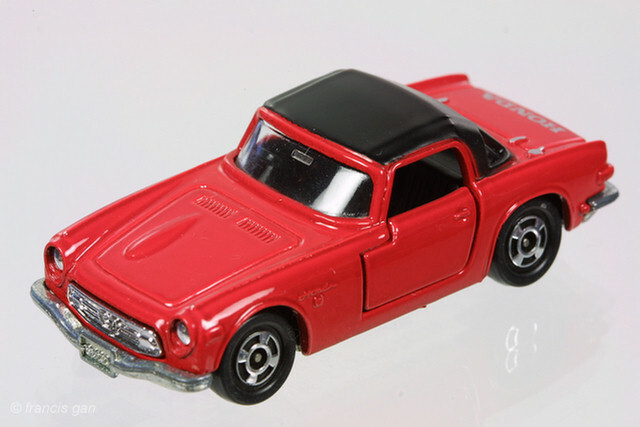 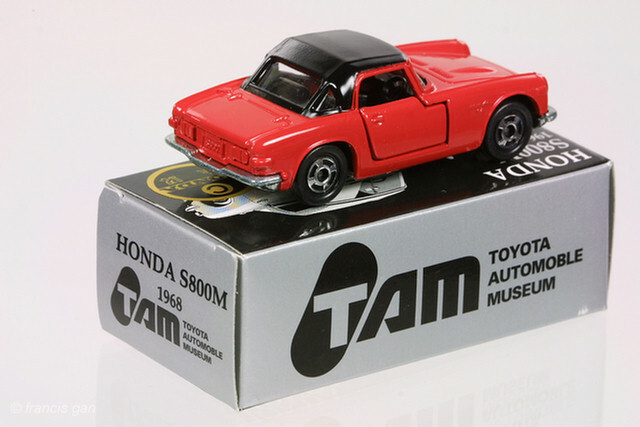 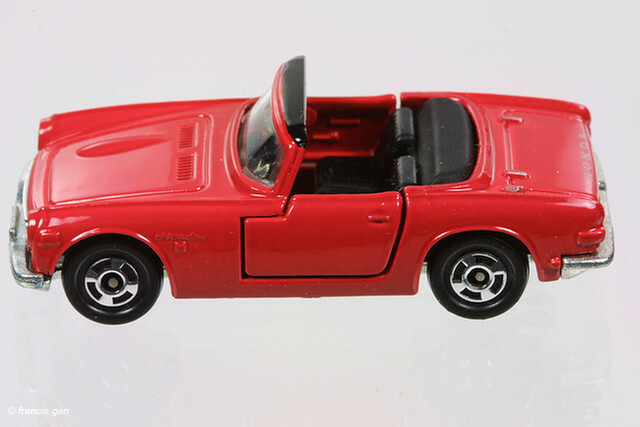 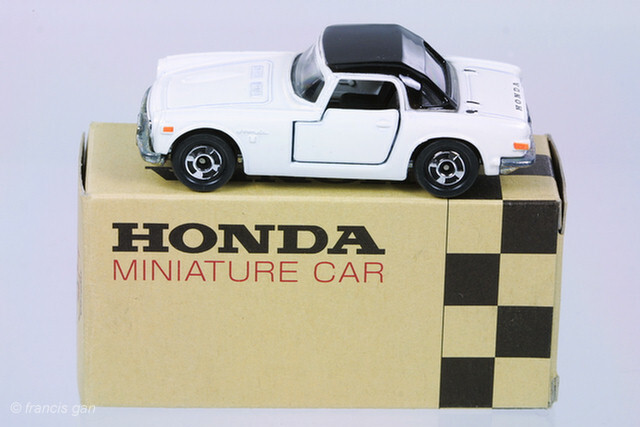 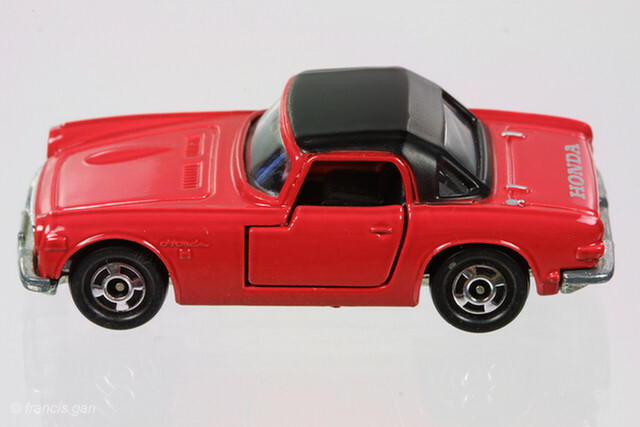 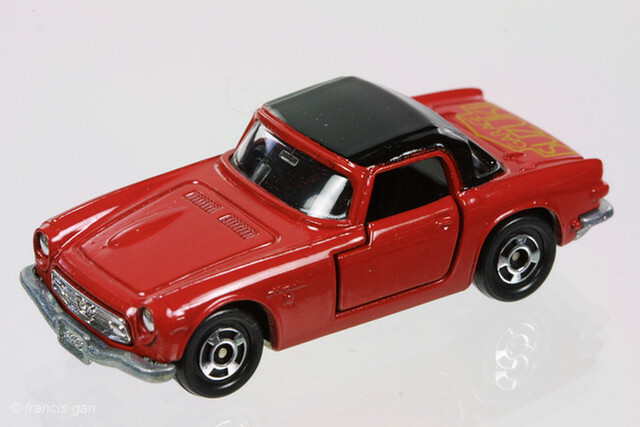 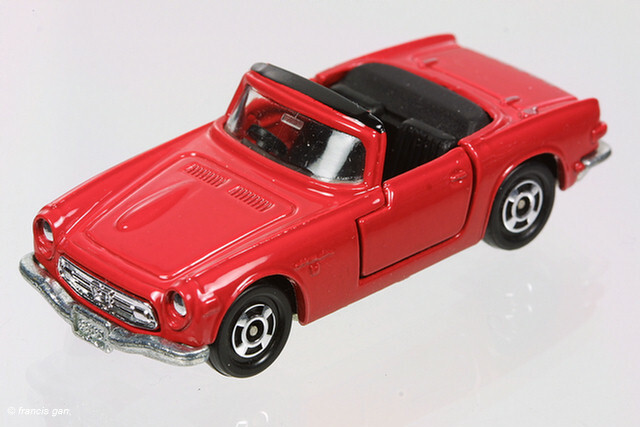 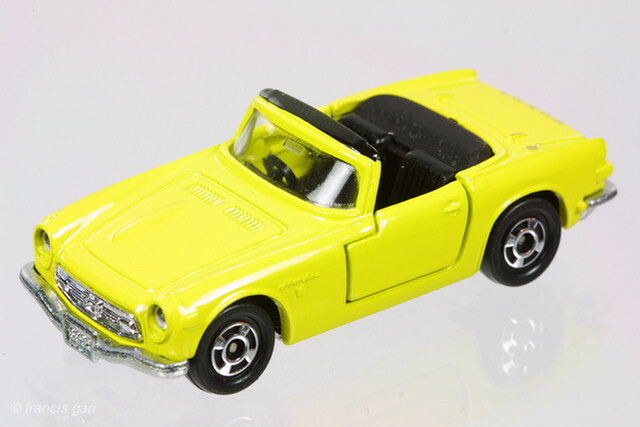 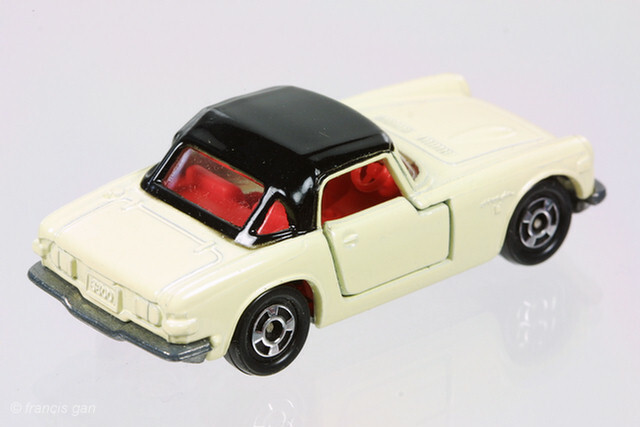 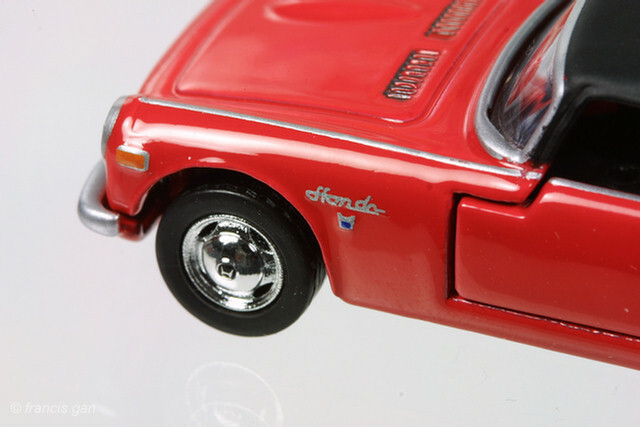 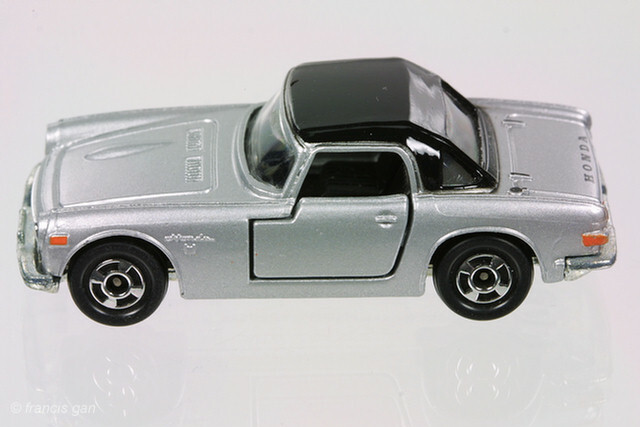 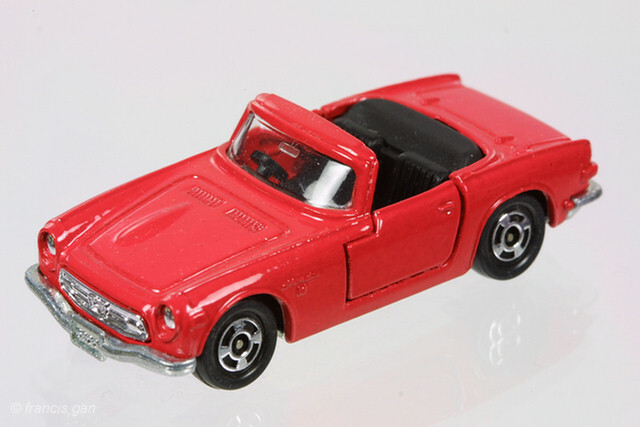 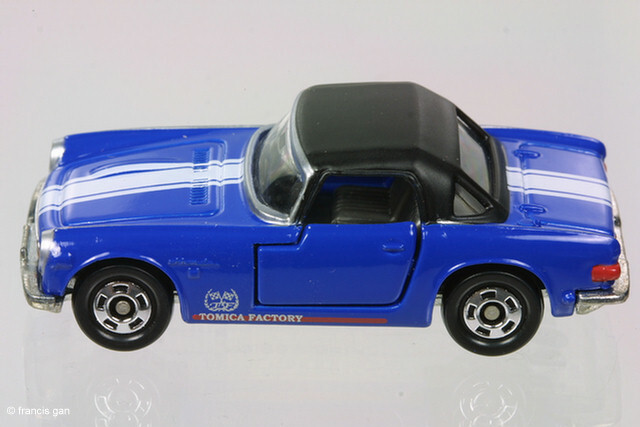 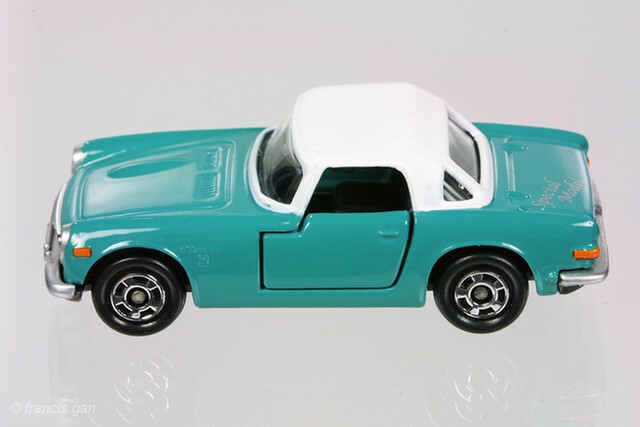 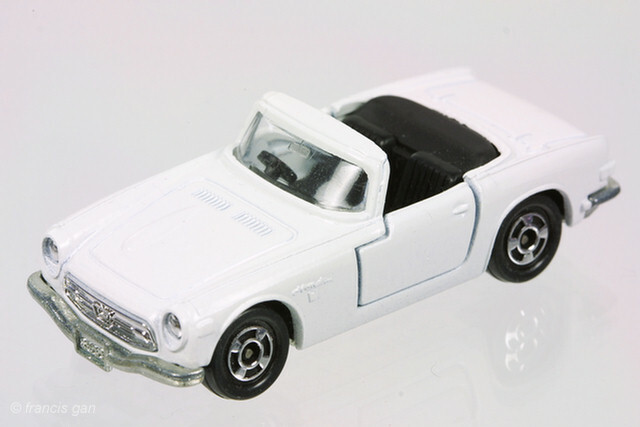 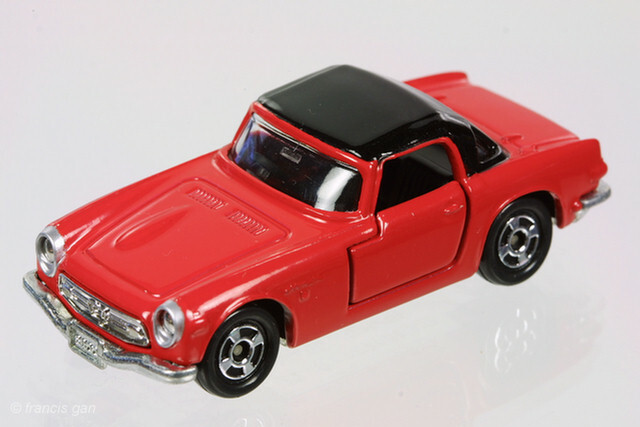 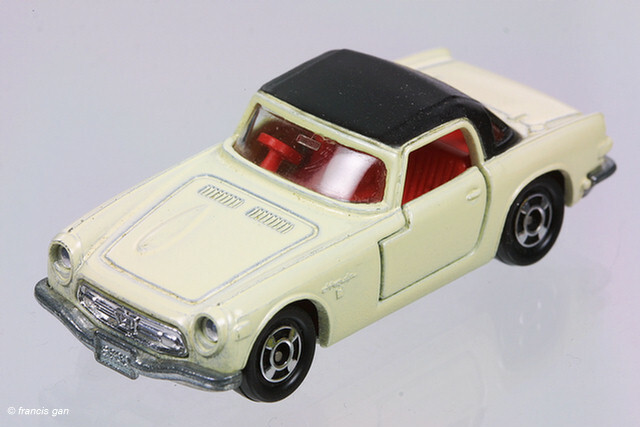 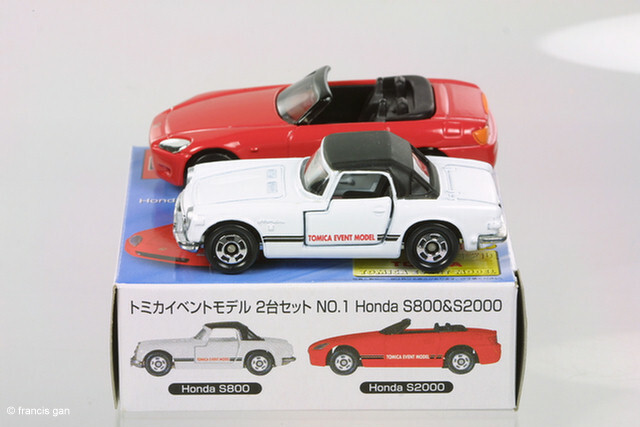 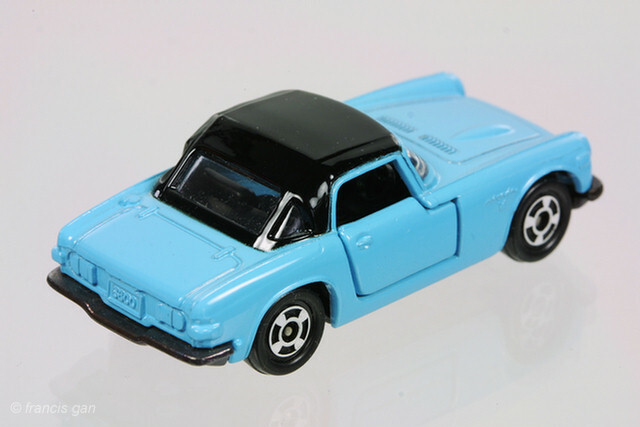 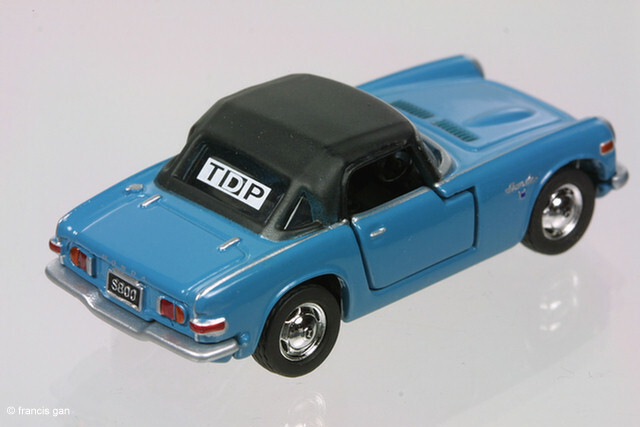 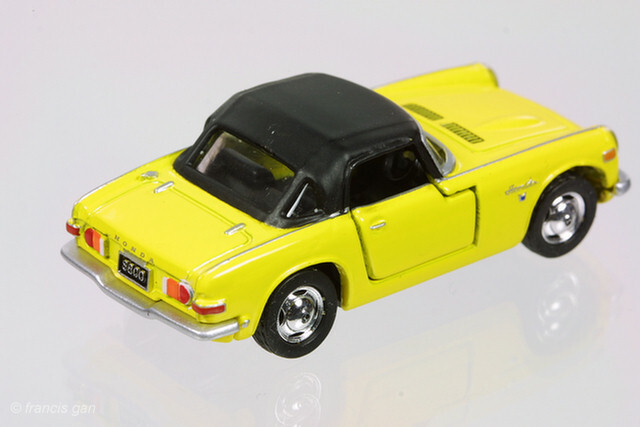 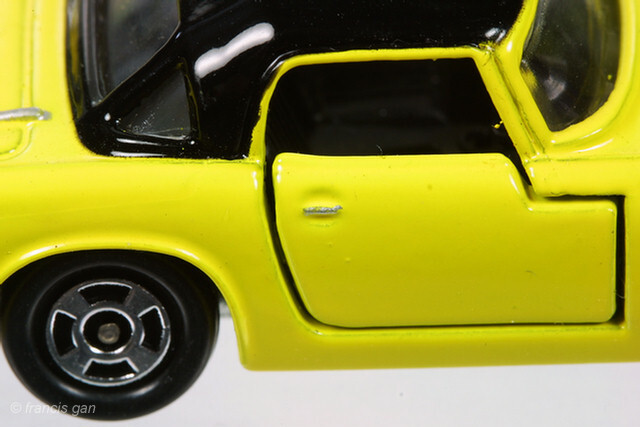 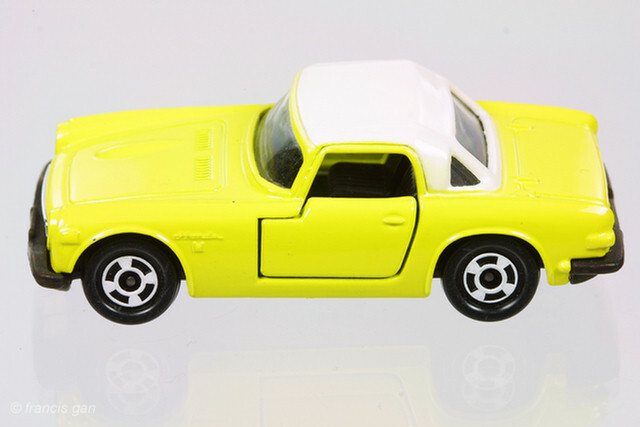 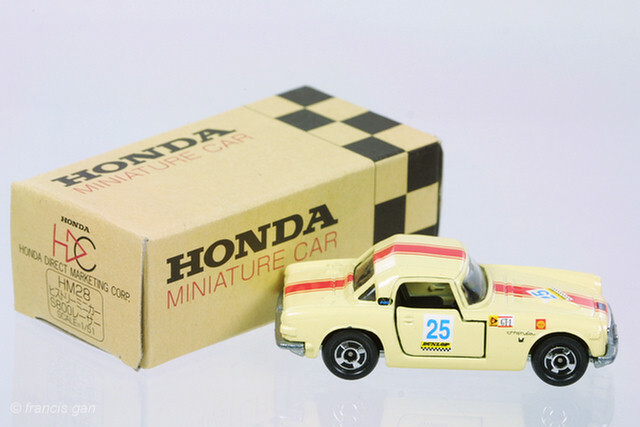 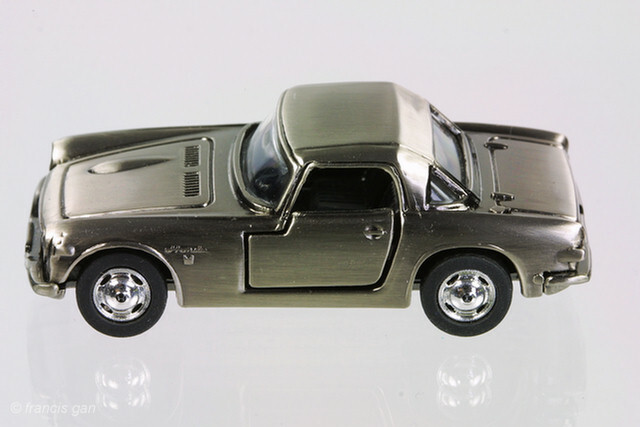 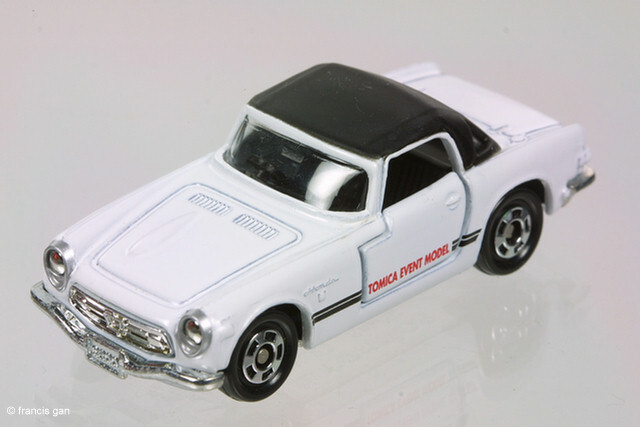 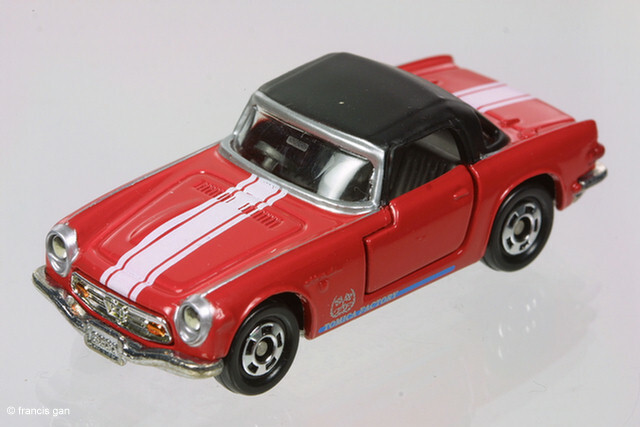 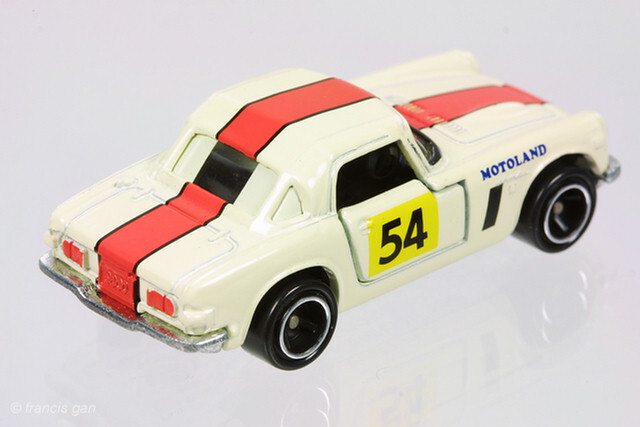 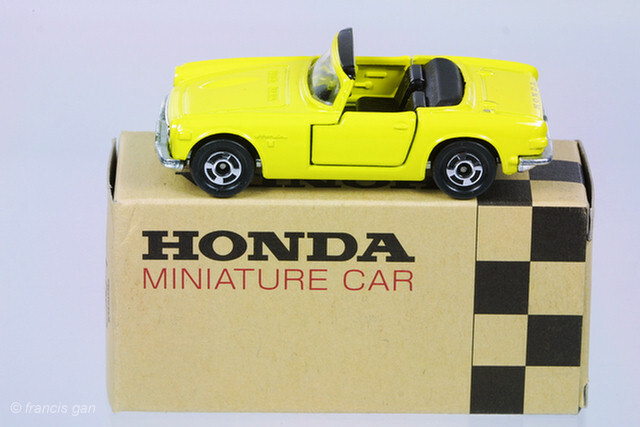 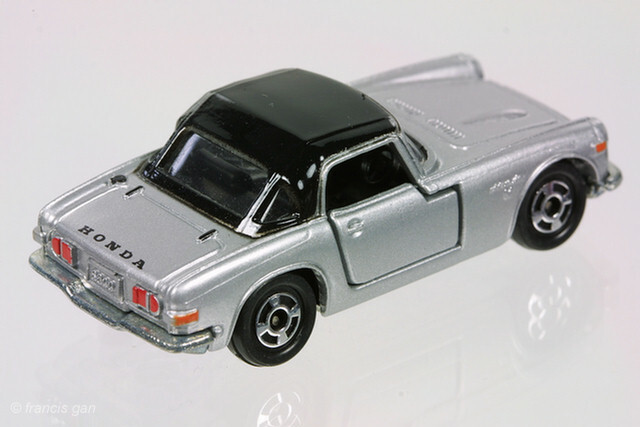 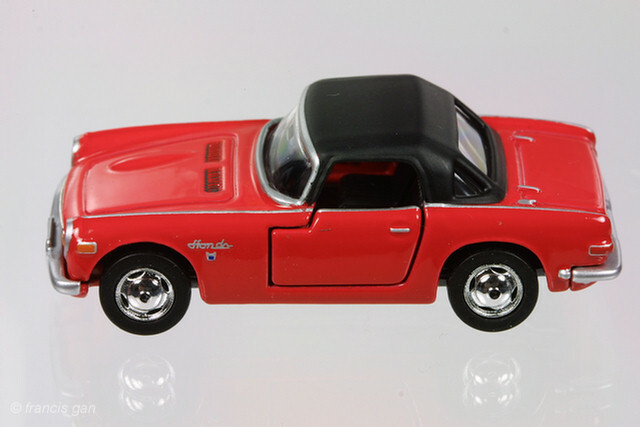 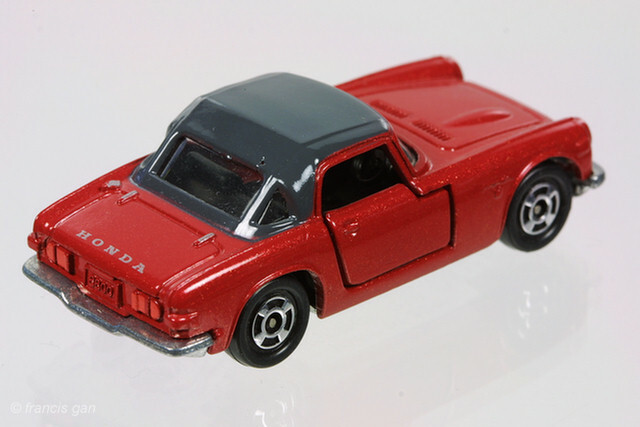 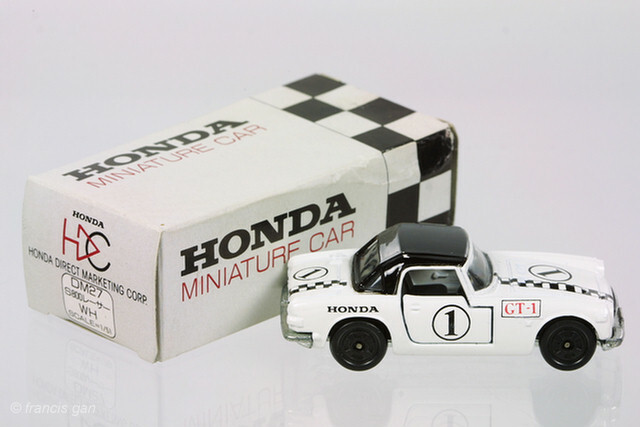 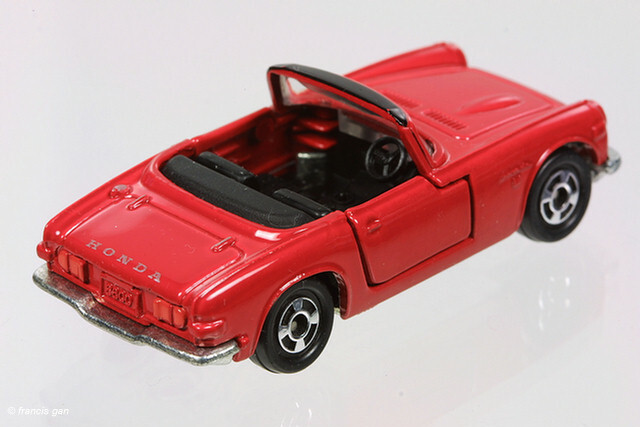 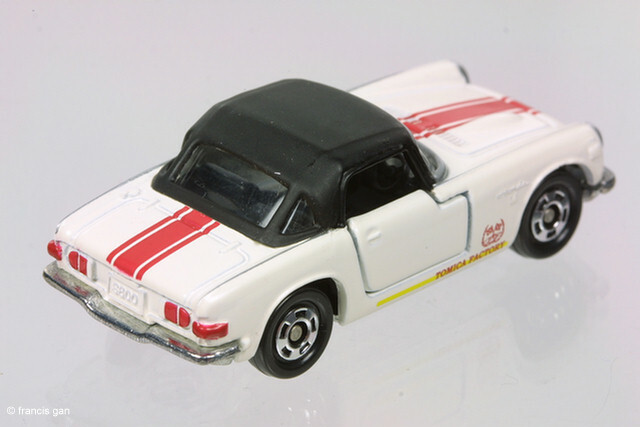 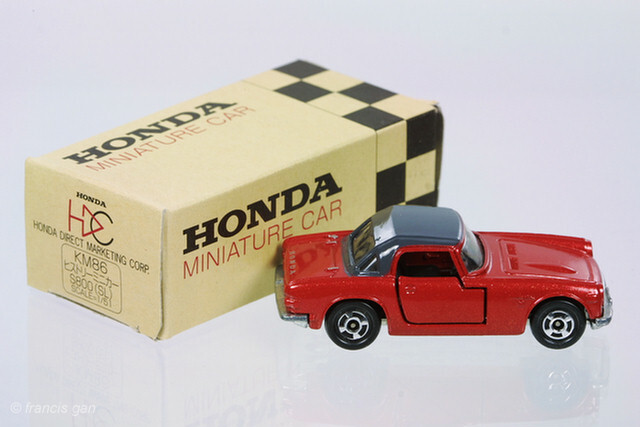 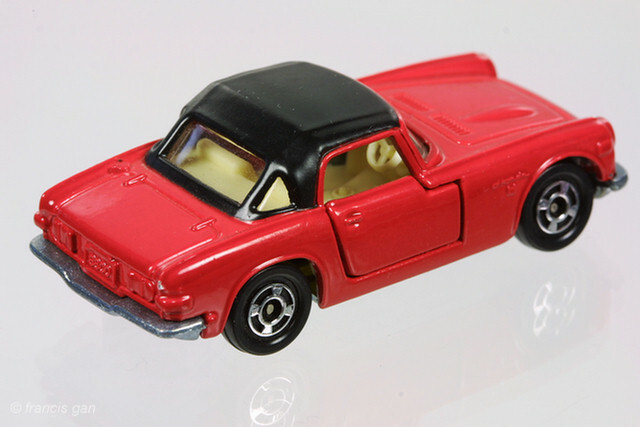 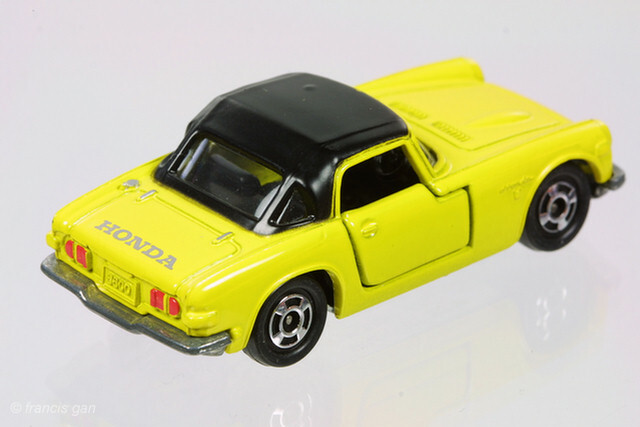 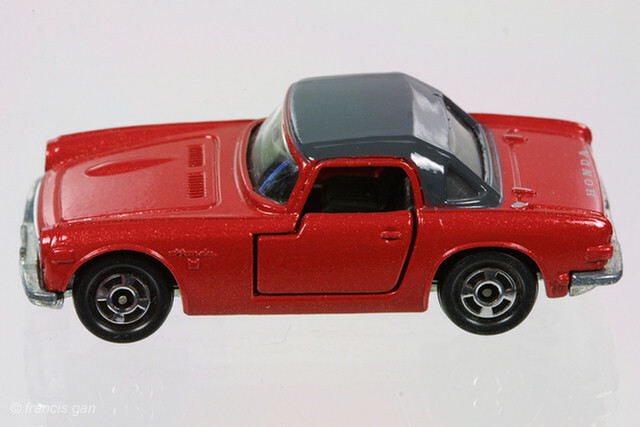 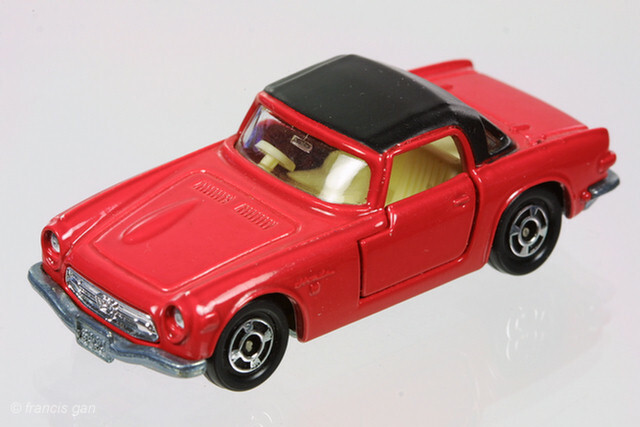 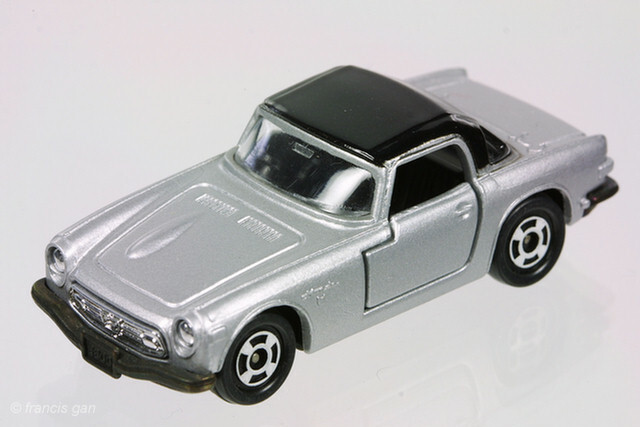 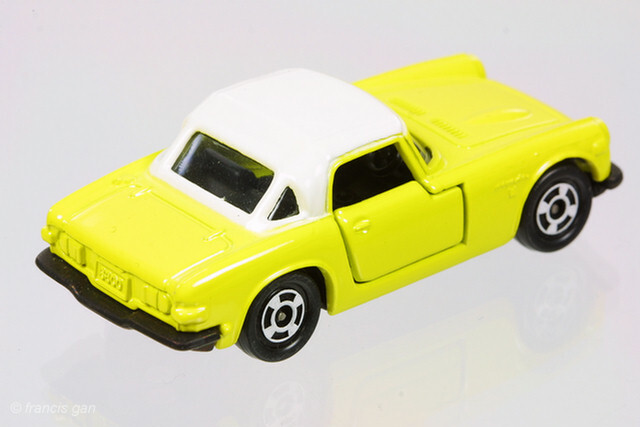 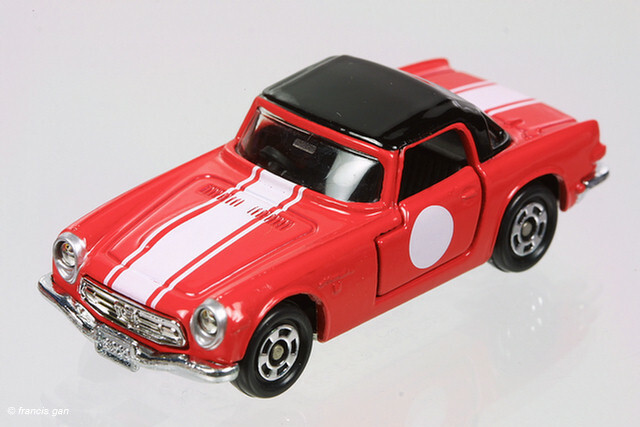 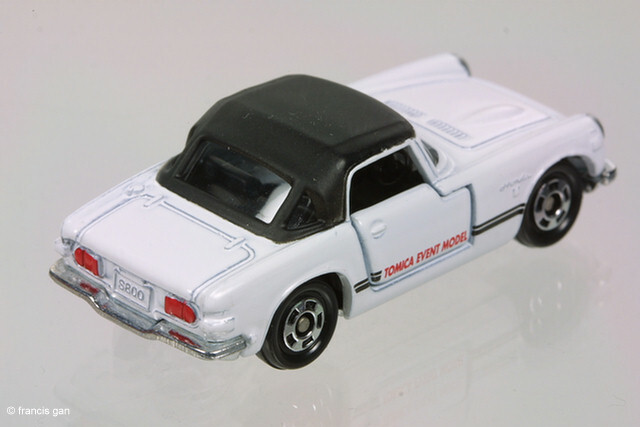 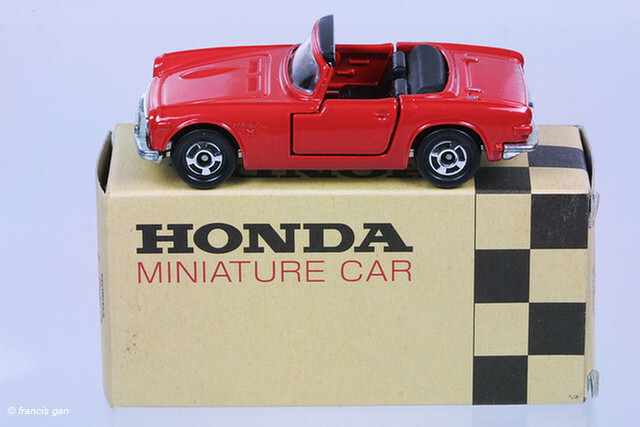 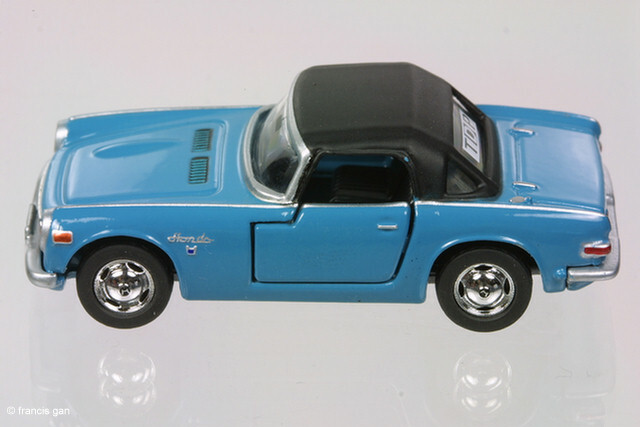 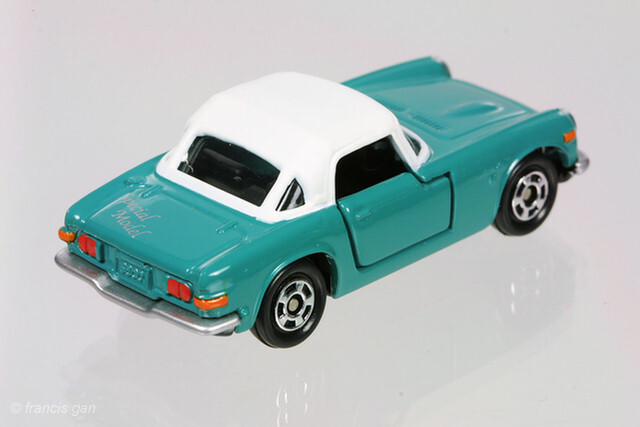 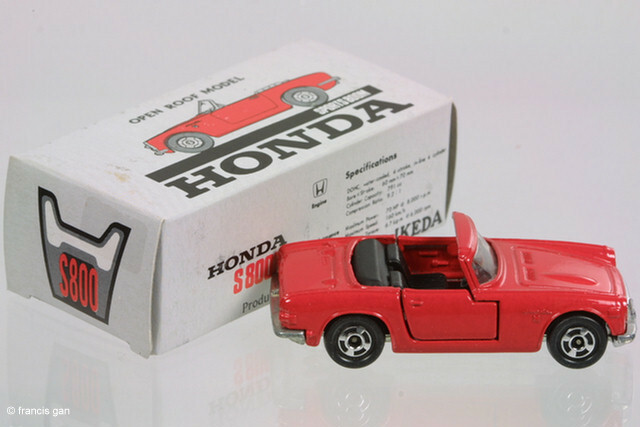 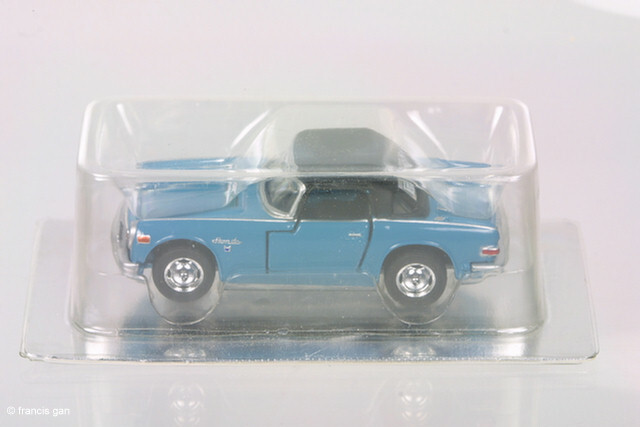 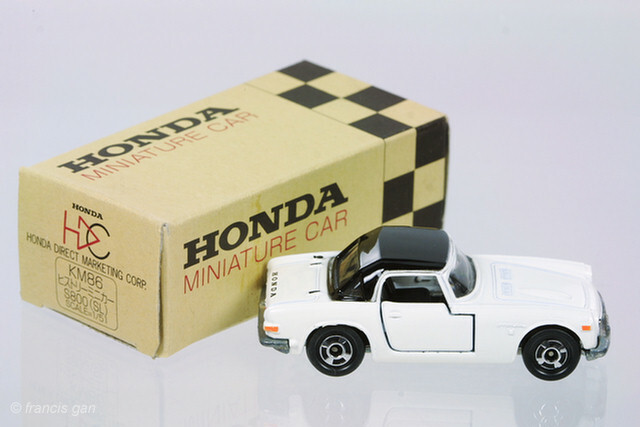 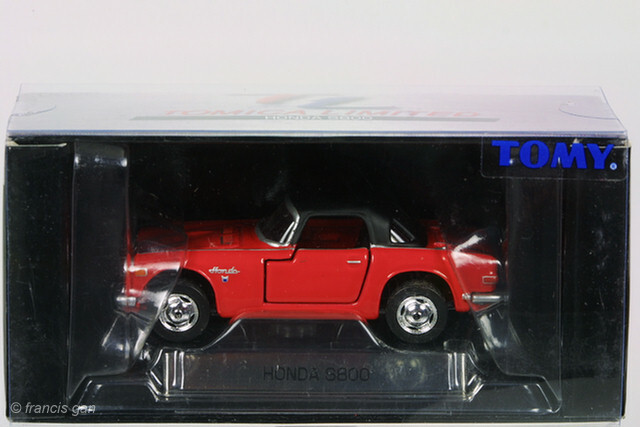 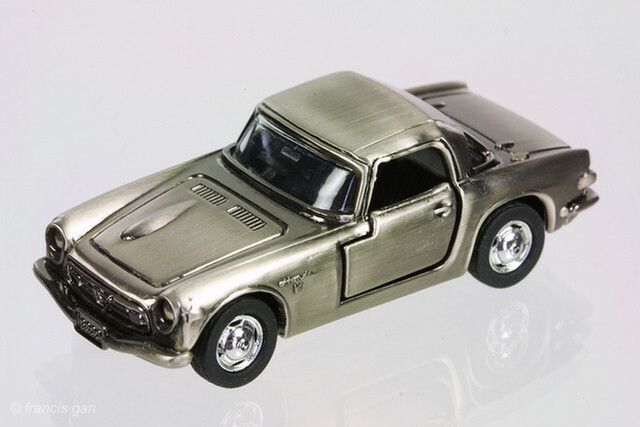 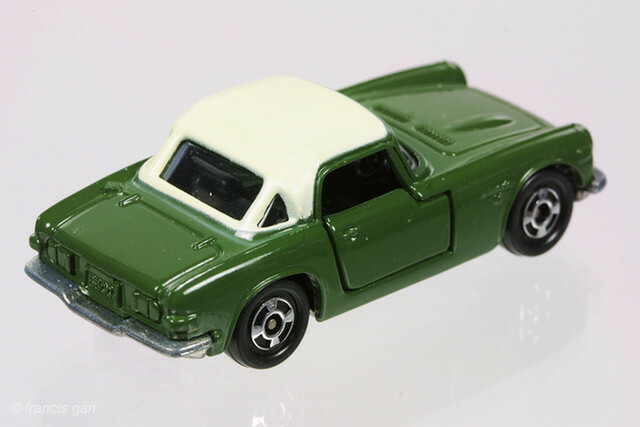 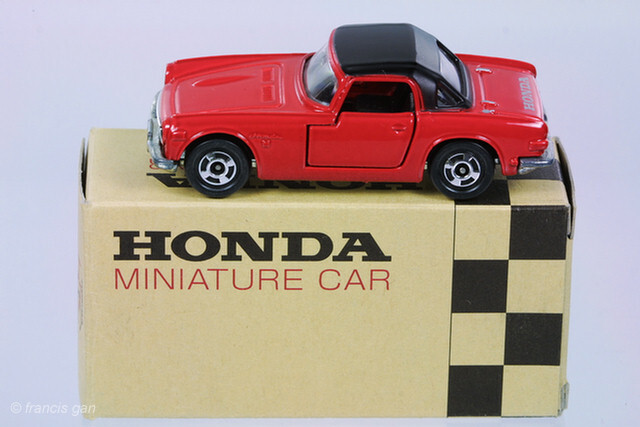 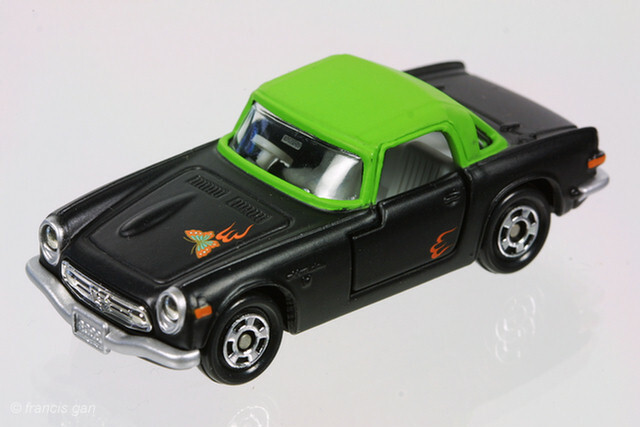 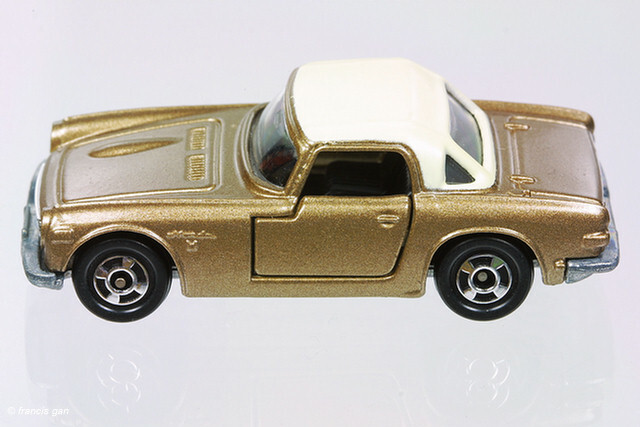 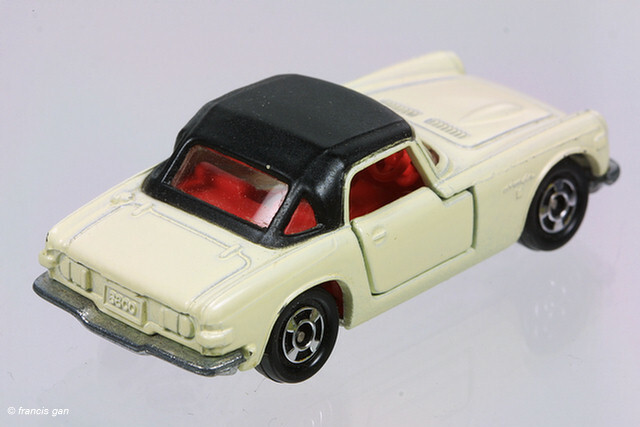 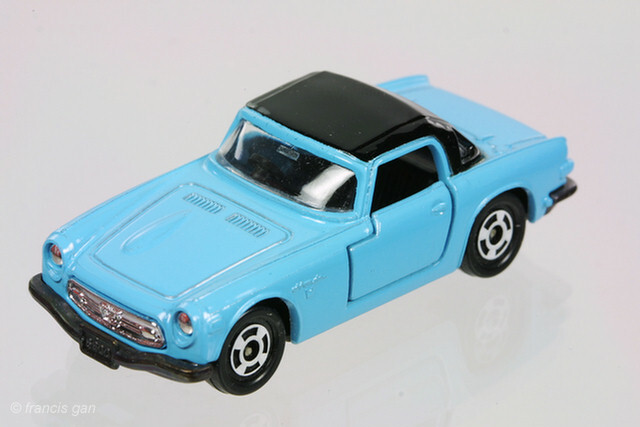 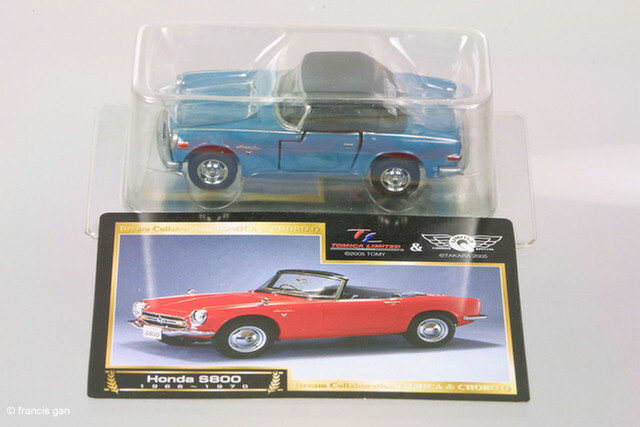 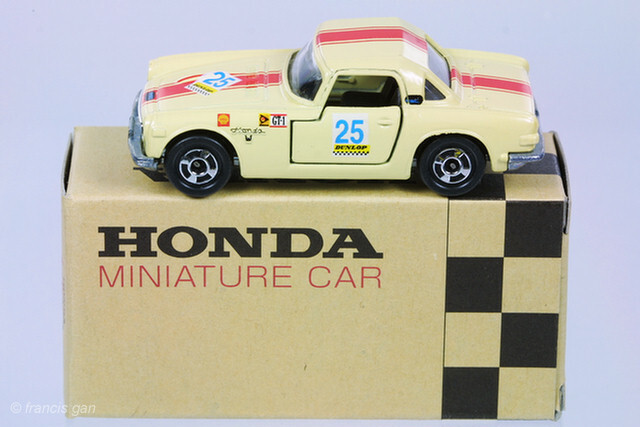 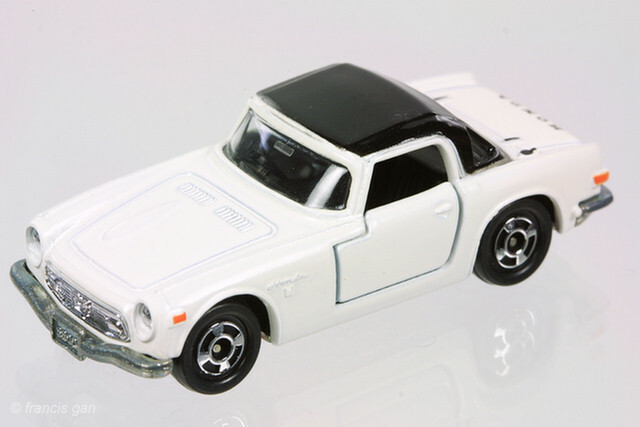 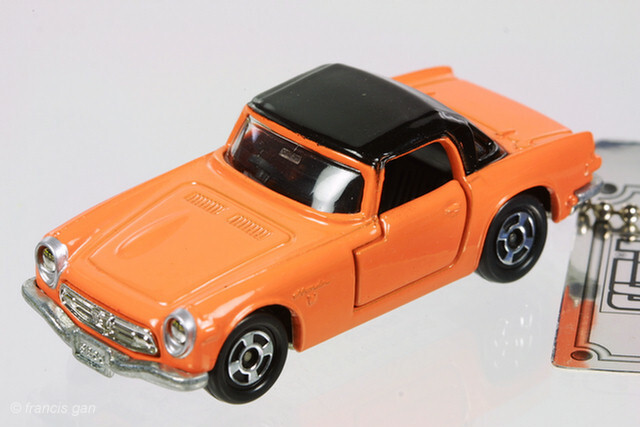 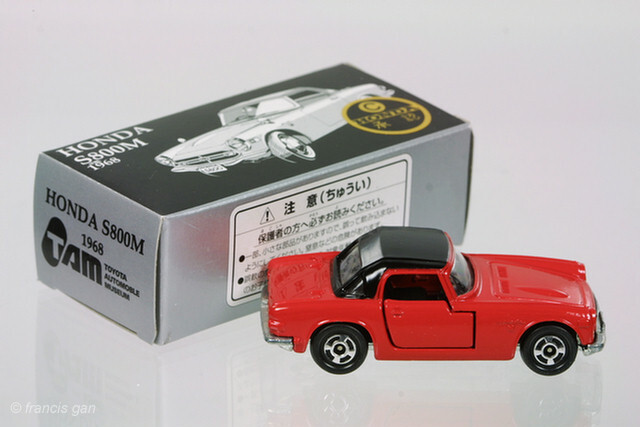 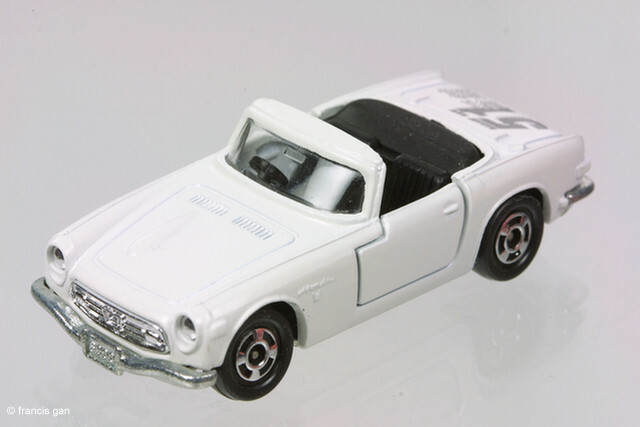 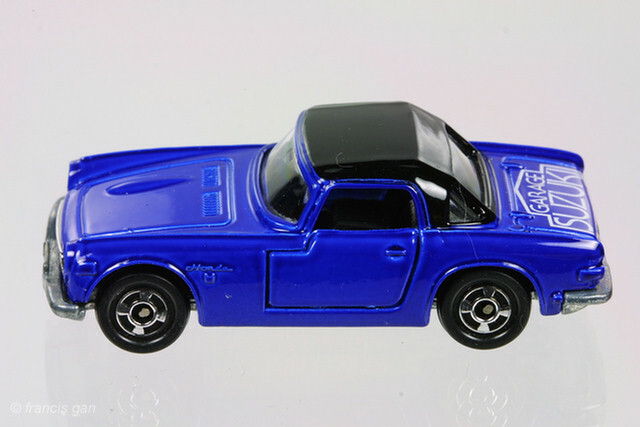 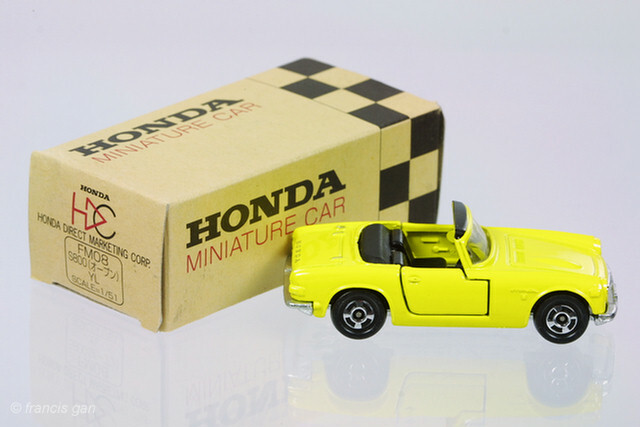 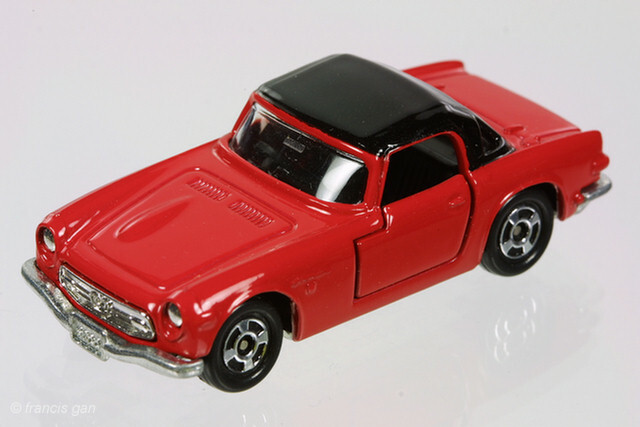 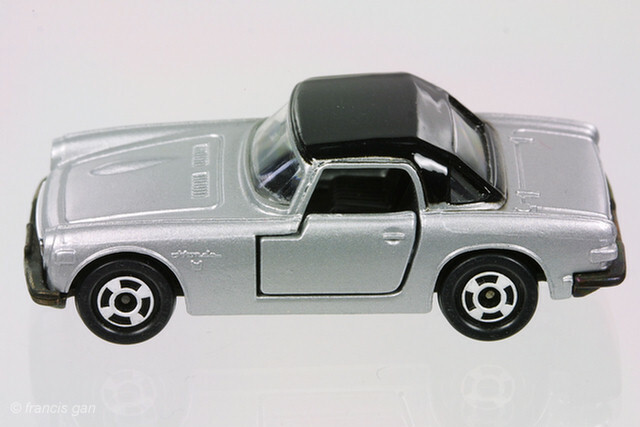 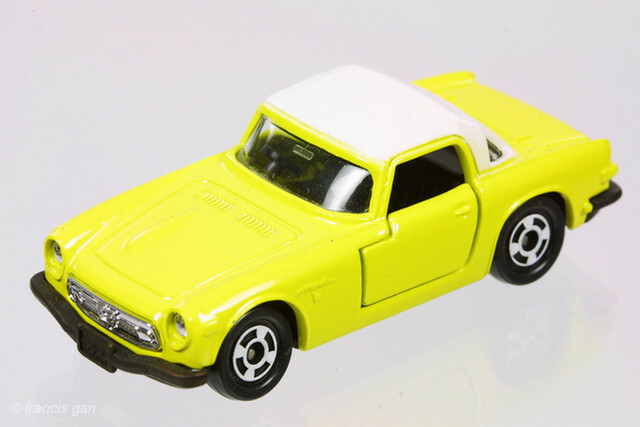 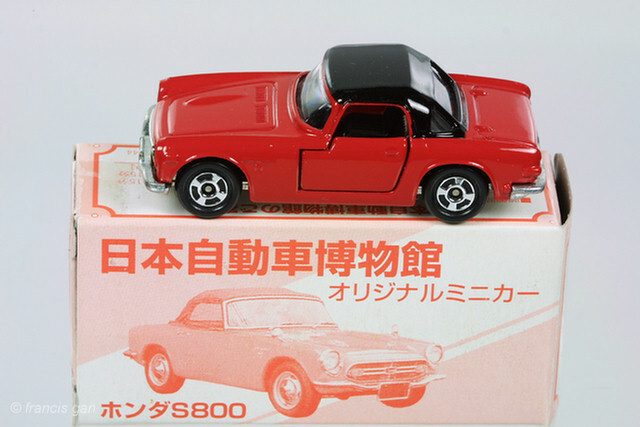 There must be dozens of variations of this 1/59 scale model of the Honda S800M roadster. 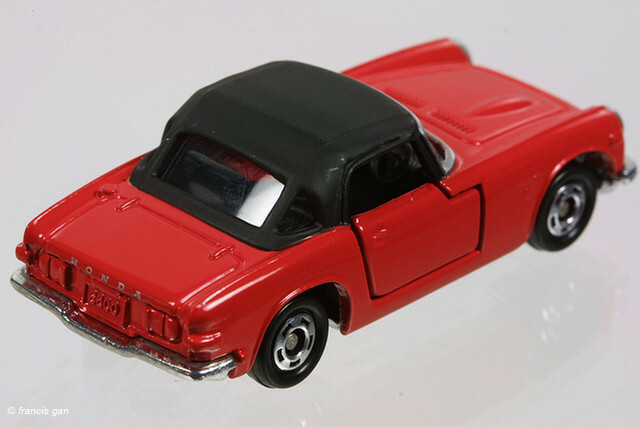 The most major variation is whether the convertible top is up or down. 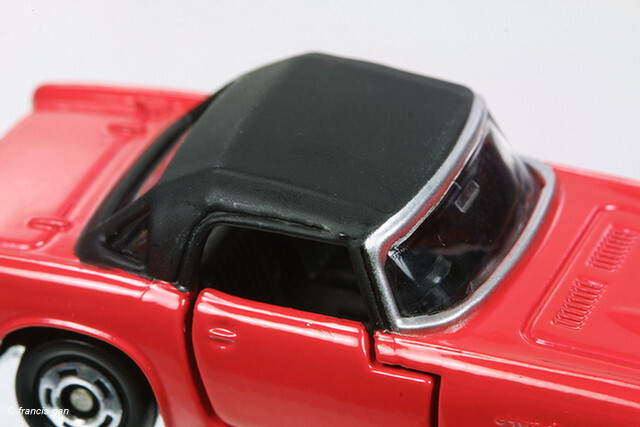 In the models with the top down, the windshield header has the accessory wind blocker cast into the windshield header - painted black in most of the more recent top down models. 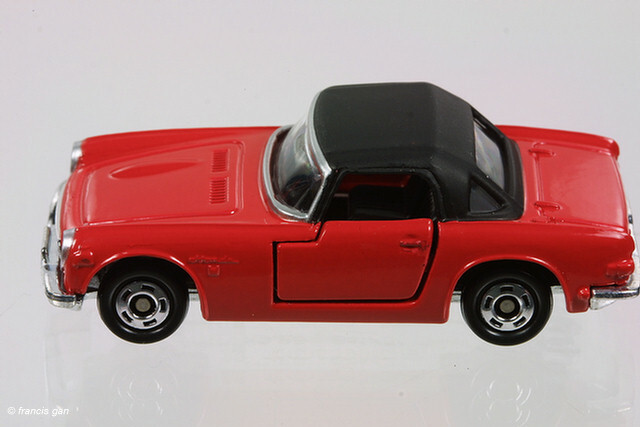 In the top up versions, the convertible top is of the 3 part window type. 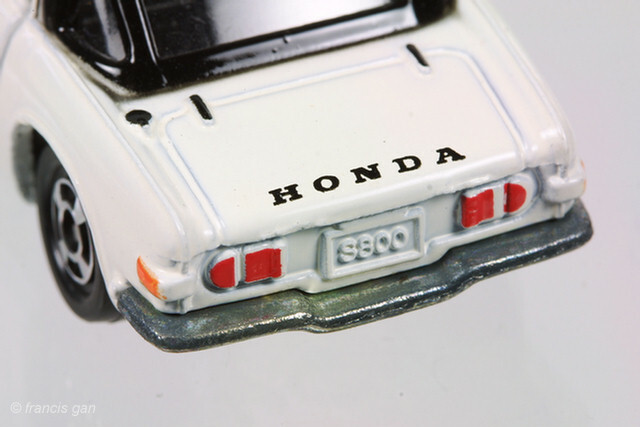 In the most detailed variations, the headlight trim rings are painted silver, the side and rear marker lights are painted orange and "HONDA" in stenciled on the trunk lid. 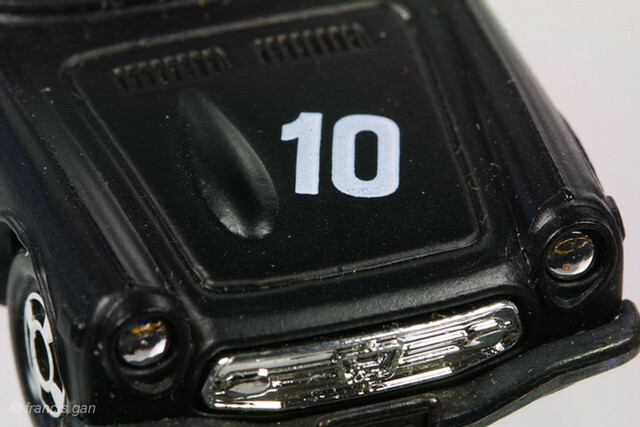 Some models have some of these features - in combination or standalone. 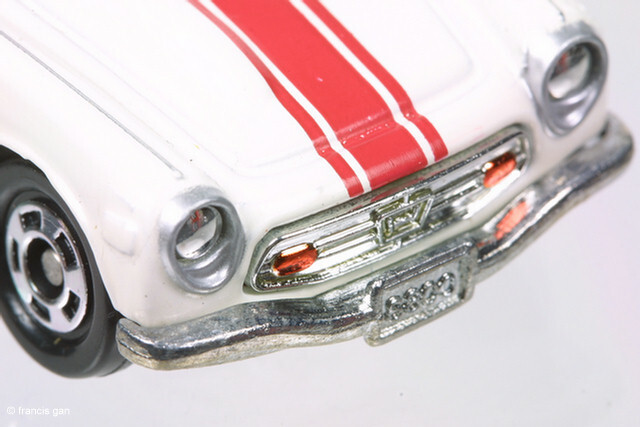 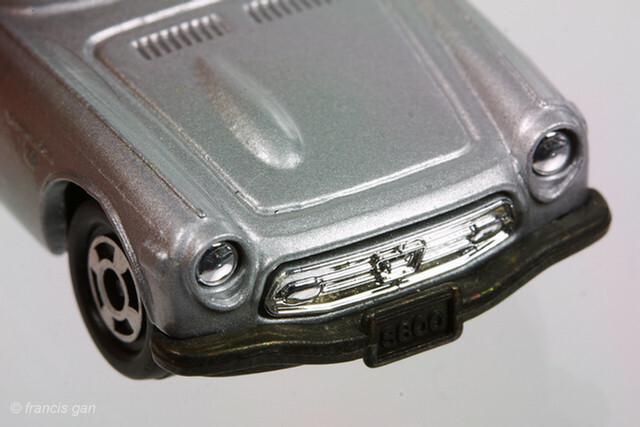 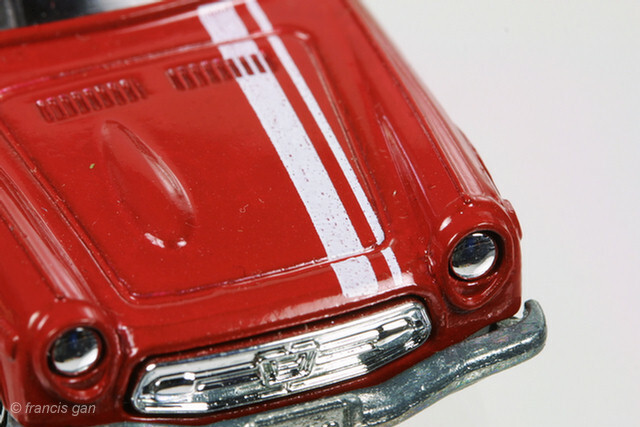 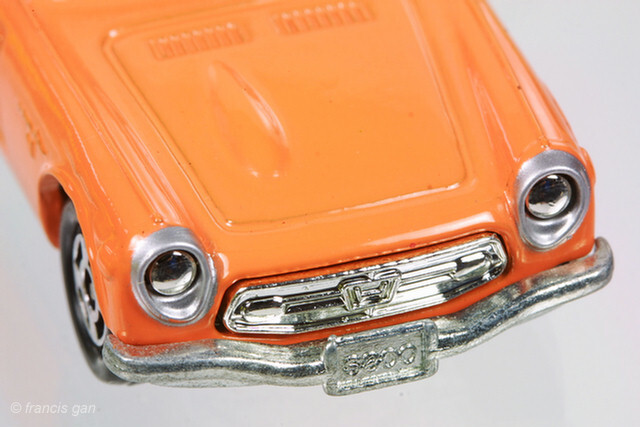 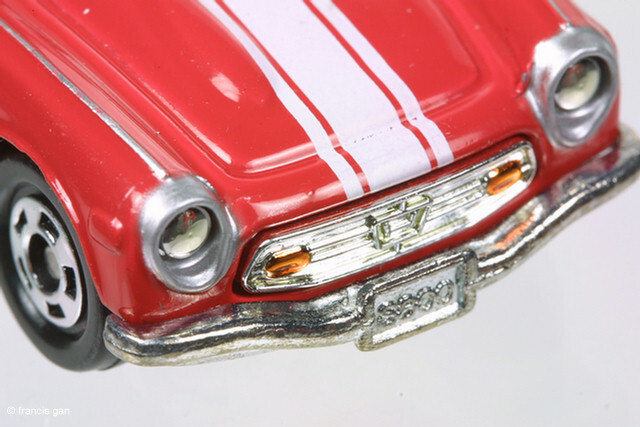 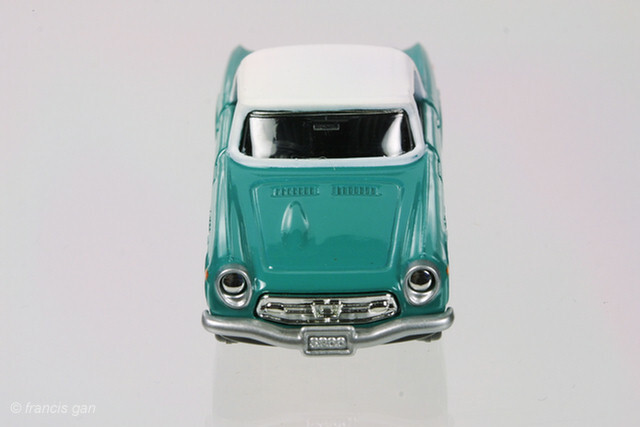 Most models have chrome grille and headlights - which are really the same plastic casting. 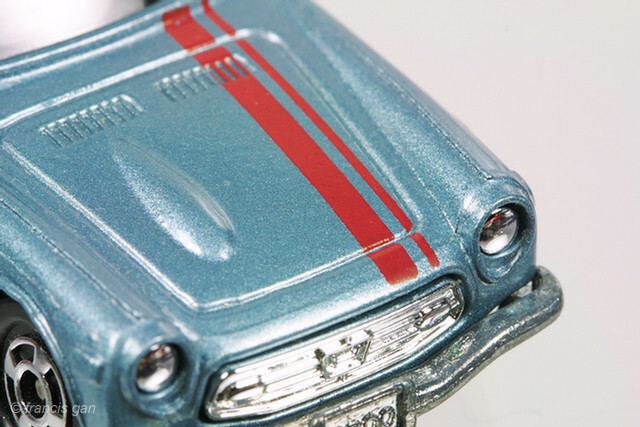 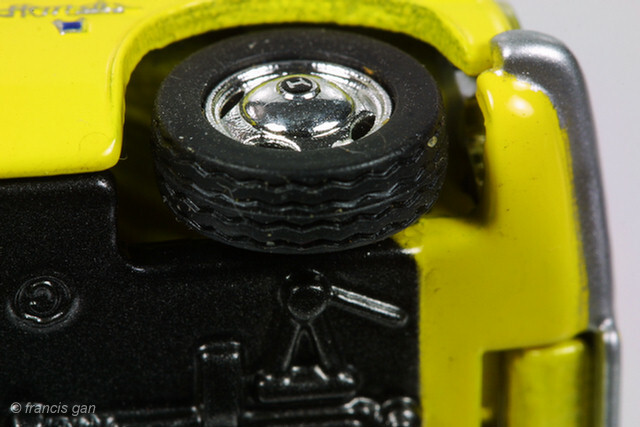 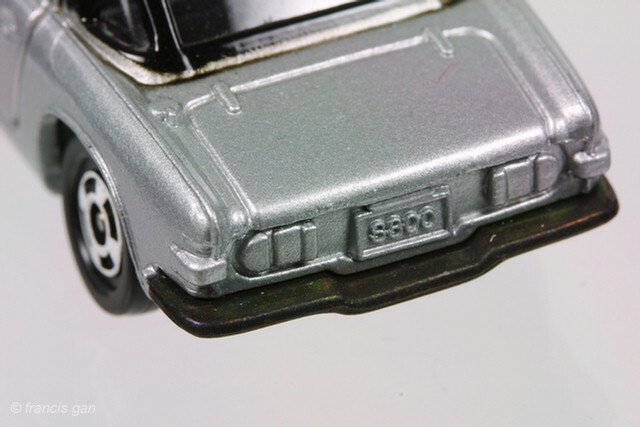 The details are more likely to appear on the more recently manufactured cars. 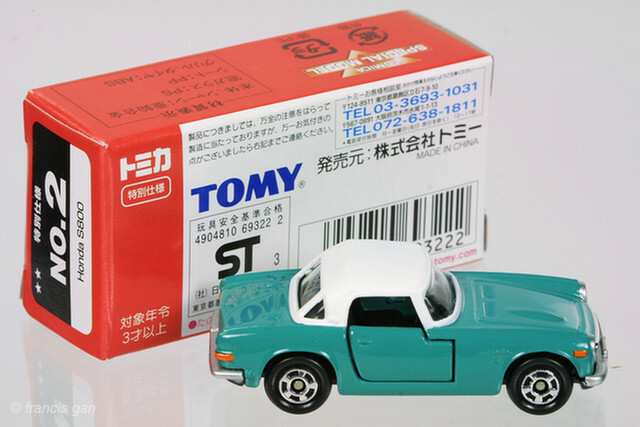 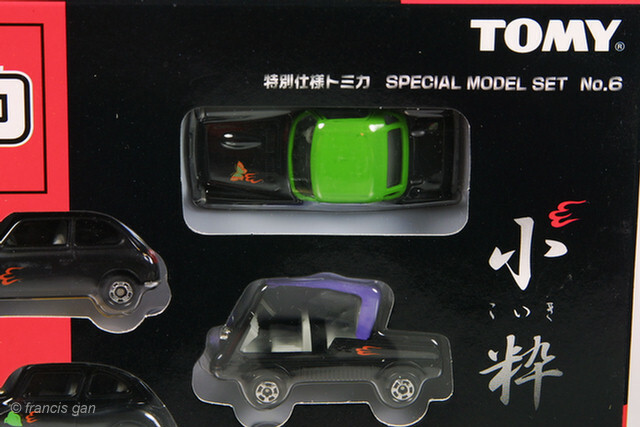 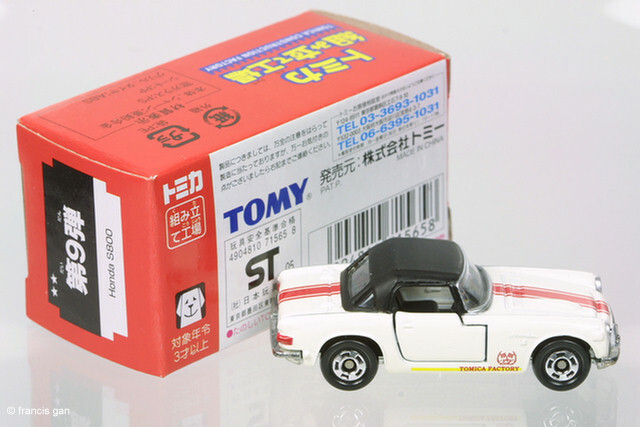 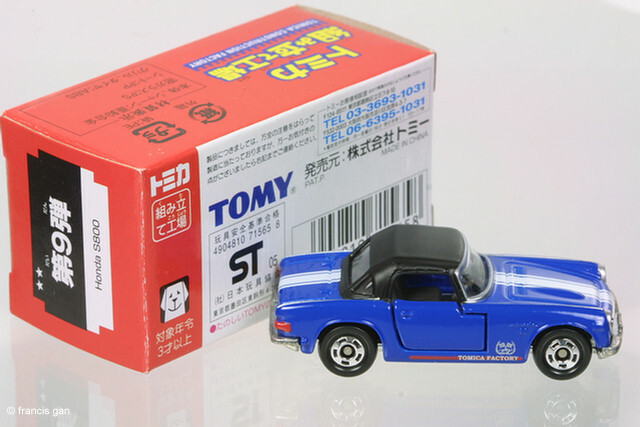 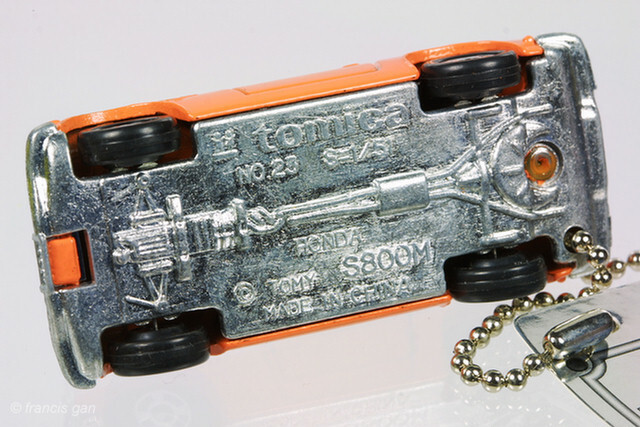 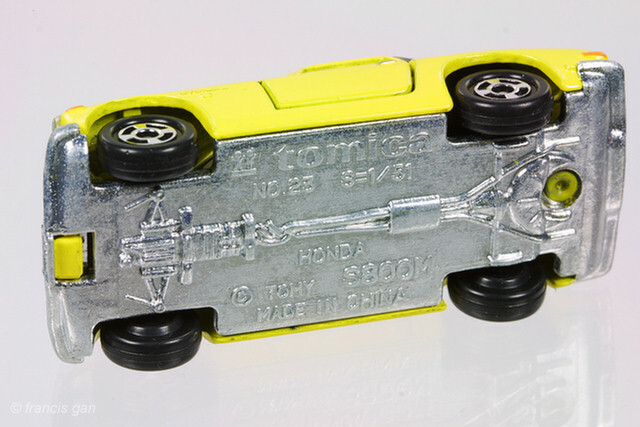 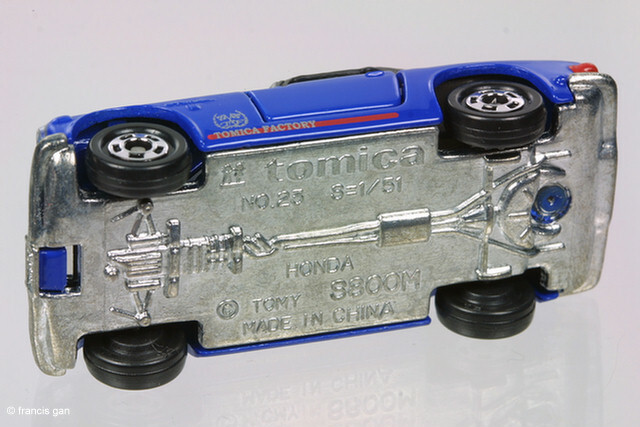 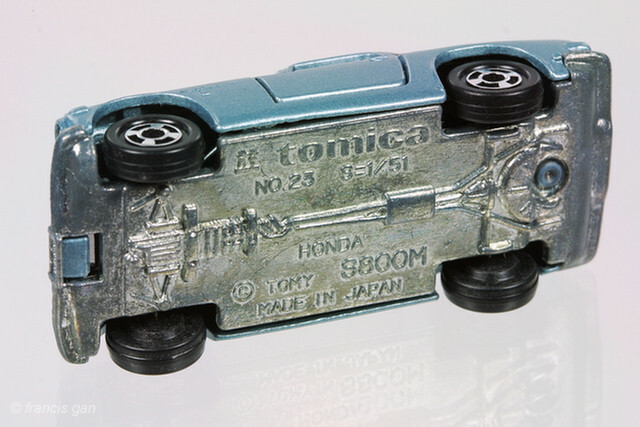 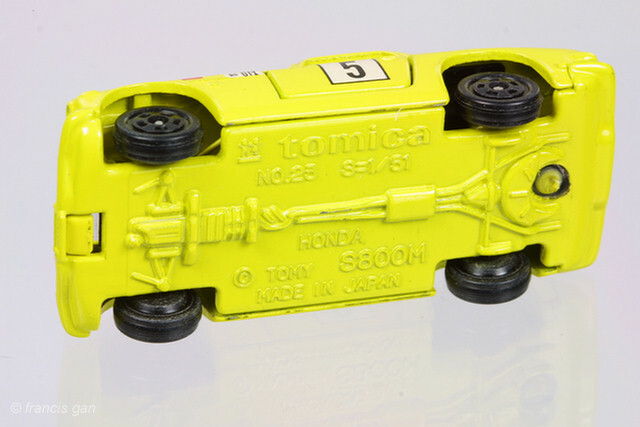 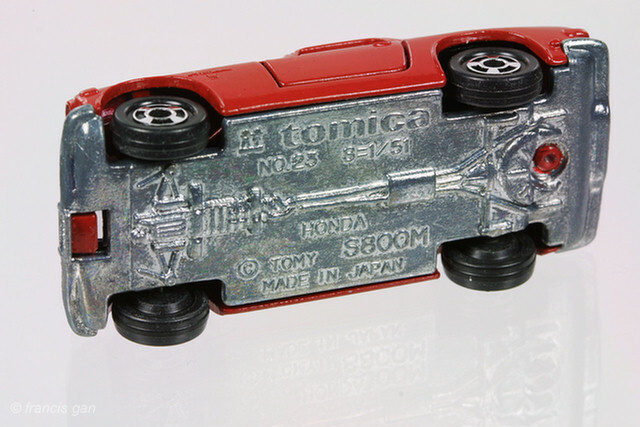 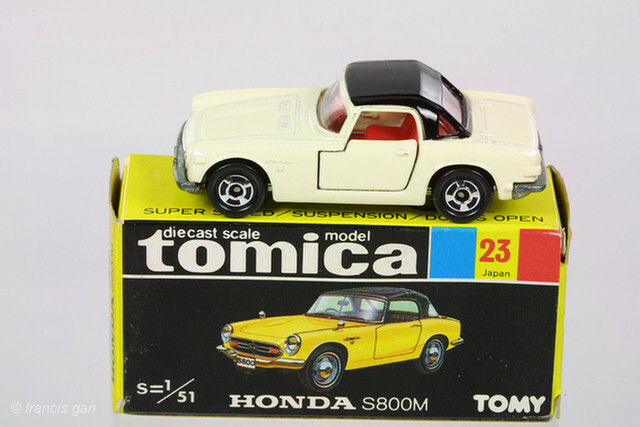 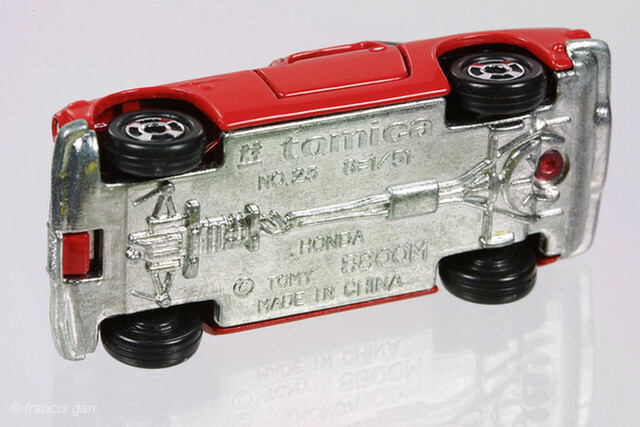 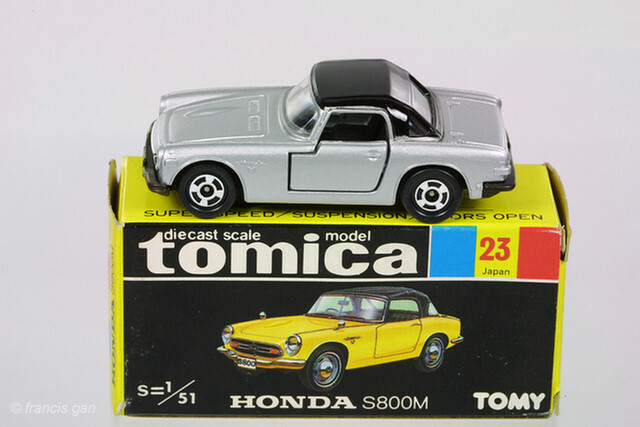 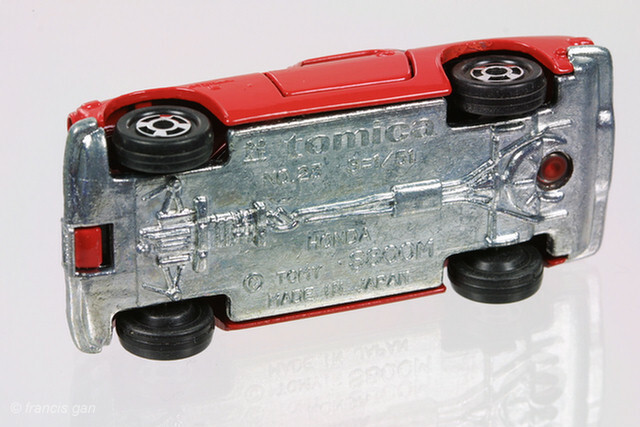 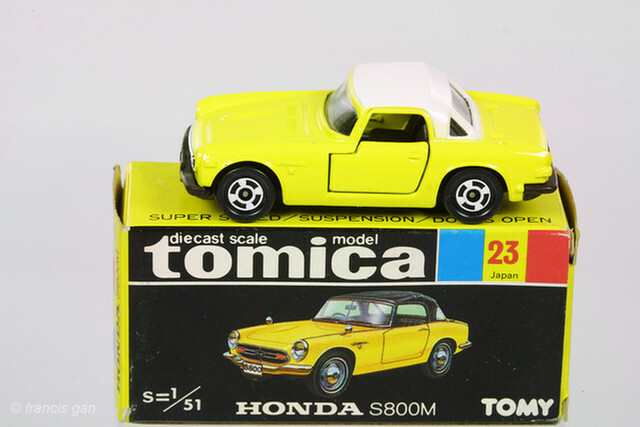 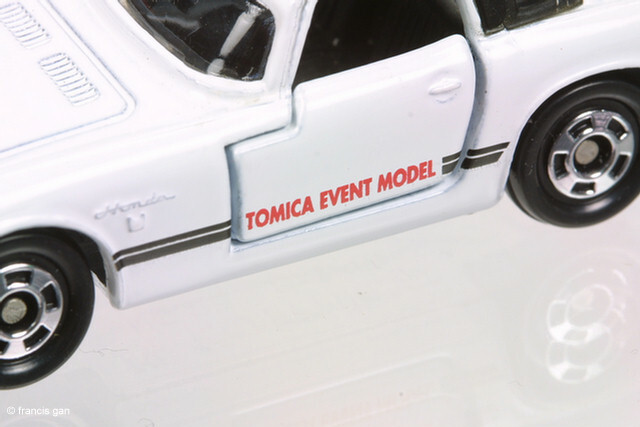 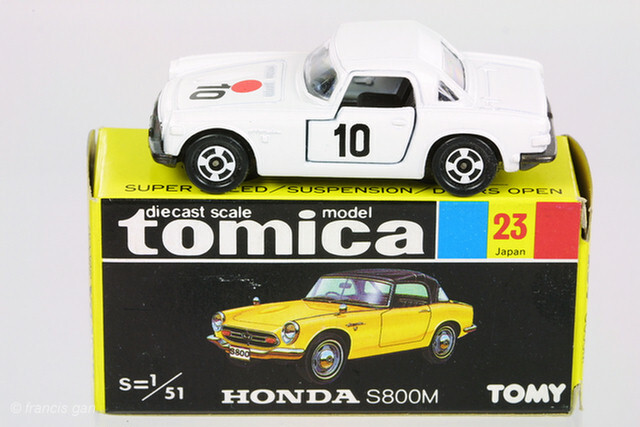 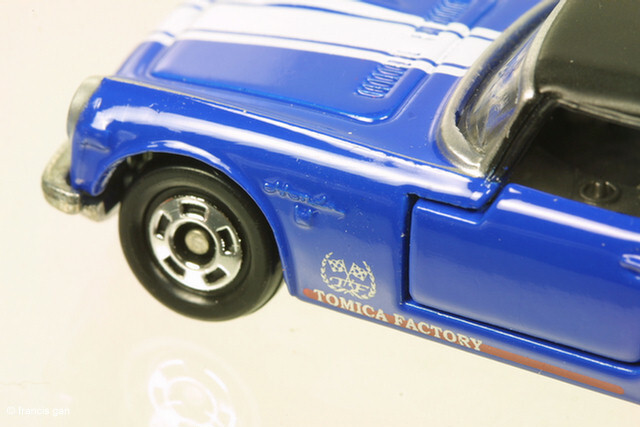 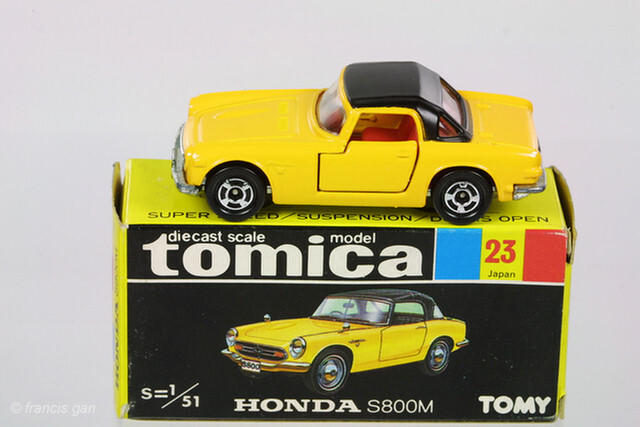 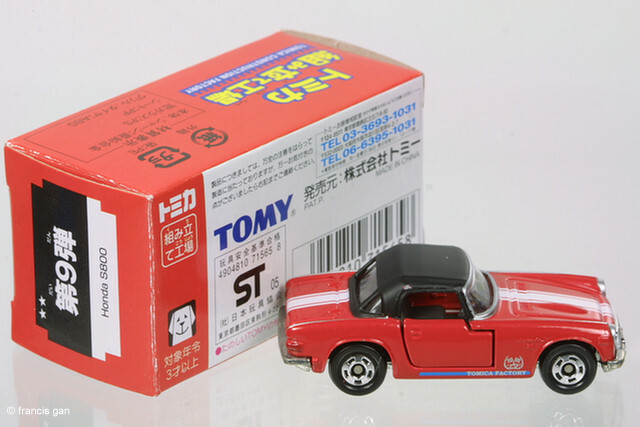 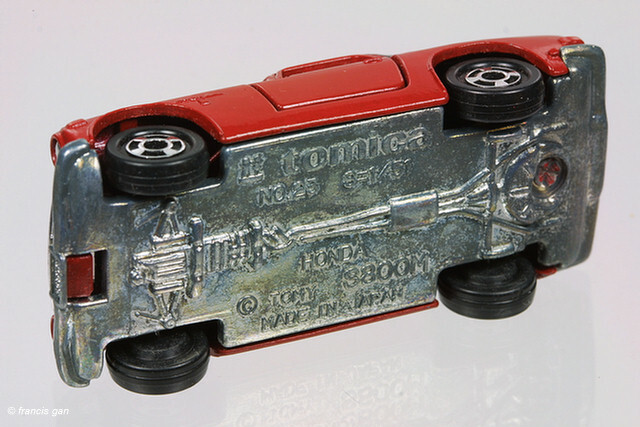 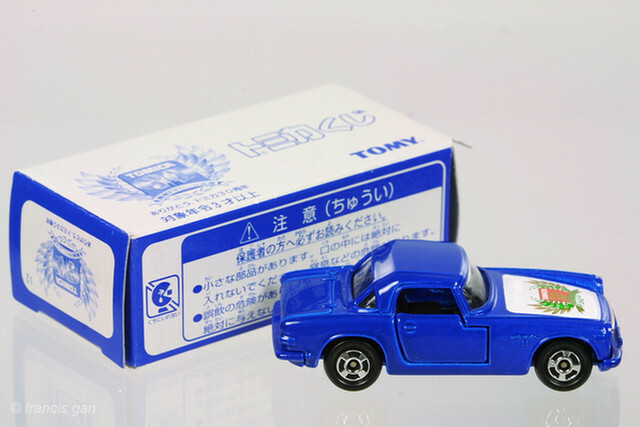 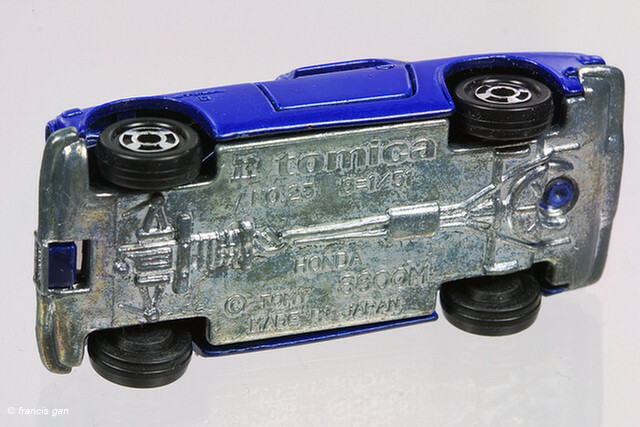 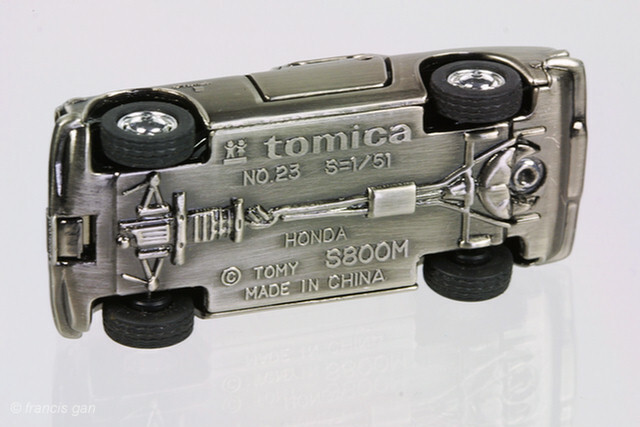 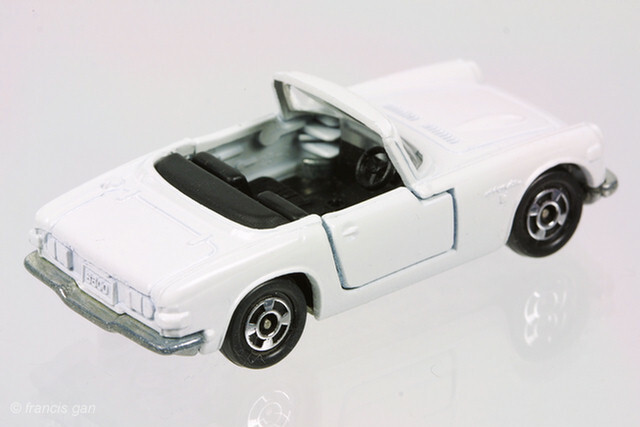 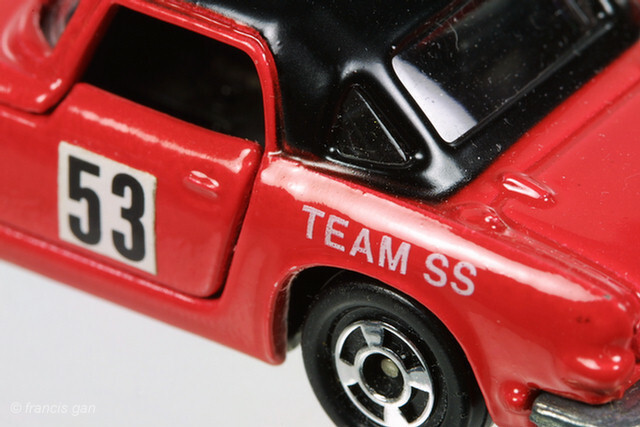 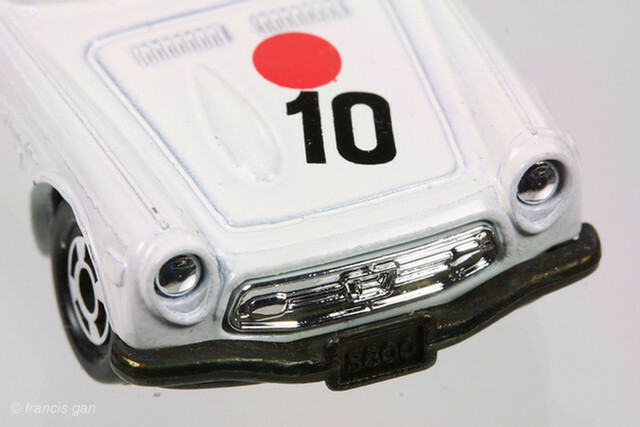 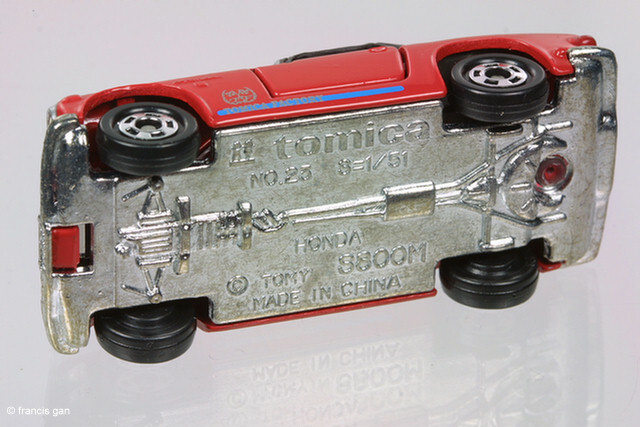 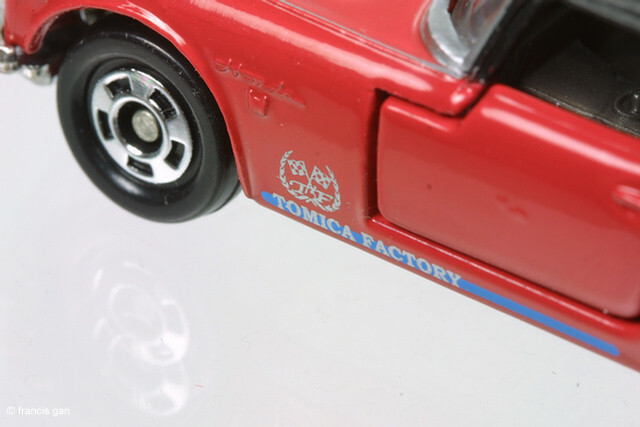 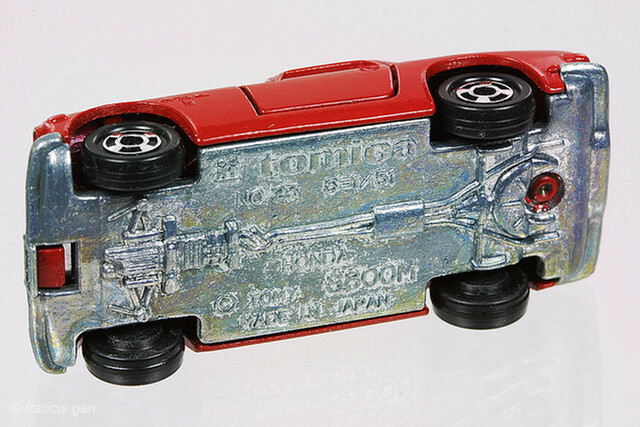 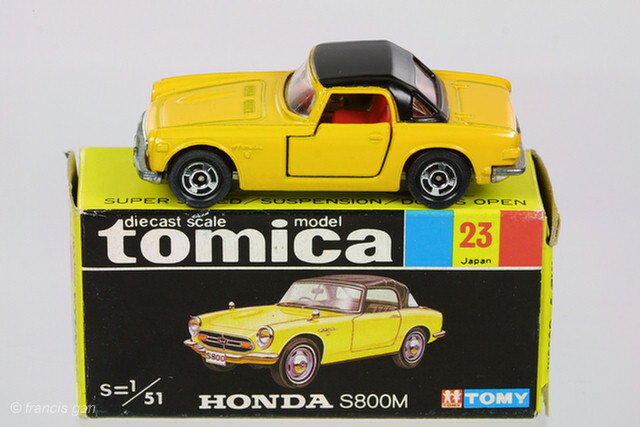 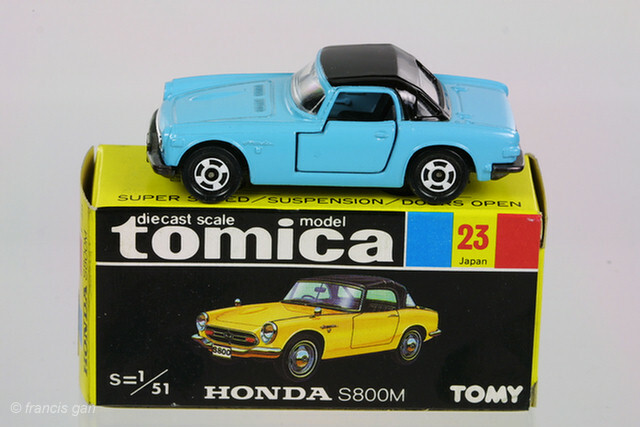 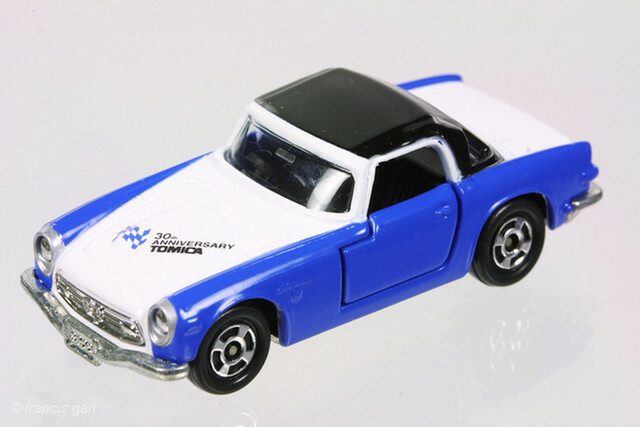 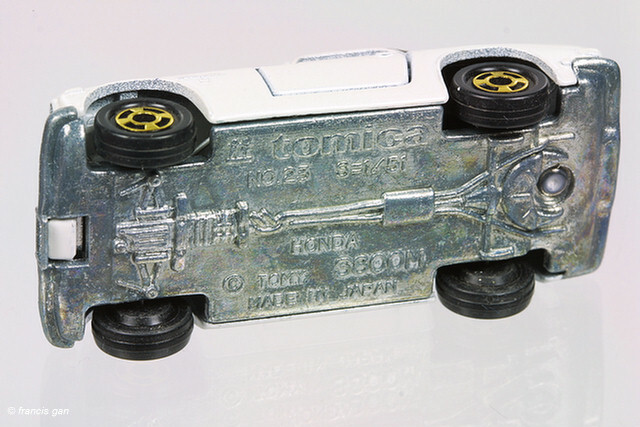 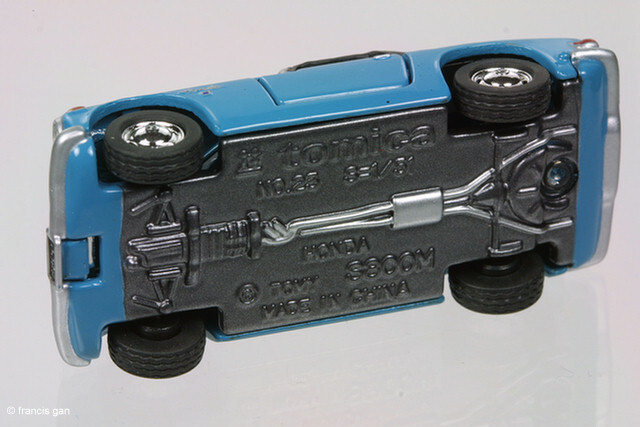 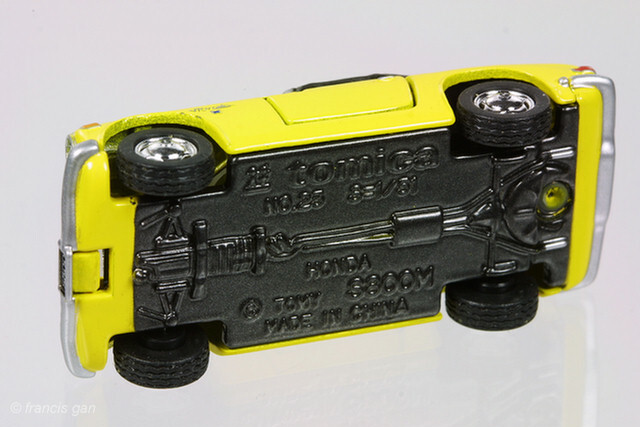 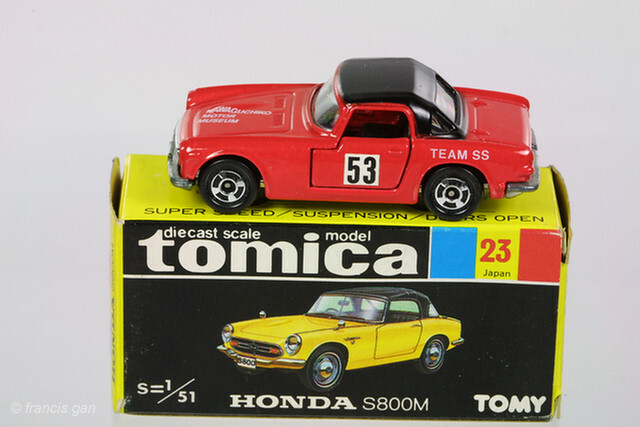 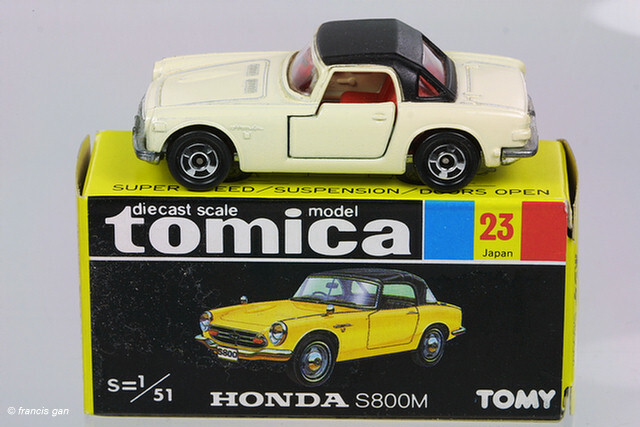 The Tomica S800Ms are either made in China or Japan - with no discernable differences in the casting, finish or level of detail. 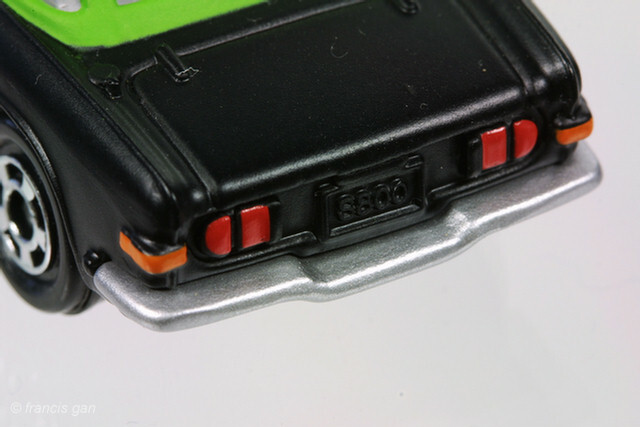 Interestingly, some of the S800s have a black anodized base which means the bumpers are also black. 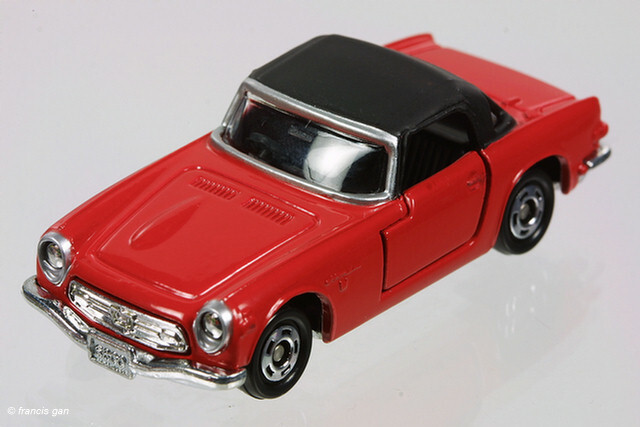 A cream colored S800 with a red interior and a glossy black roof. 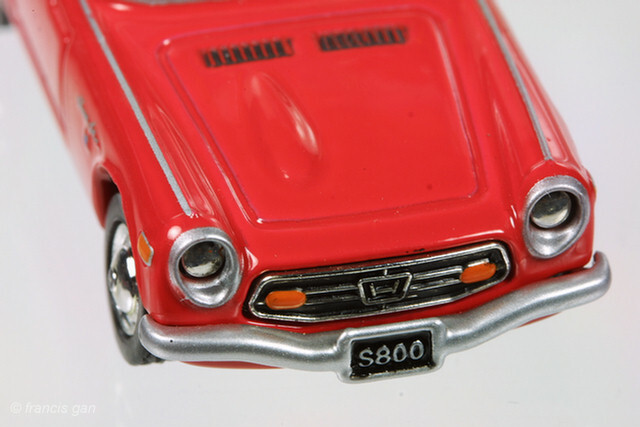 Made in Japan, the red interior and glossy black roofs are the earliest S800s to be produced. 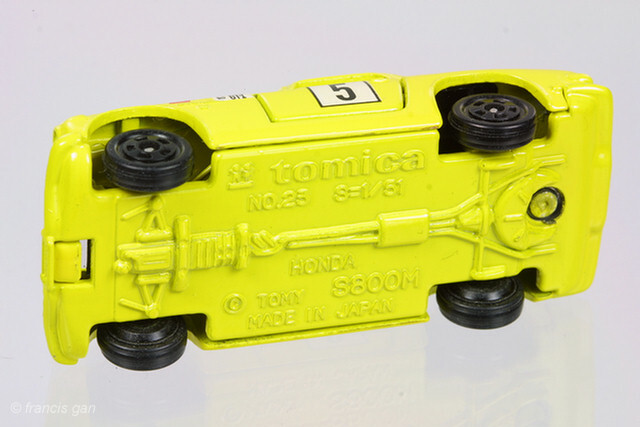 Typically, they came in T-29 black/yellow boxes. 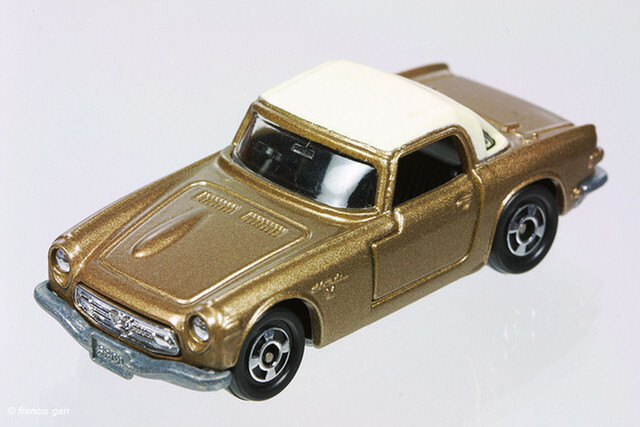 A tan colored racing S800 with a black interior and a body colored roof. 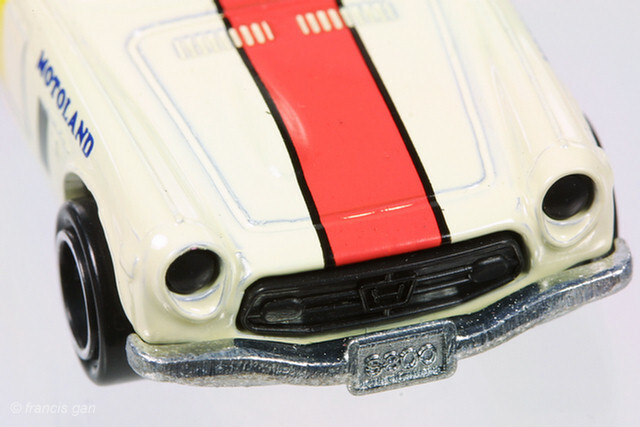 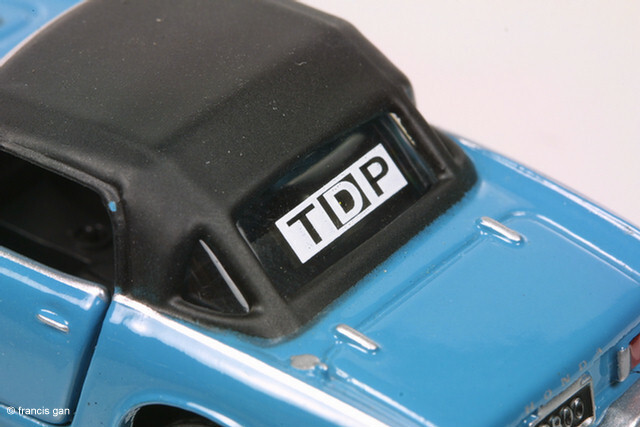 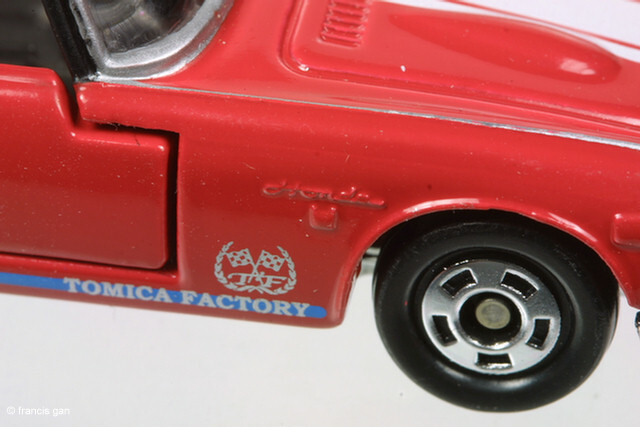 The tampoed markings are highly detailed including the "Honda" and "H" logos on the side of the fender. 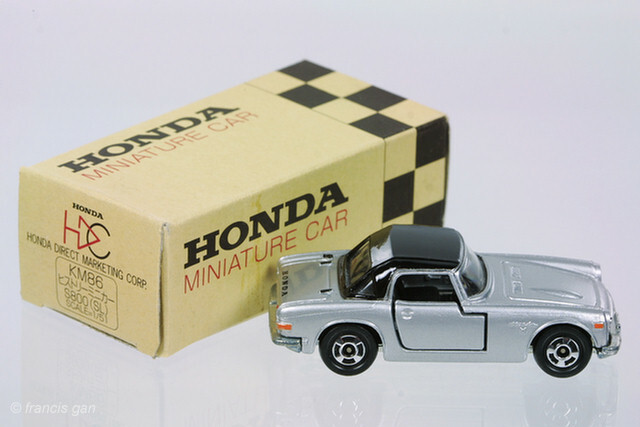 This Made in Japan model came in a HDM brown checkered box. 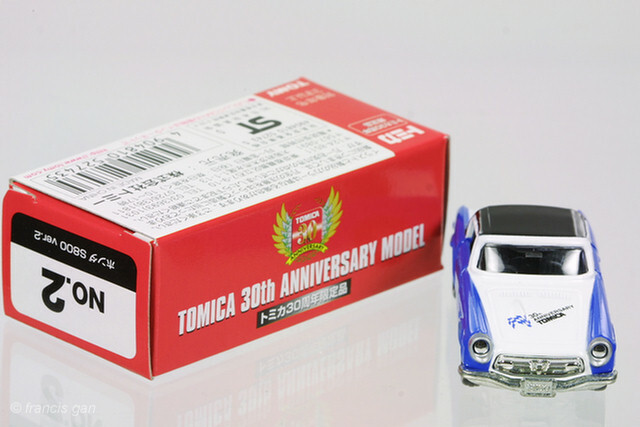 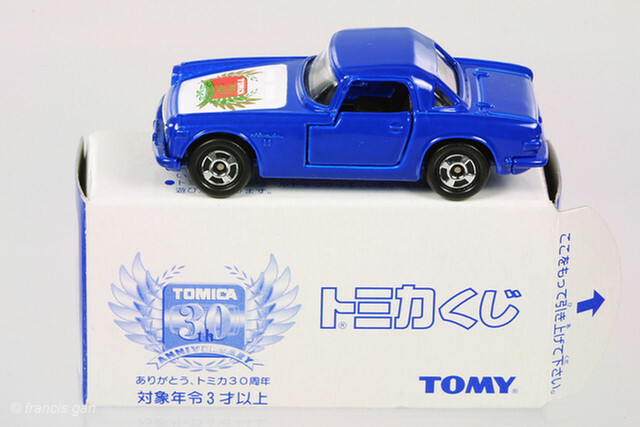 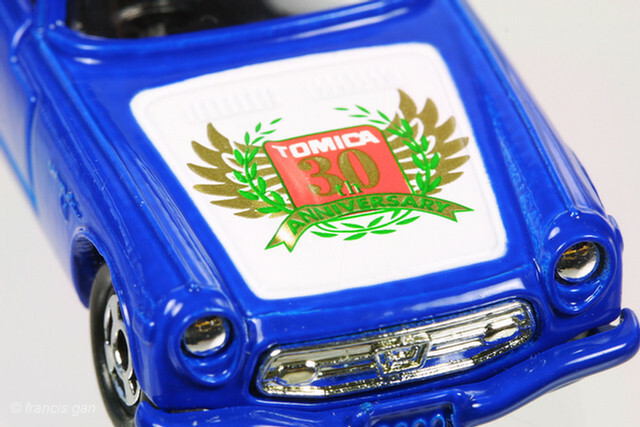 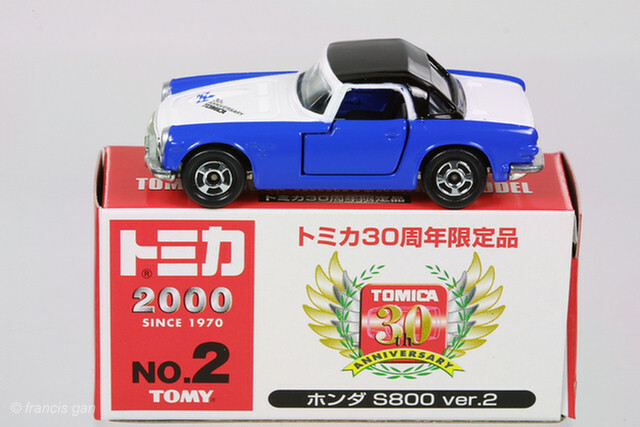 Here is a later release of the S800 commemorating Tomica's 30th Anniversary. 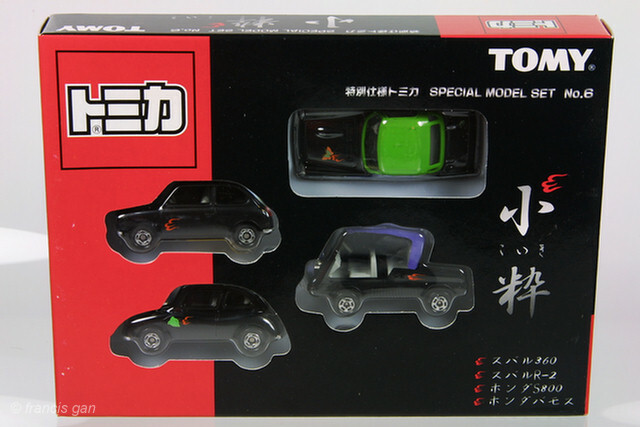 Made in China, this model came in a special 30th Anniversary box as well. 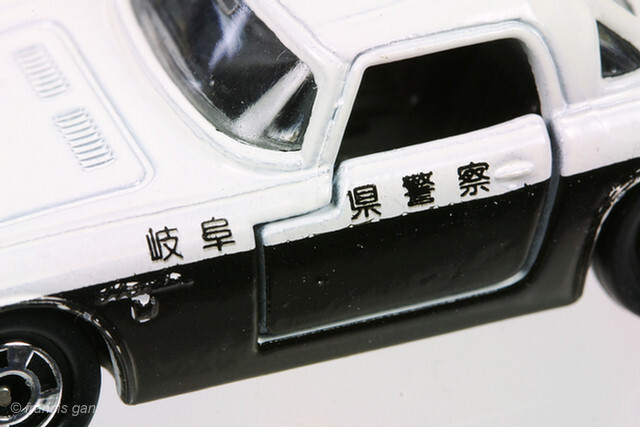 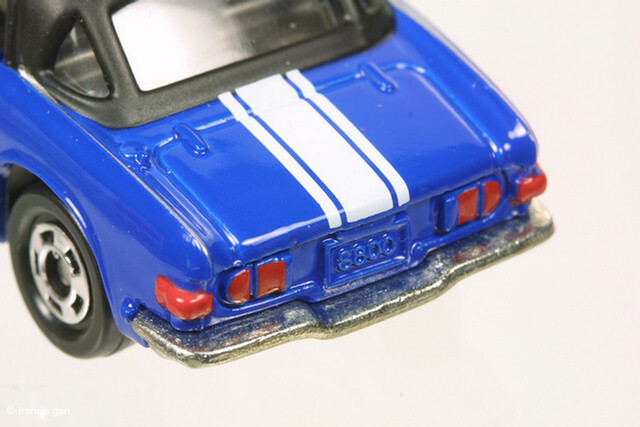 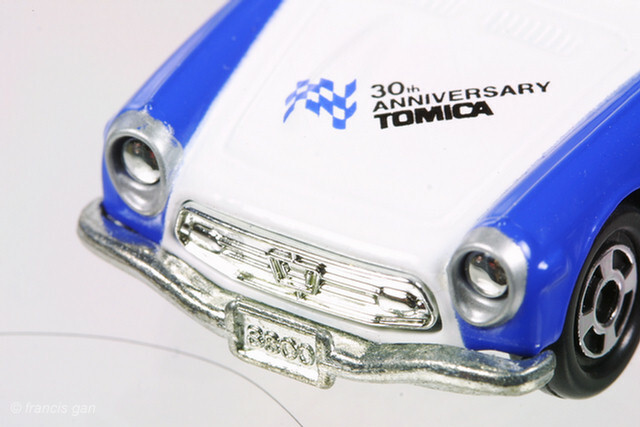 Silver headlight trim, painted taillights and 30th Anniversary markings in addition to the blue and white color scheme distinguish this from the typical S800 from Tomica. 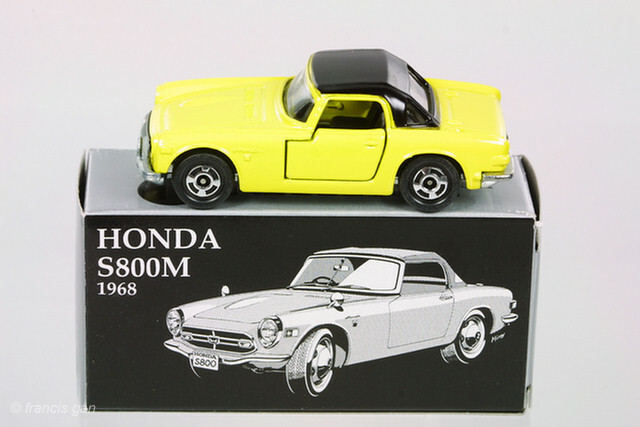 A Honda S800 from Toyota! 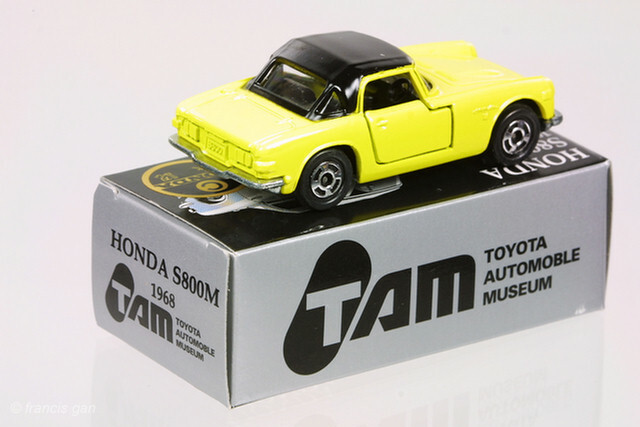 This model was only available through the Toyota Automotive Museum. 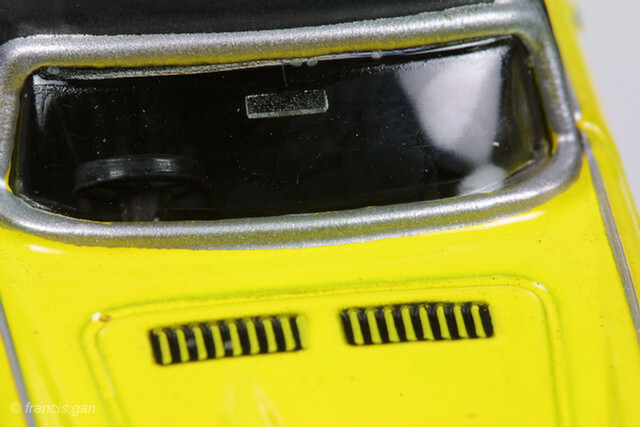 The distinguishing feature are black colored front grilles. 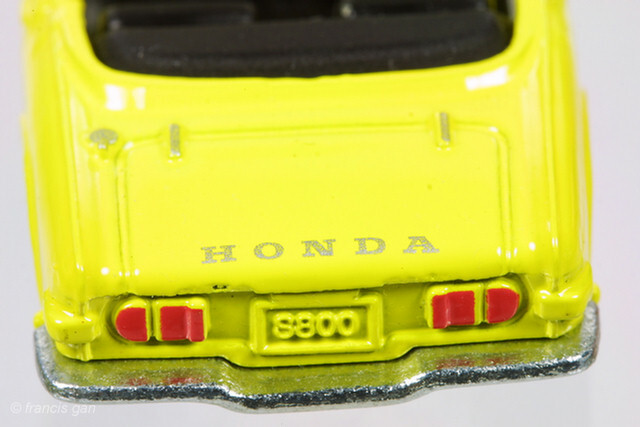 These made in Japan S800 from the TAM came in both yellow and red. 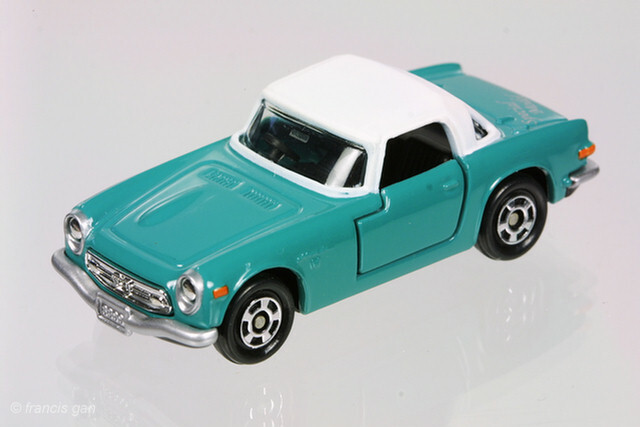 A number of Garage Suzuki editions of the Honda S800. 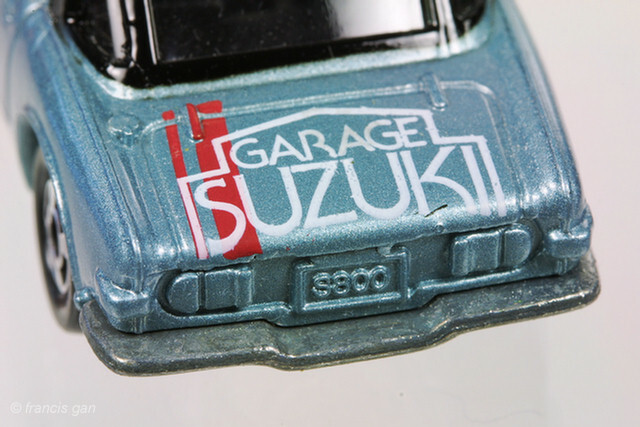 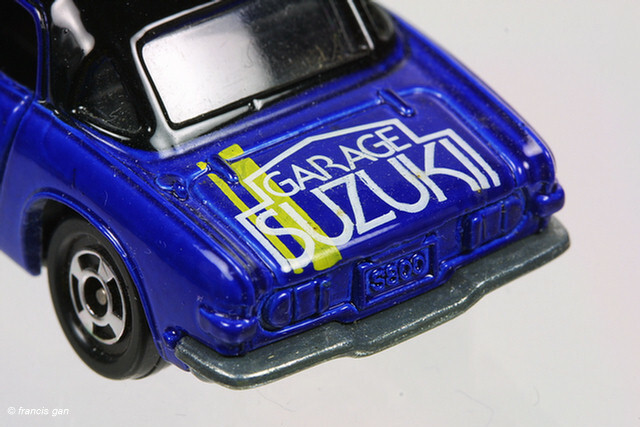 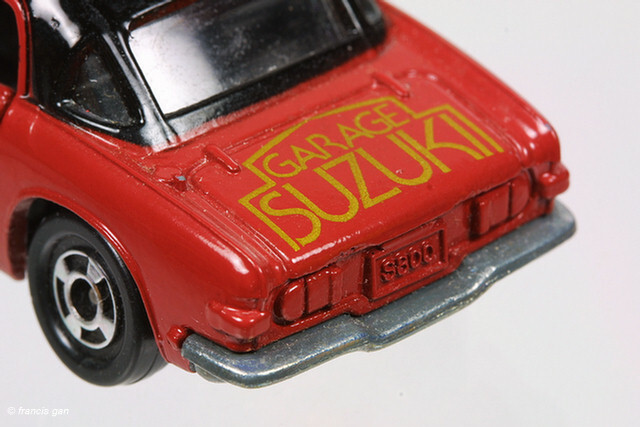 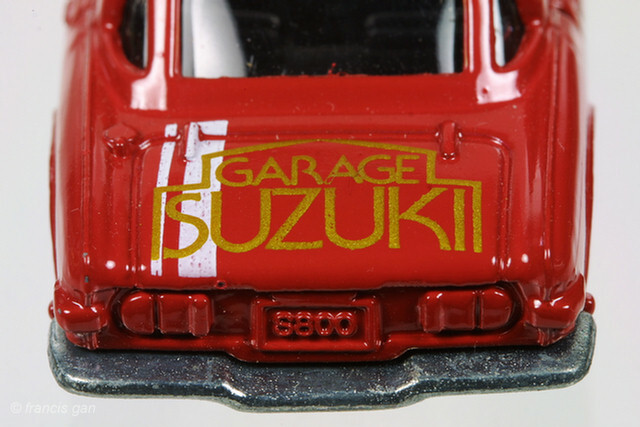 The distinguishing feature of the Garage Suzuki editions are the Garage Suzuki logo on the trunk/boot lid. 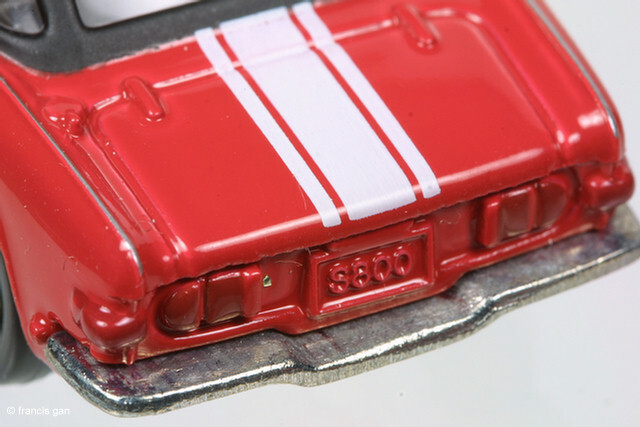 Some have body colored roofs and some have racing stripes that run the length of the car. 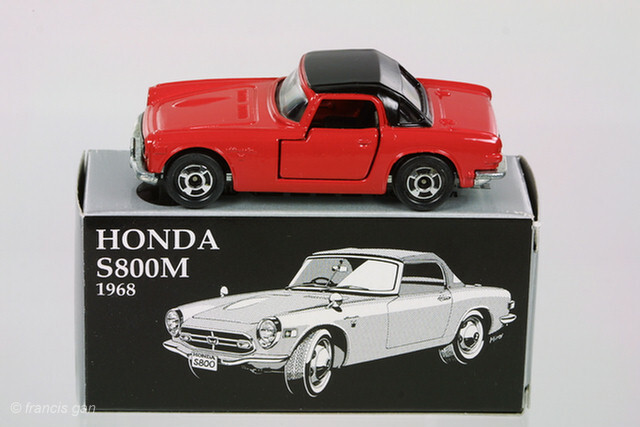 So far, these have been made in Japan S800 and normally come in plain brown boxes. 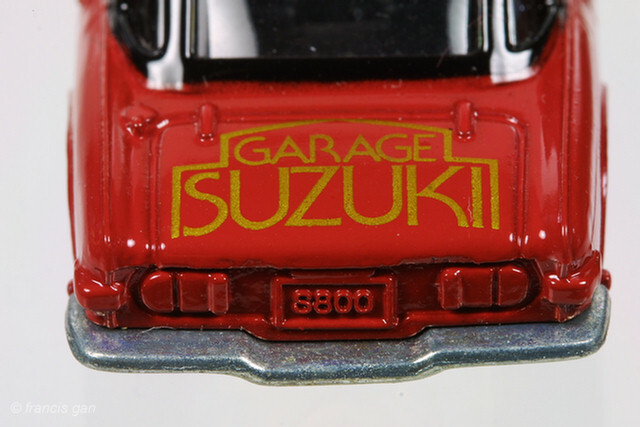 Variation with painted license plate on bonnet. 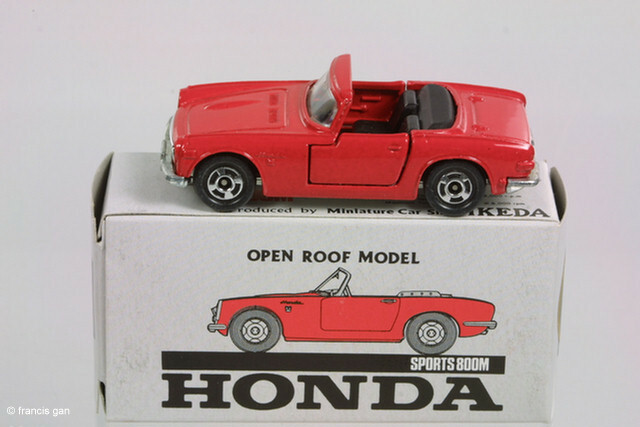 A special edition Honda S800 - with it's roof cut off - making it an open air roadster. 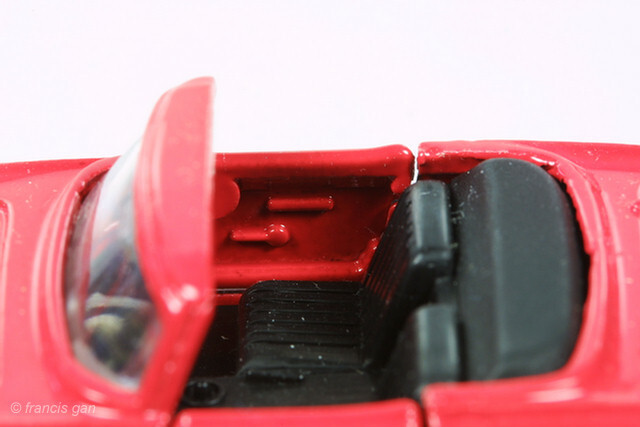 Interestingly, nothing needed to be done to the interiors to make these open air versions. 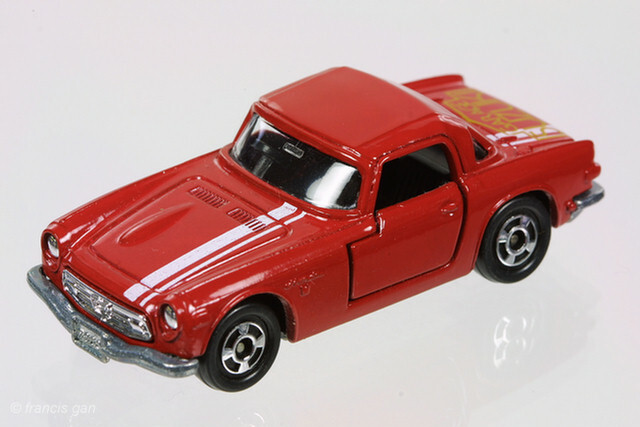 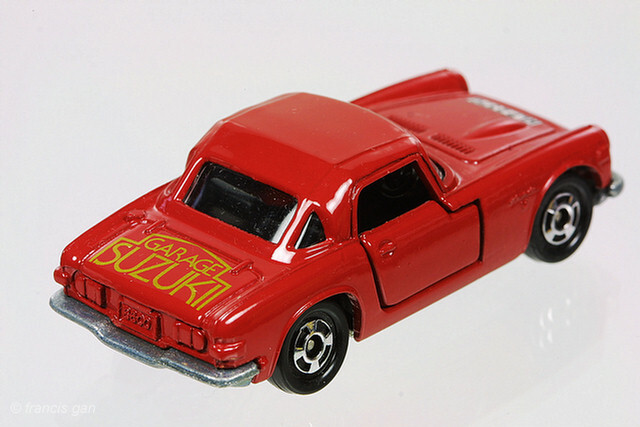 A Kawaguchiko Motor Museum version of the Honda S800 in red with Team SS and museum markings. 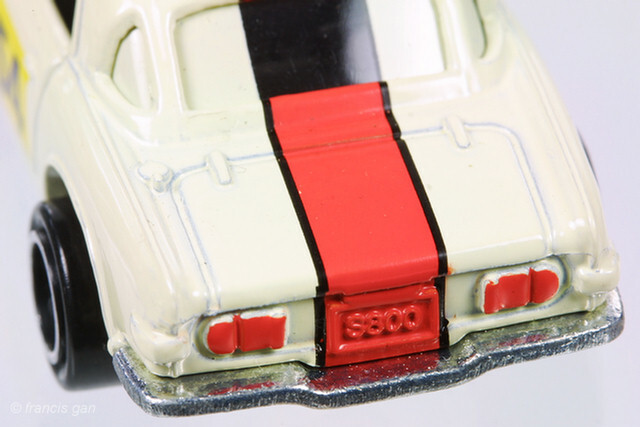 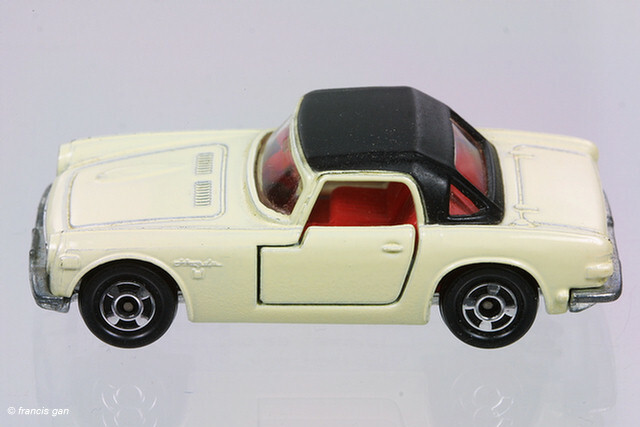 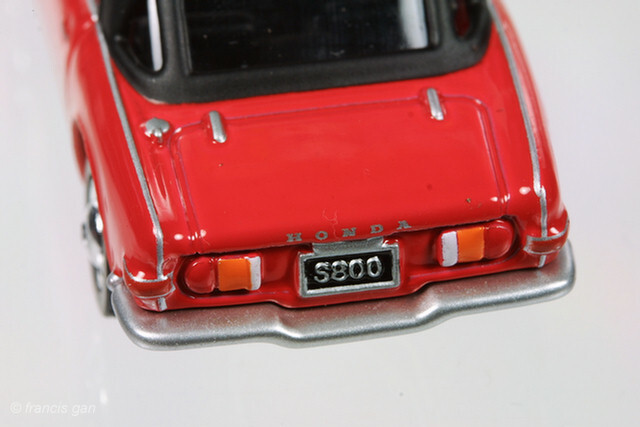 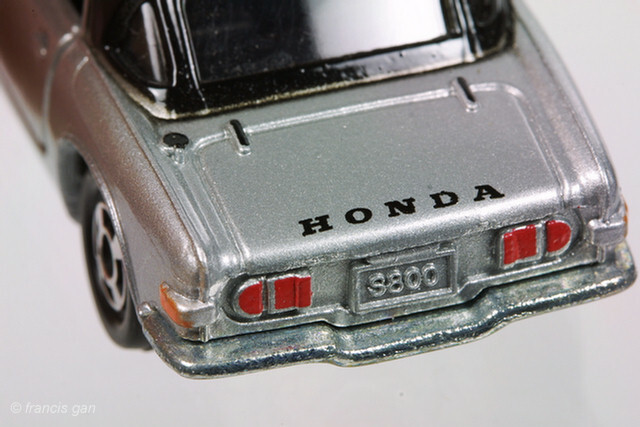 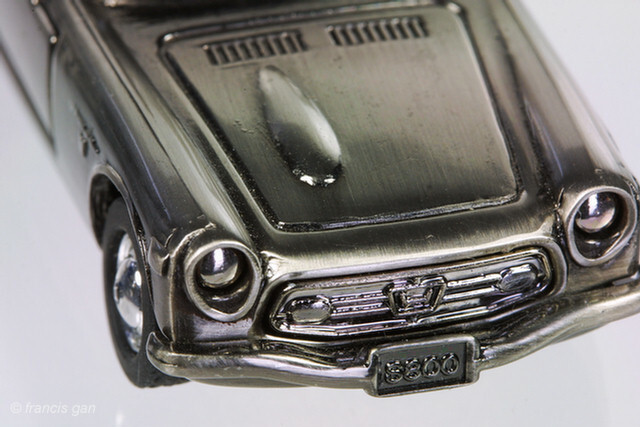 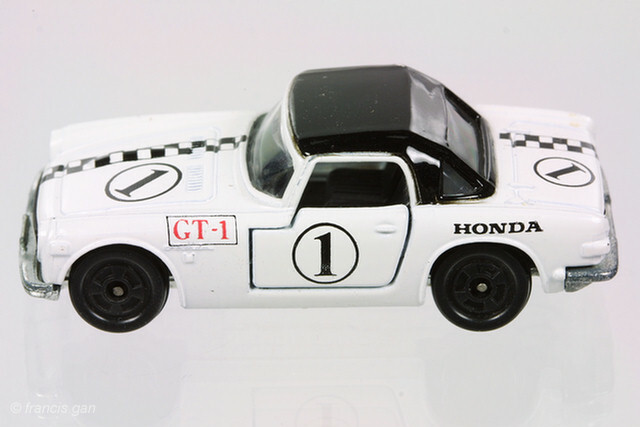 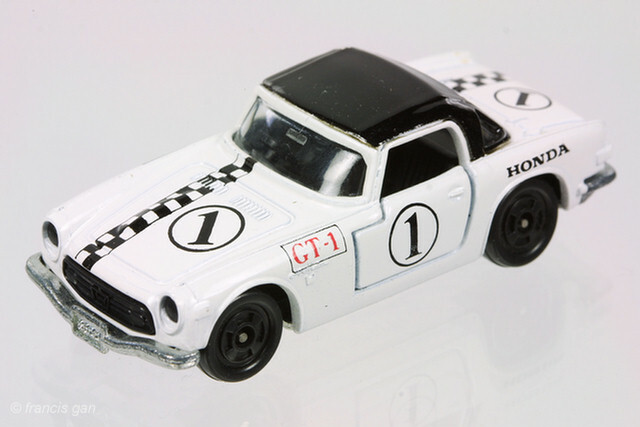 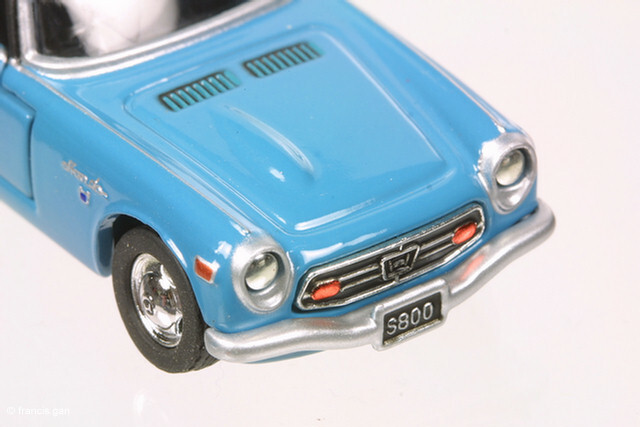 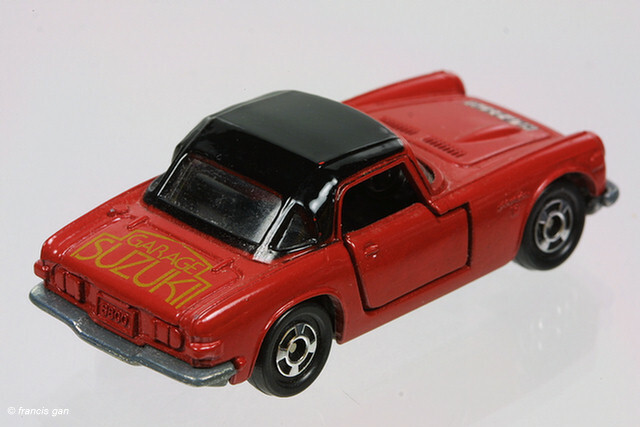 The Honda Direct Marketing versions of the Honda S800 came with additional painted details such as the headlight trim, trunk/boot hinges, gas/petrol caps, rear taillights, corner markers. 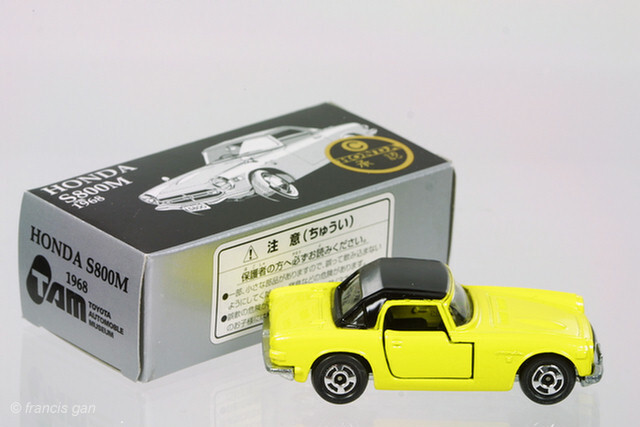 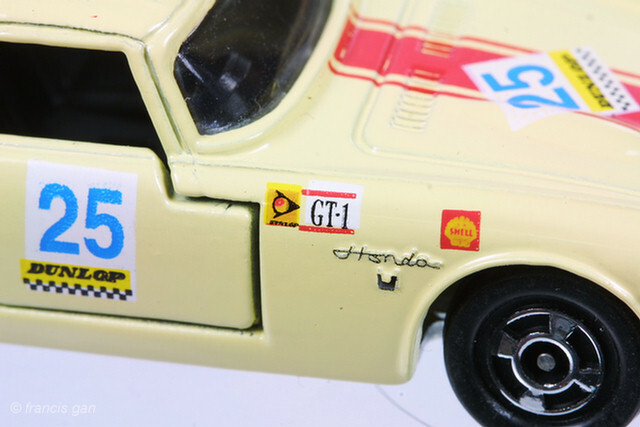 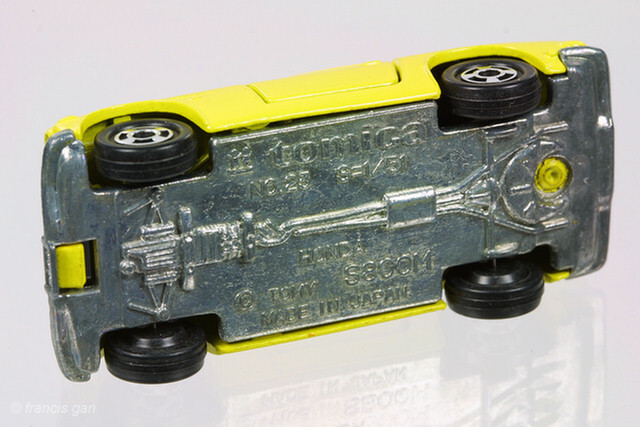 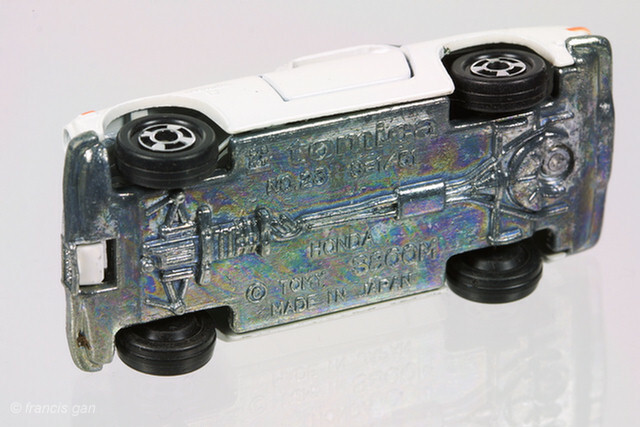 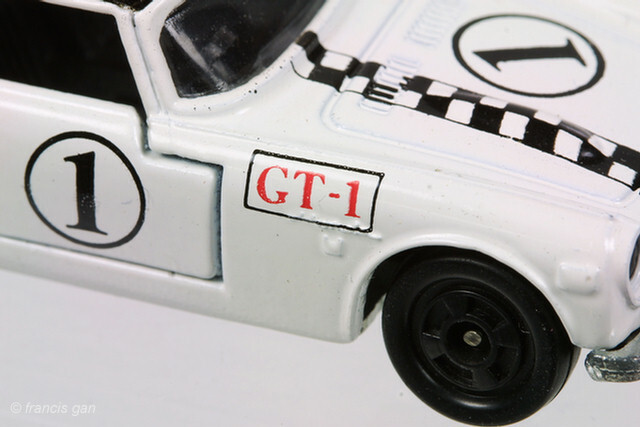 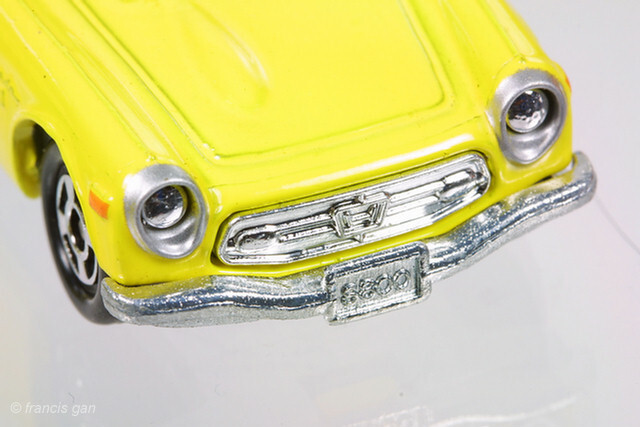 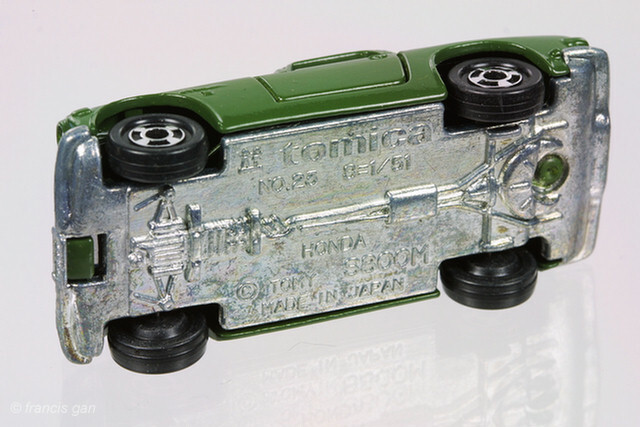 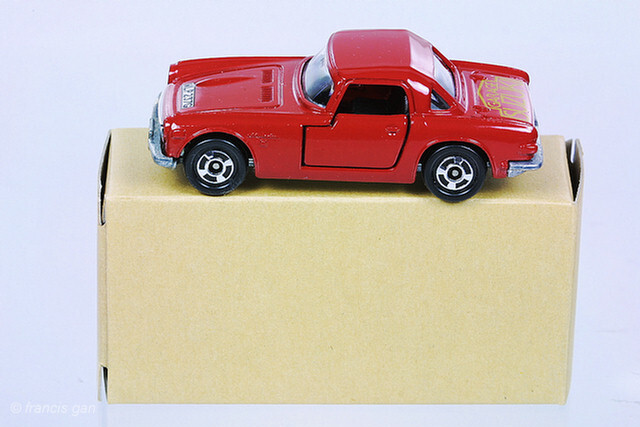 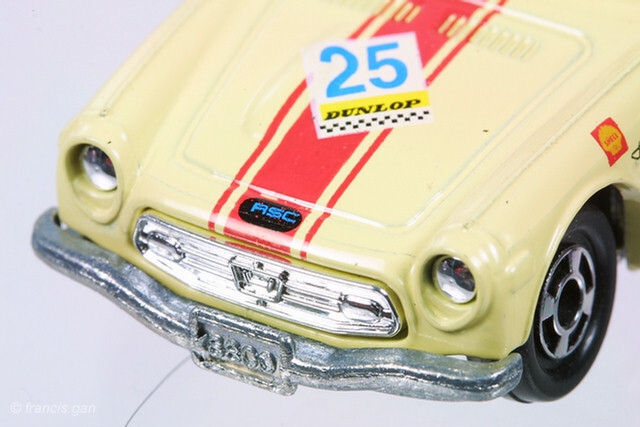 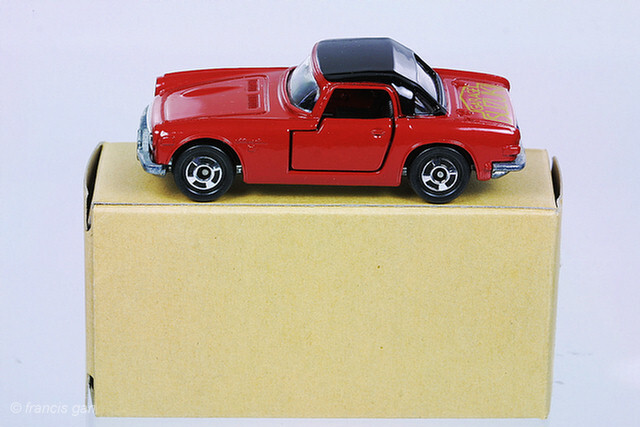 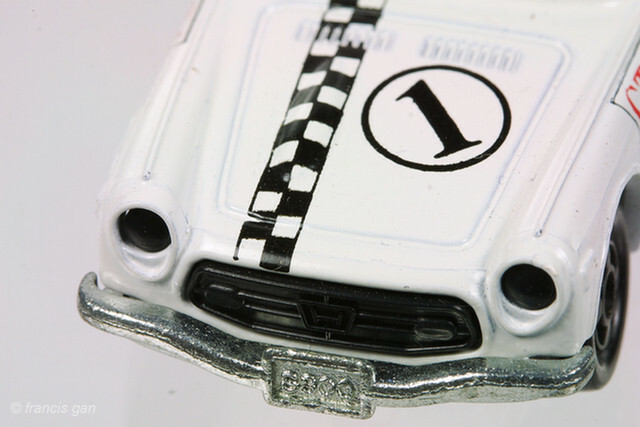 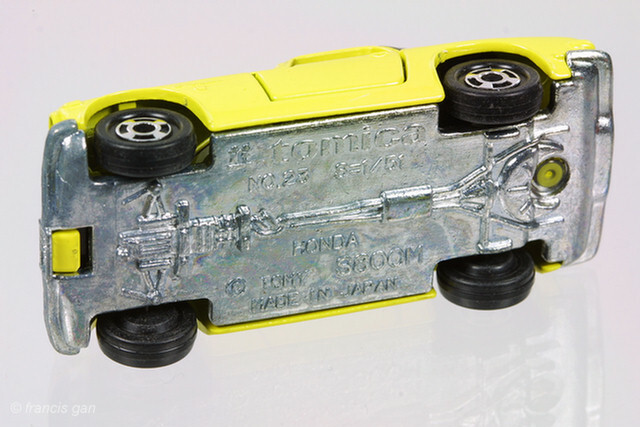 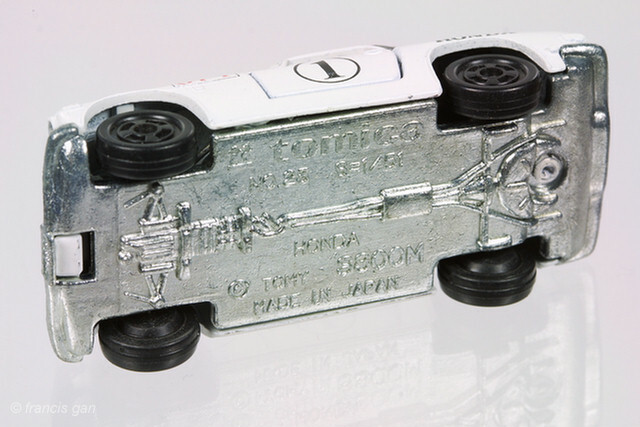 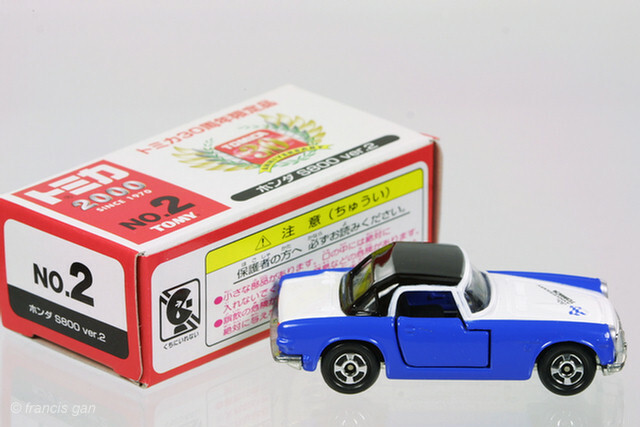 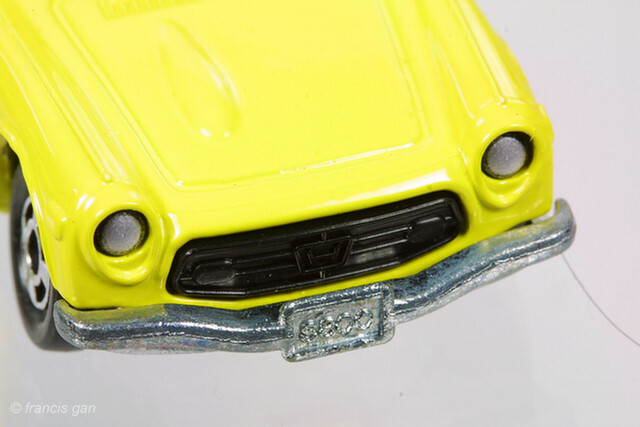 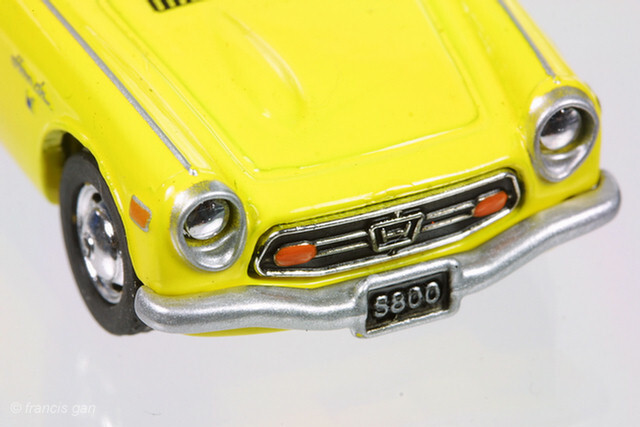 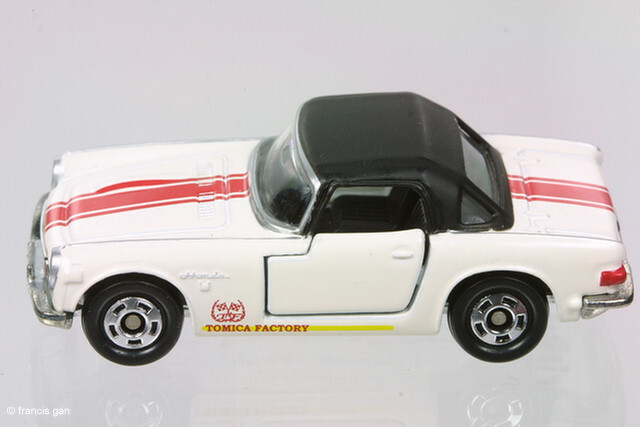 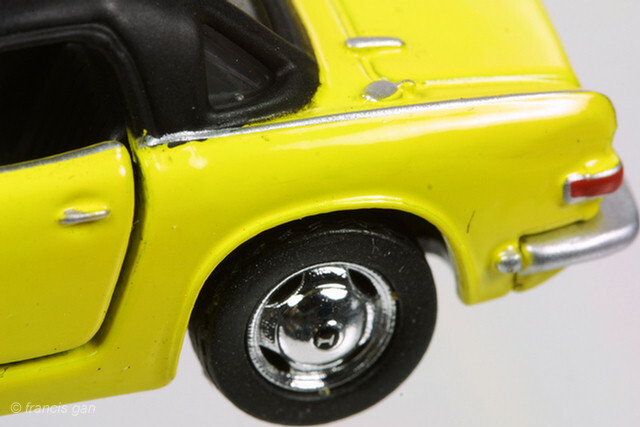 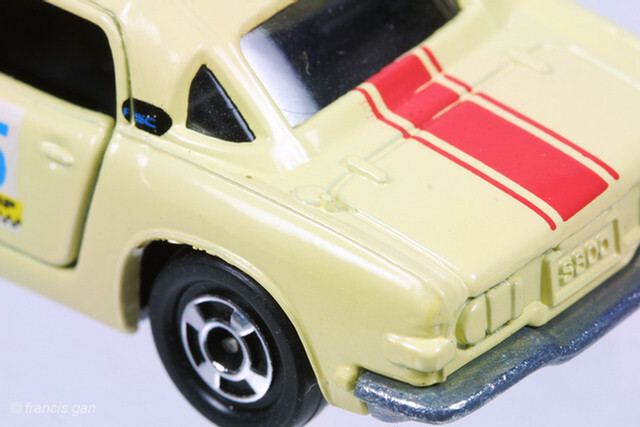 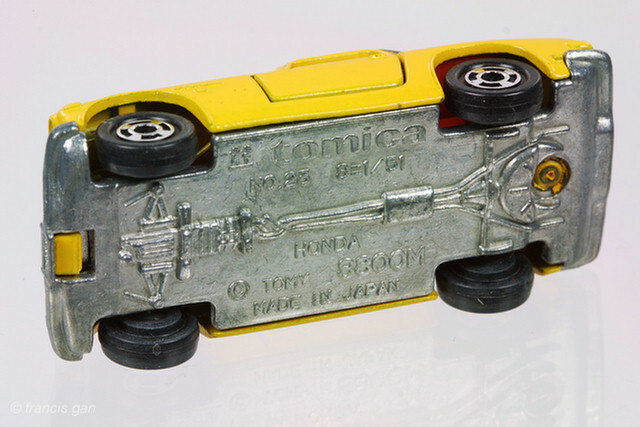 The HDM boxed cars were made in Japan and came in yellow, white, silver and red. 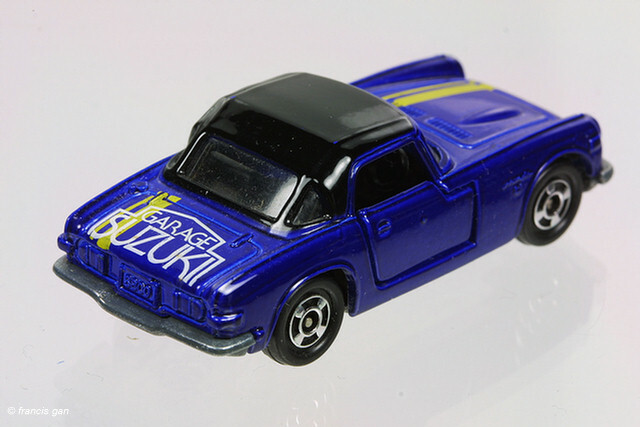 There was also a met. 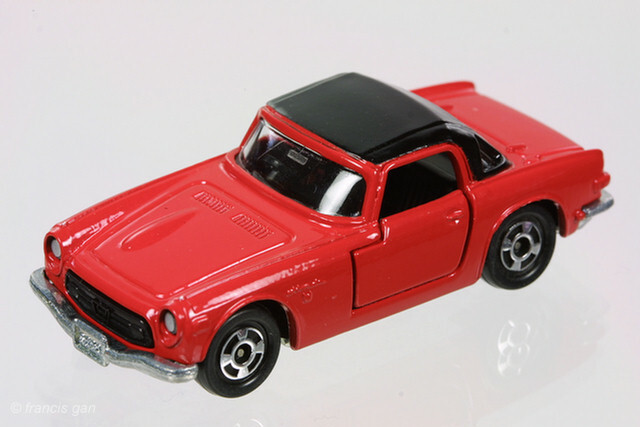 red with a grey roof. 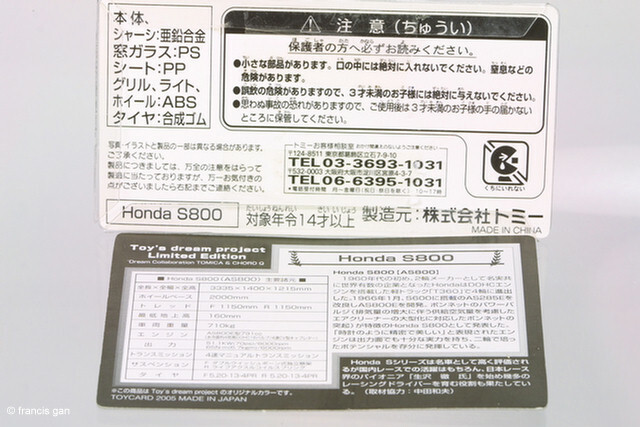 The Honda Direct Marketing version of the top down S800. 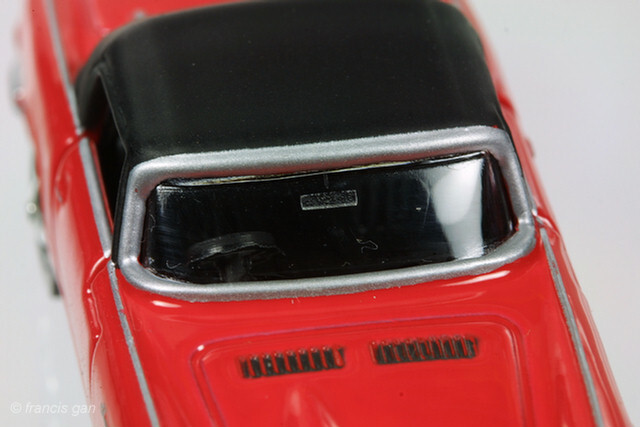 It has all the same painted details as the top up version and in addition has a black wind visor on the windshield header. 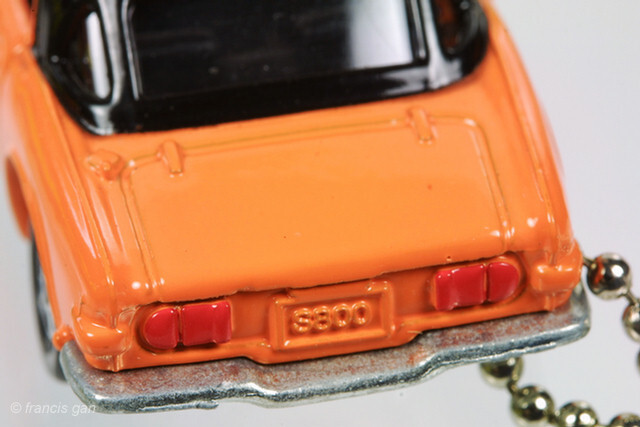 This is late issue keychain version of the S800 with painted taillights and headlight trim. 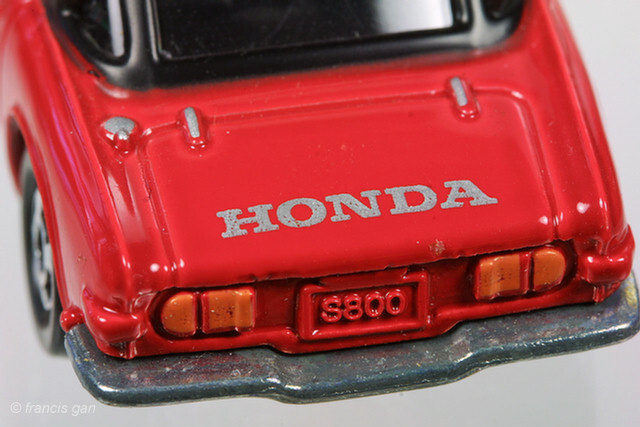 As with most of the later issue S800s, this one is made in China also. 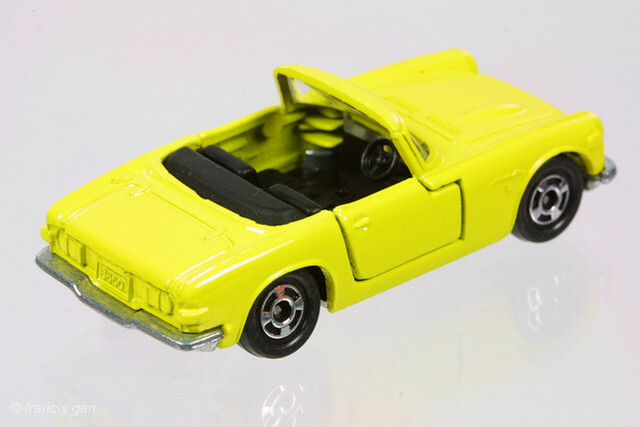 This is an early issue cadmium yellow S800 with a red interior. 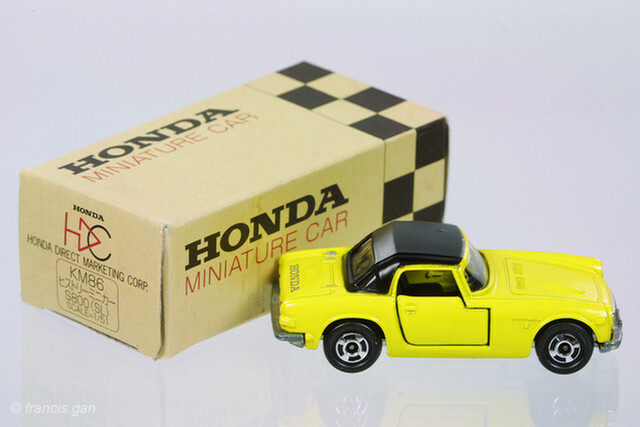 It comes in a T-29 black/yellow box. 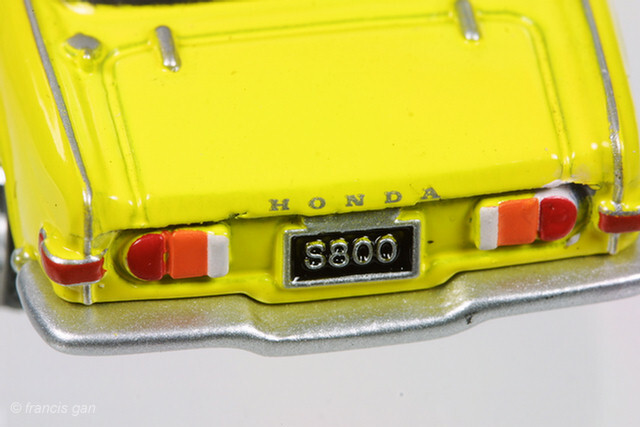 This is an early issue yellow S800 with a red interior. 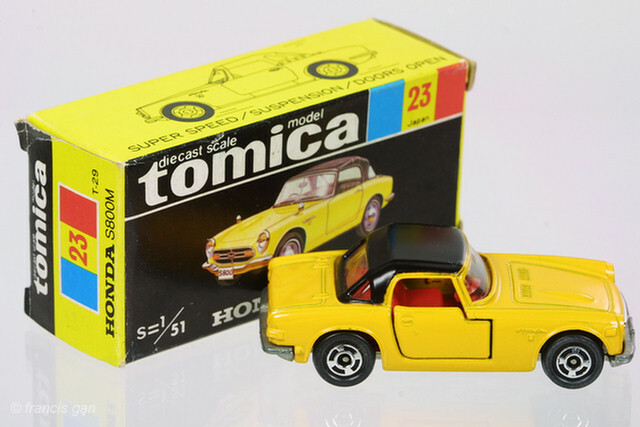 It comes in a T-29 black/yellow box. 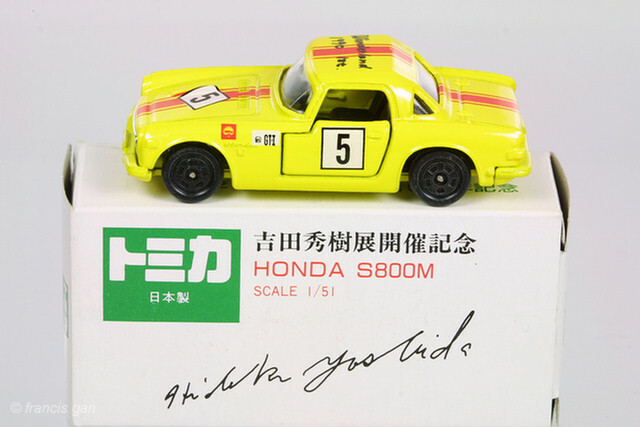 This is later issue yellow S800 with a black interior made in China. 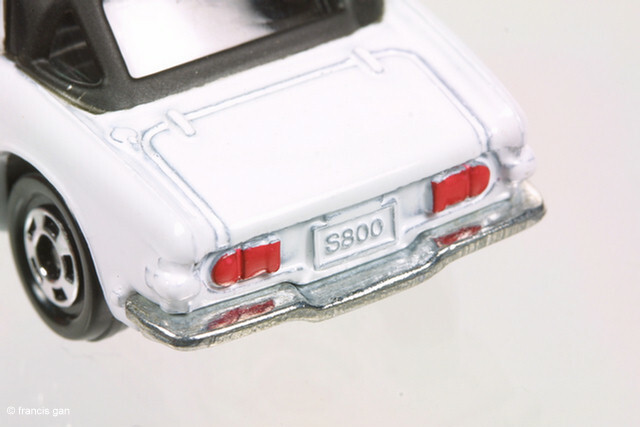 In addition to the painted silver headlight trim, trunk hinges, gas cap, corner markers, this version also has painted door handles! 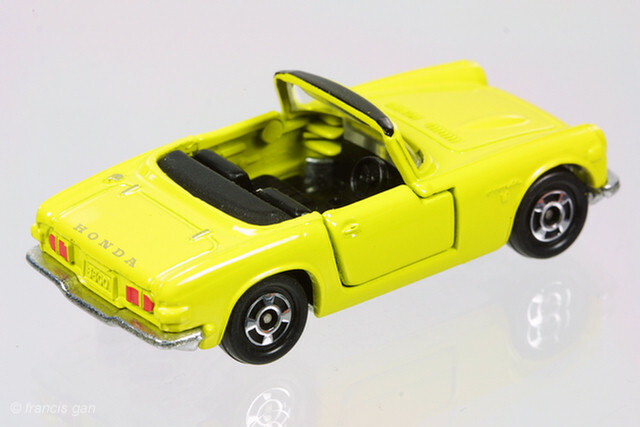 The Ikeda custom version top down S800 came in both yellow and white. 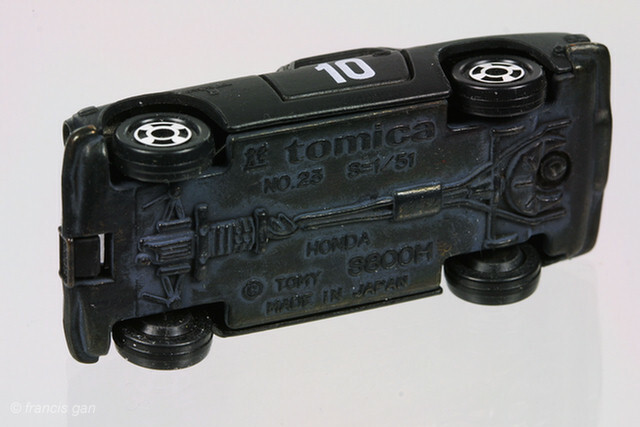 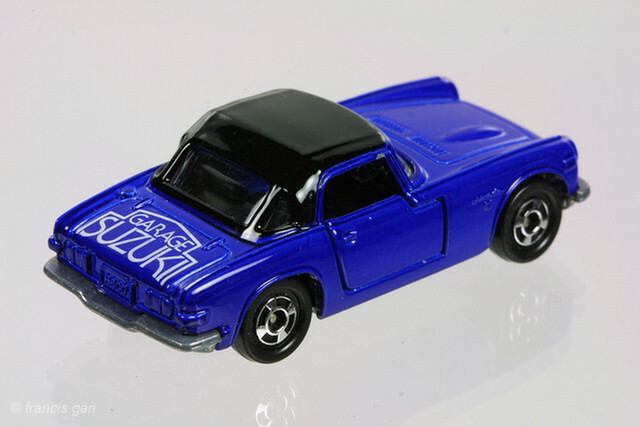 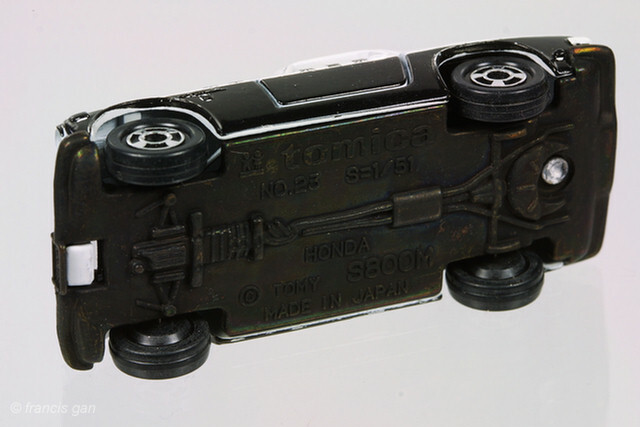 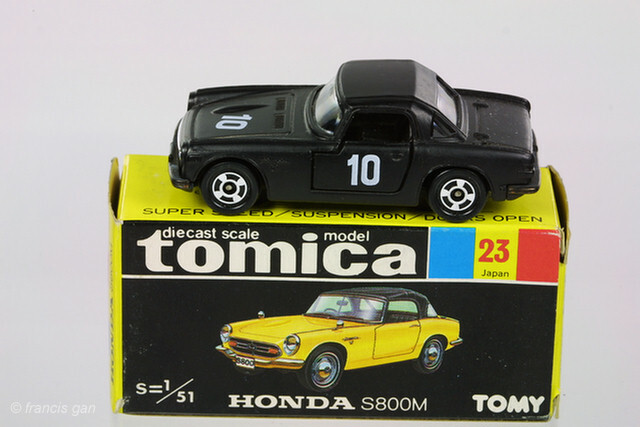 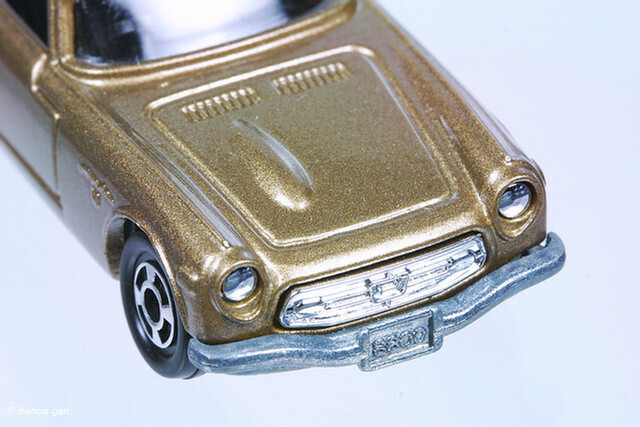 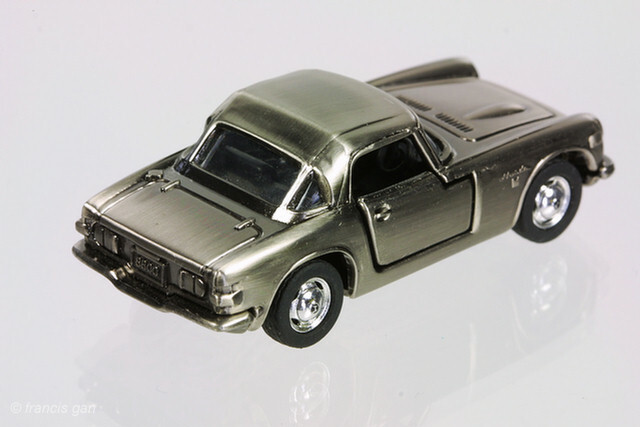 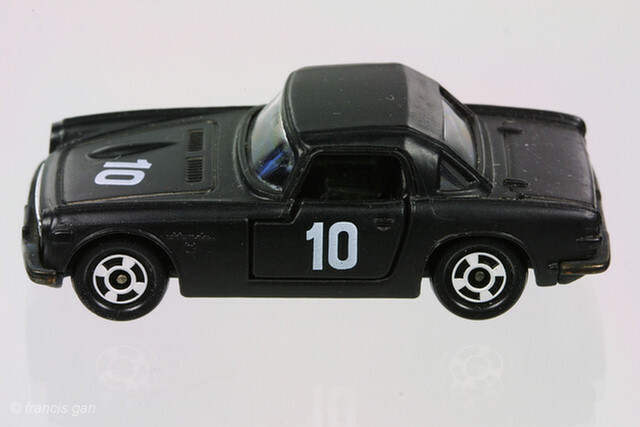 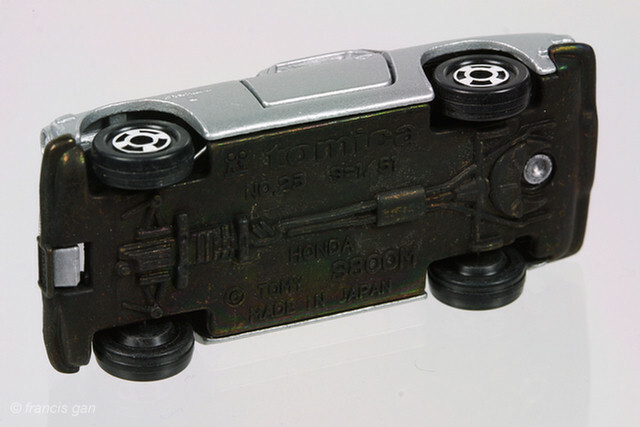 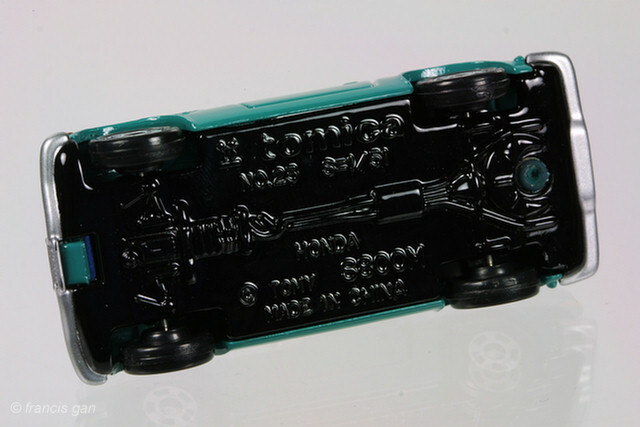 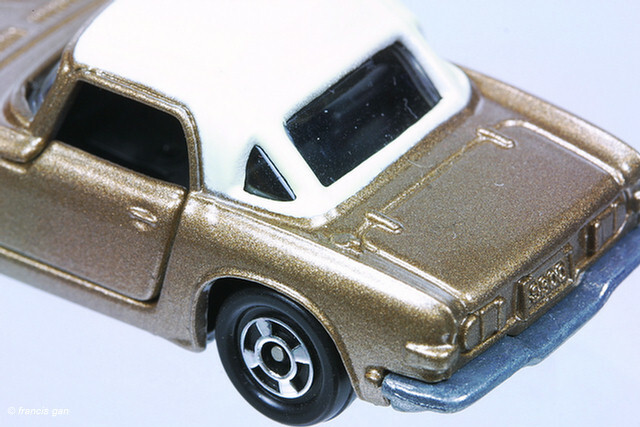 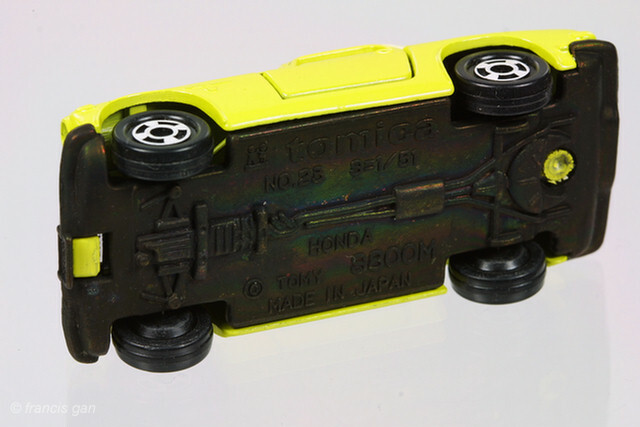 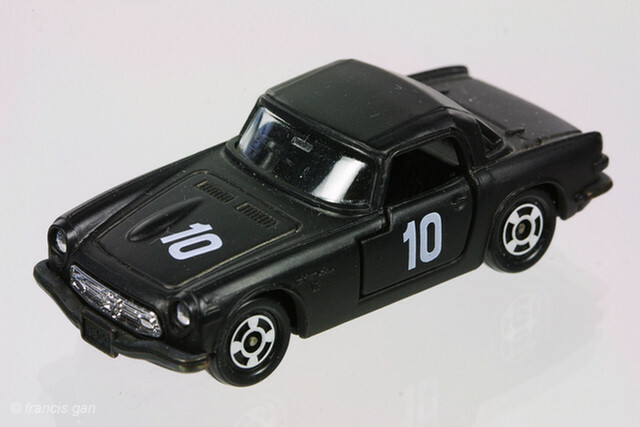 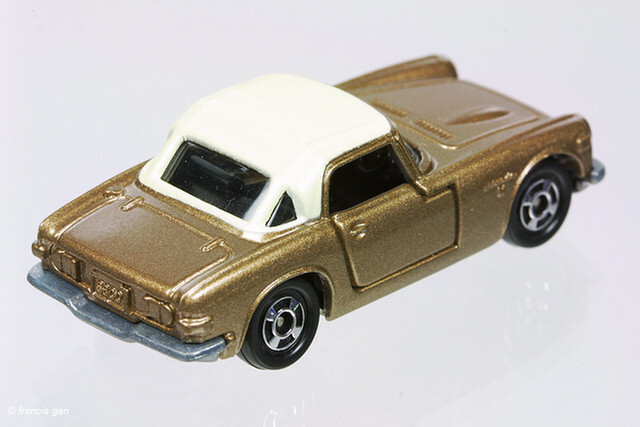 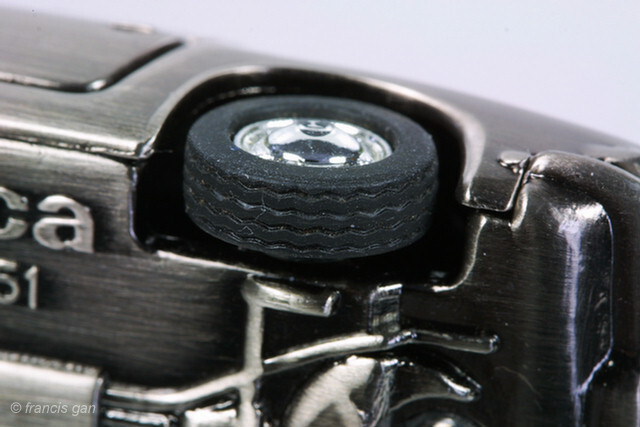 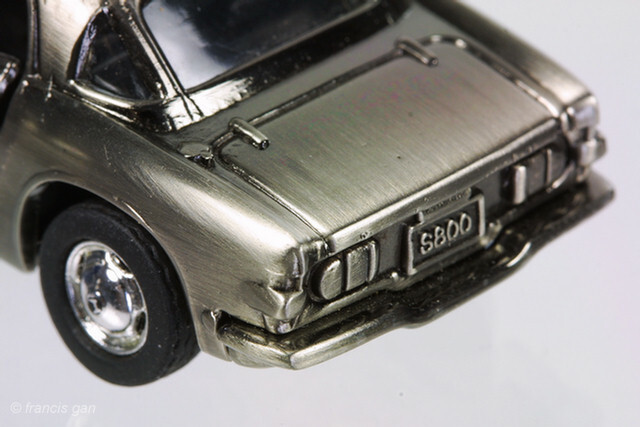 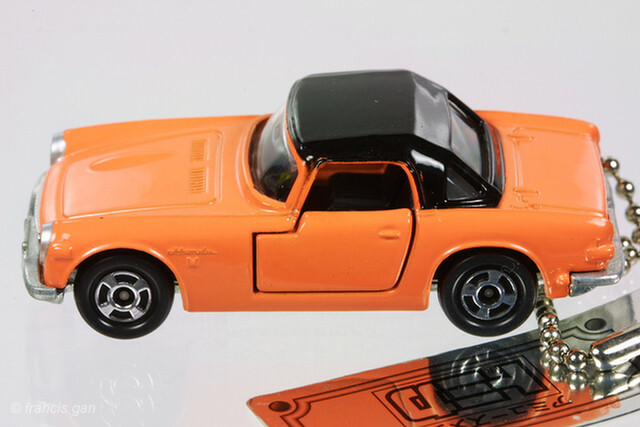 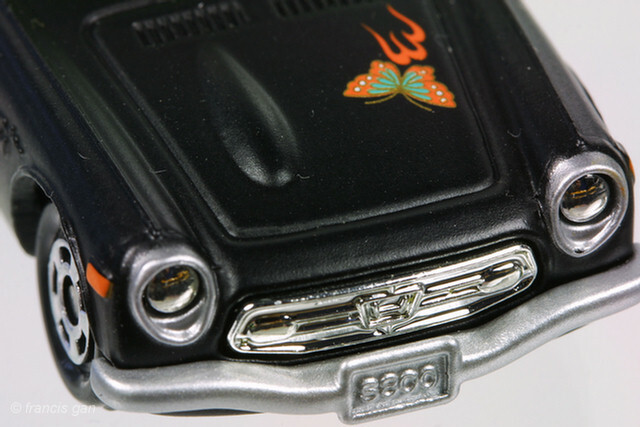 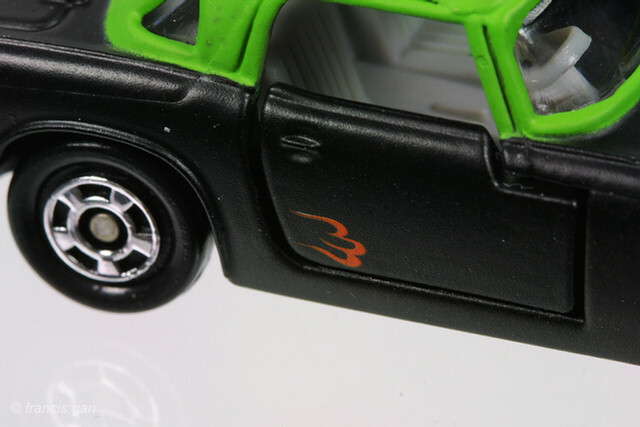 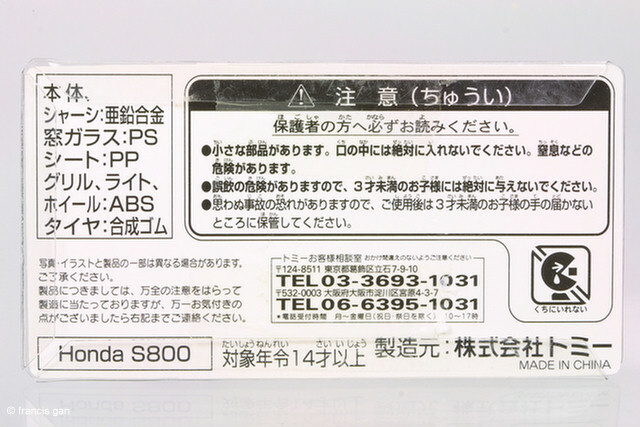 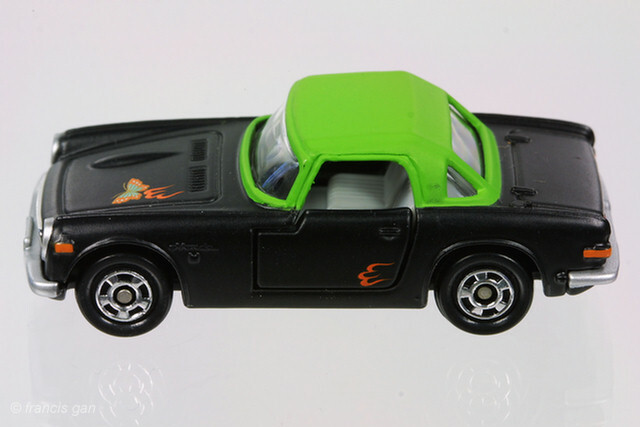 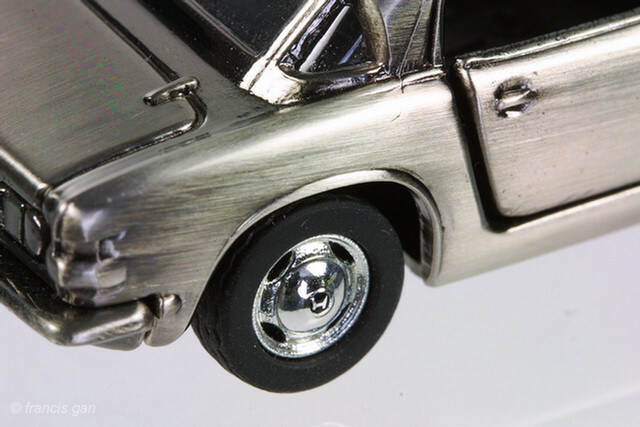 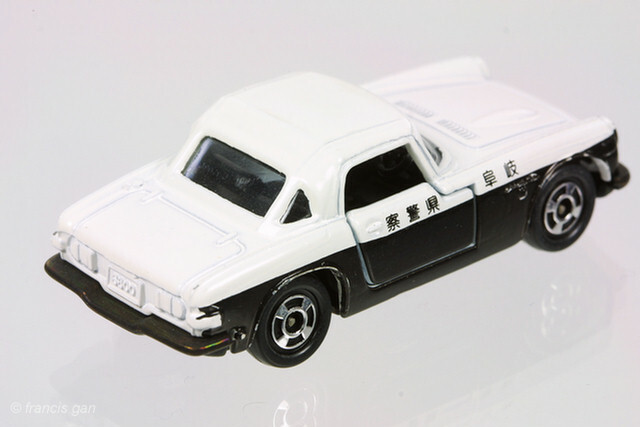 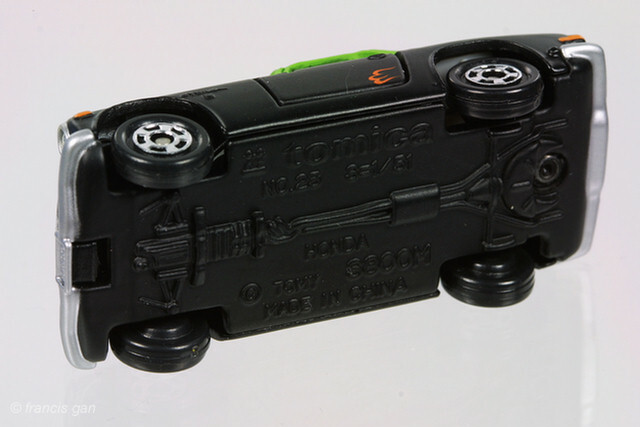 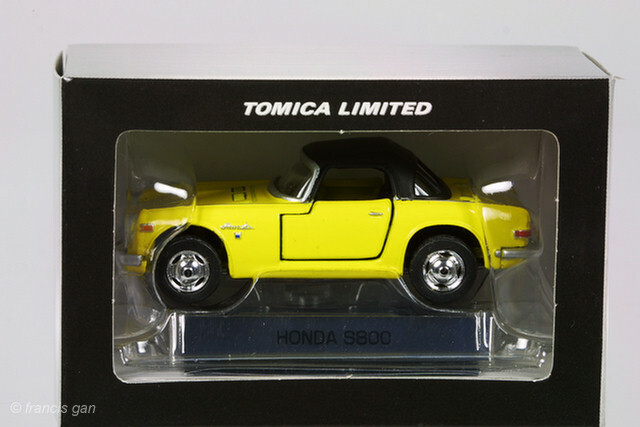 The black/bronze anodized base versions of the S800 seemed to be the second issue of the car from Tomica. 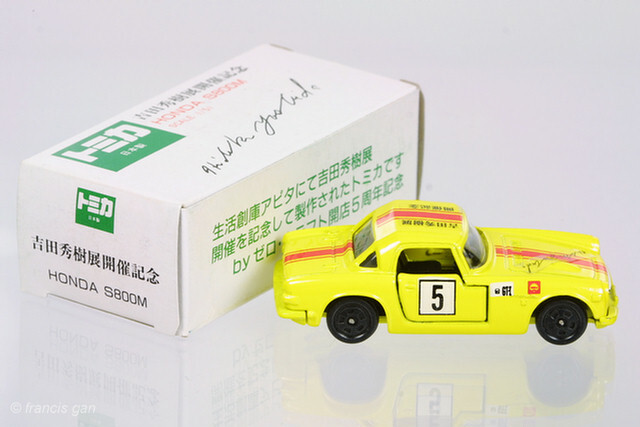 Still Made in Japan, these came in T35 marked black and yellow boxes. These came in yellow/white, light blue/black and silver/black - all with white wheels. 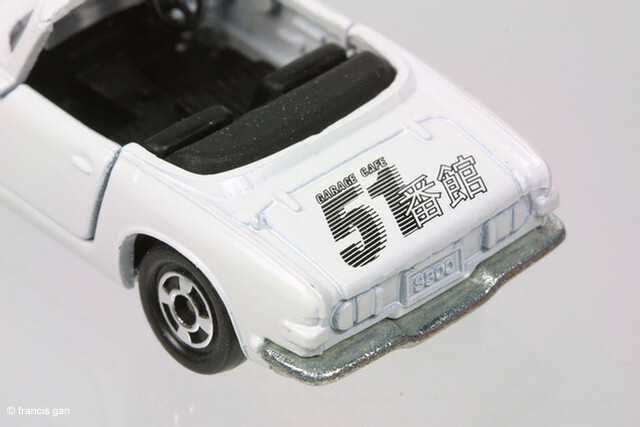 The silver version has white wheel. 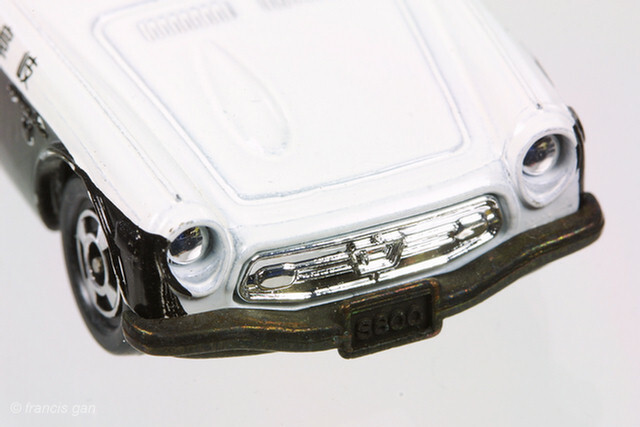 A pair of black and white race S800 - both numbered 10 and have bronze anodized bases. 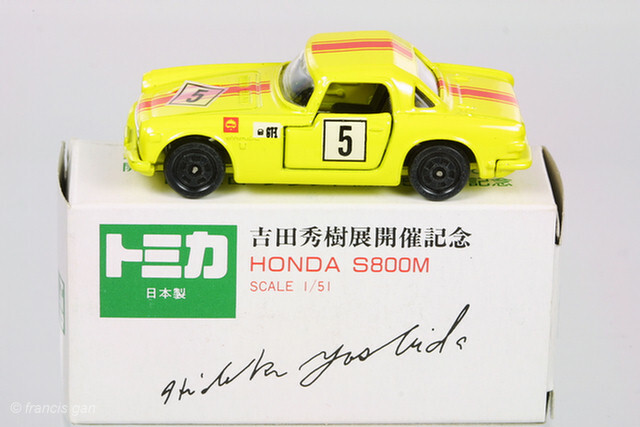 A racing version of the S800 with black wheels that came made in Japan in a HDM checkered box. 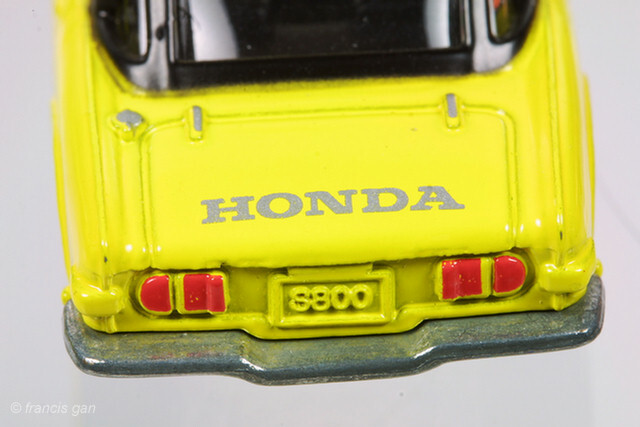 As with HDM versions, painted details abound on this car - though the hinges, gas cap and "HONDA" on the trunk are in black. 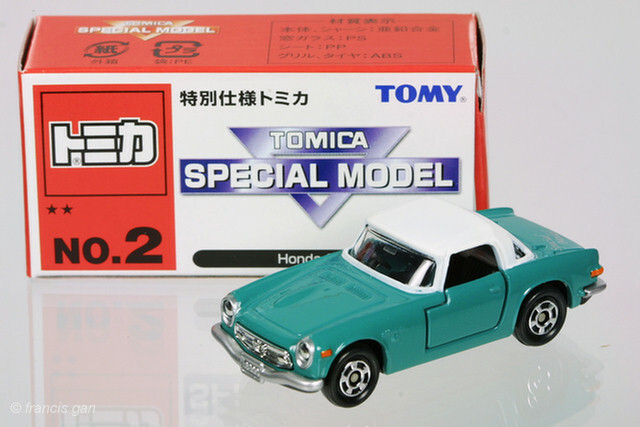 A Made in Japan version in metallic brown and a tan roof. 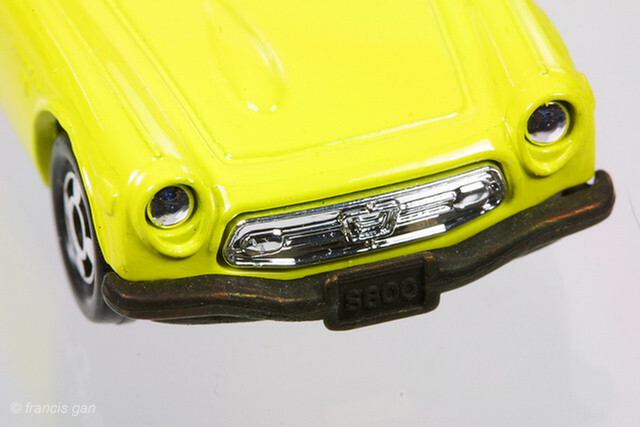 A Spoon special edition of the S800 in race trim has chrome lipped wide race wheels extending beyond the fenders! 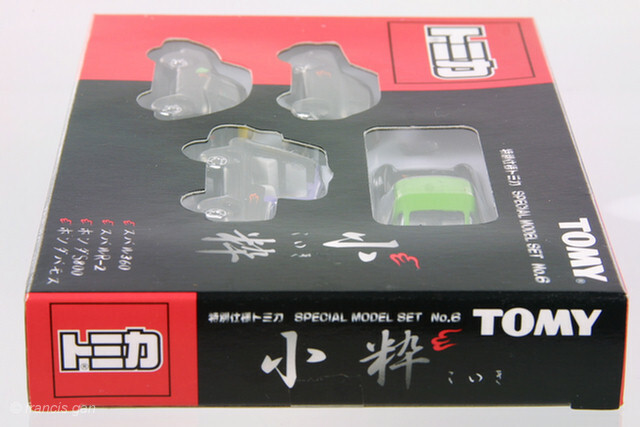 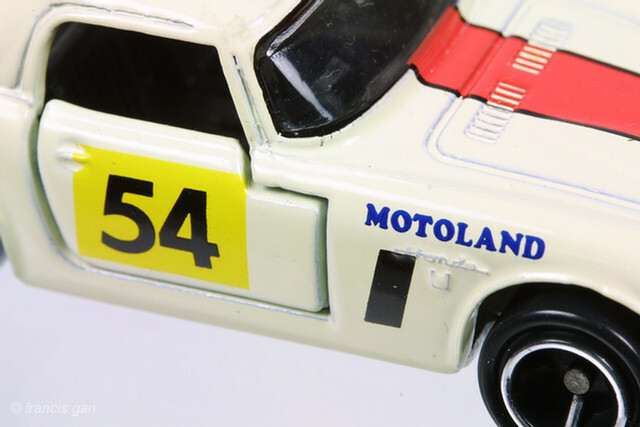 Decorated with "Motoland" and "54" markings, this made in China version has a track that is certainly wider than the regular Tomica S800. 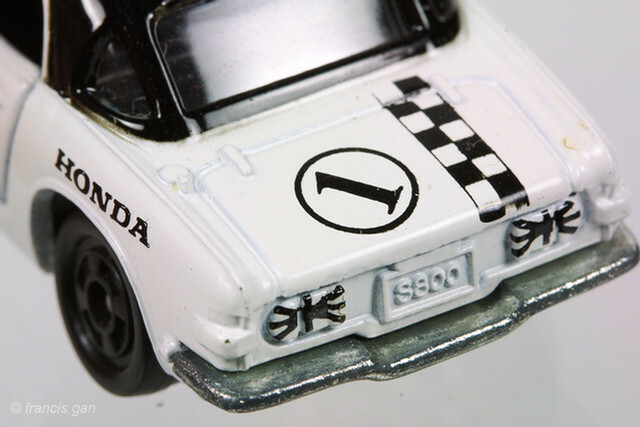 The additional race markings are good. 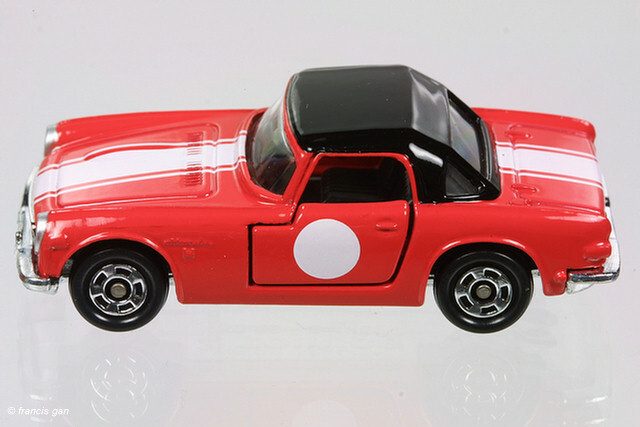 The interesting feature on this version is the pained rear window with a strip that in the middle left unpainted to match/extend the red strip that runs longitudinally through the center of the car. 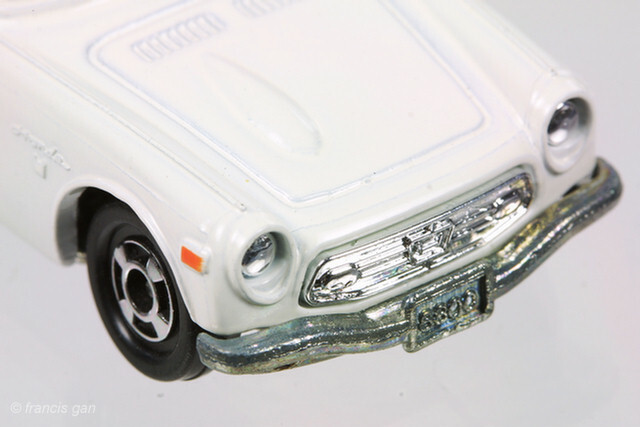 The headlights and front grille are black even though the base is bare metal. 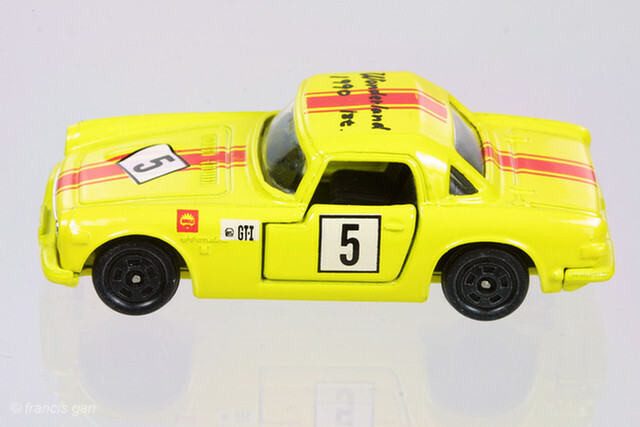 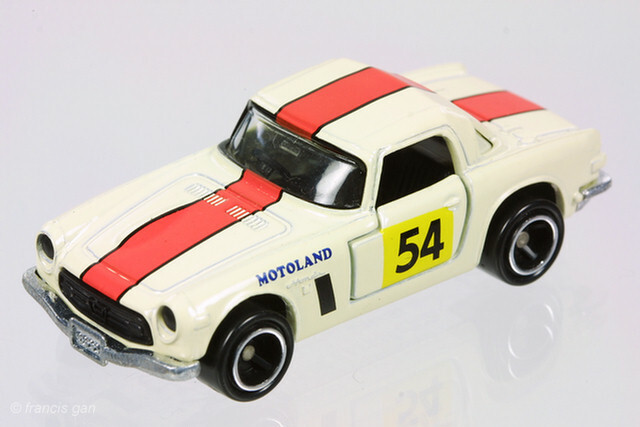 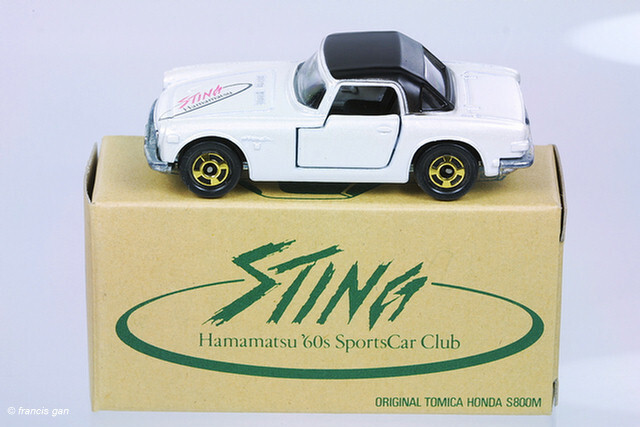 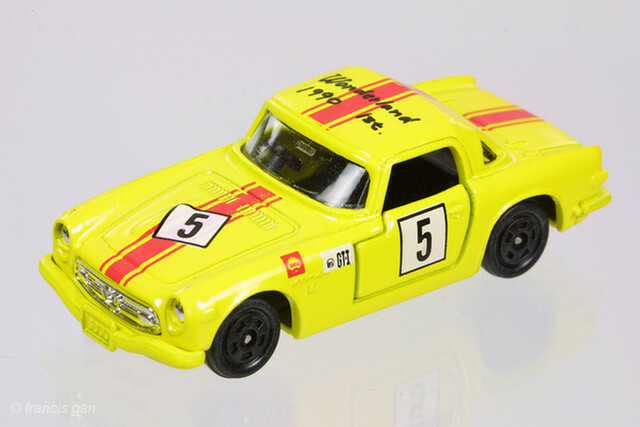 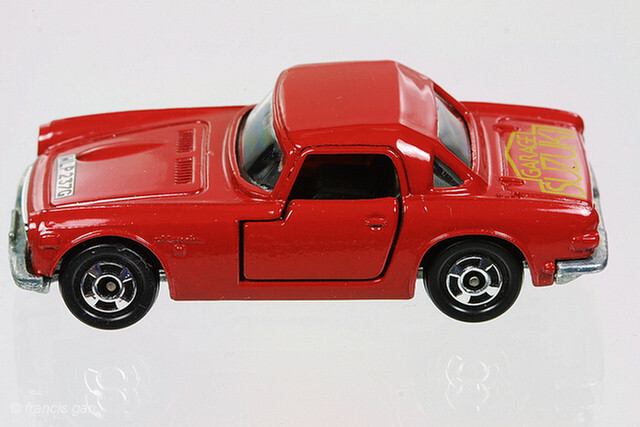 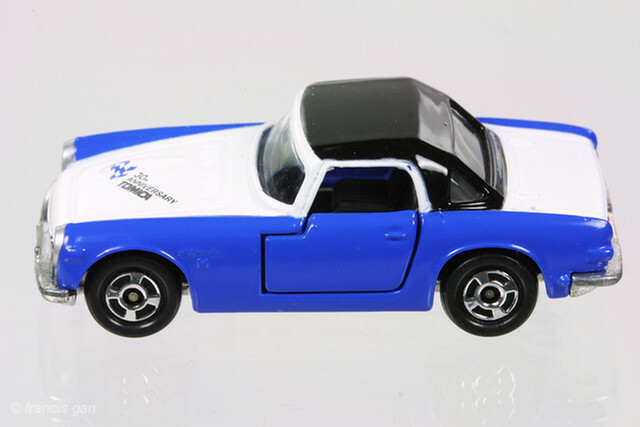 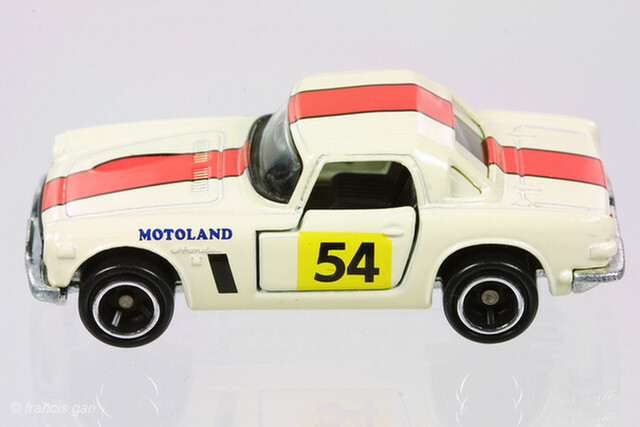 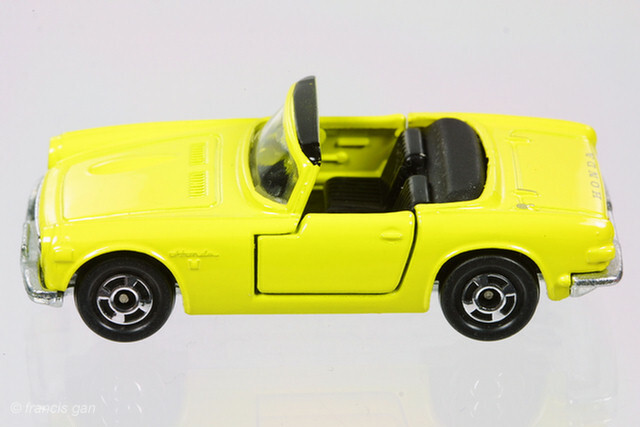 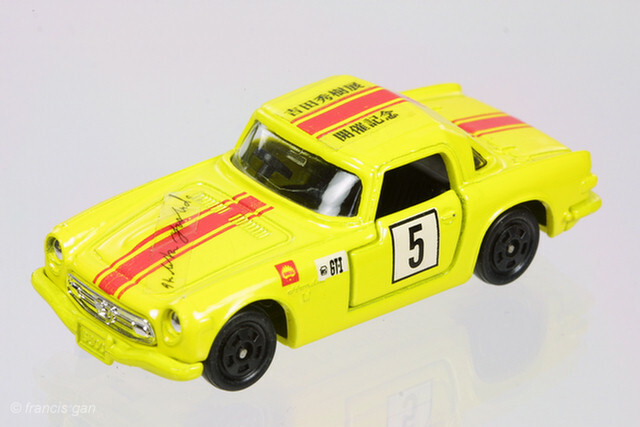 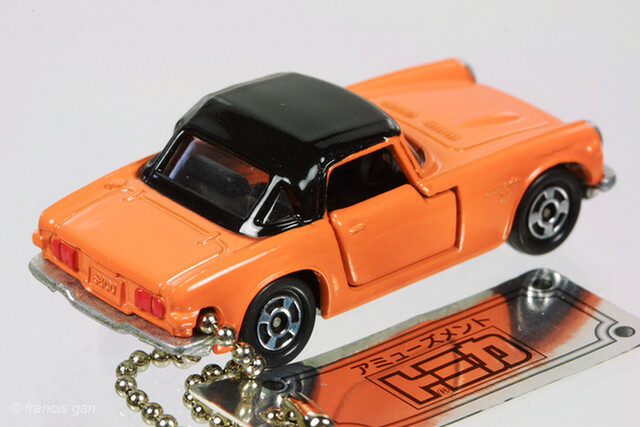 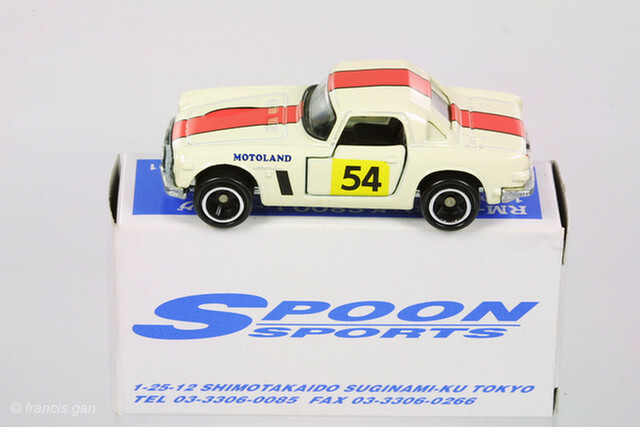 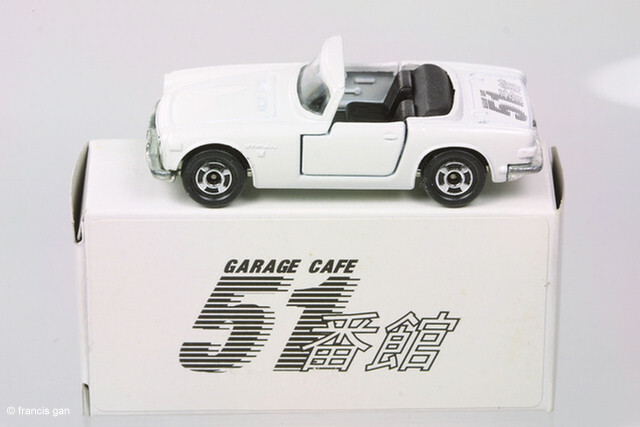 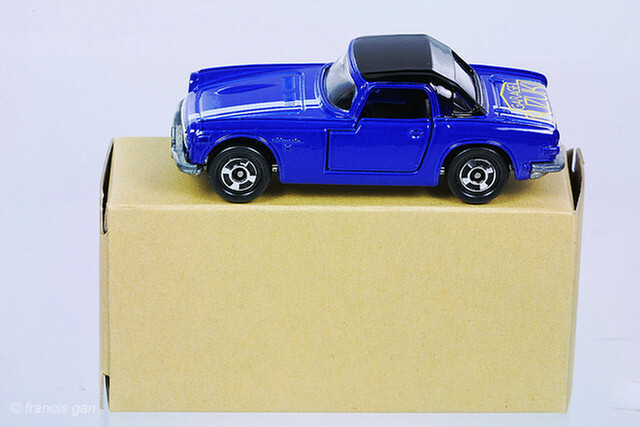 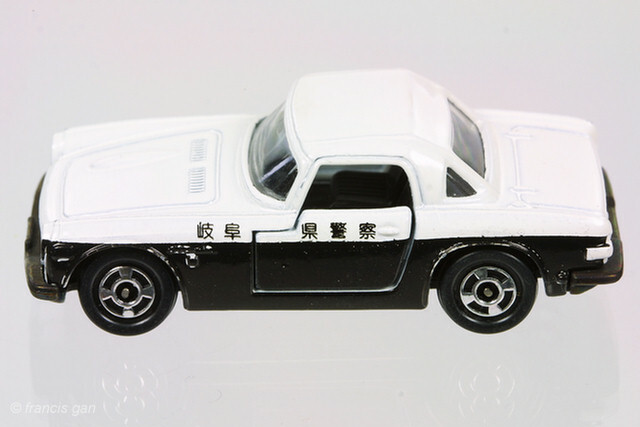 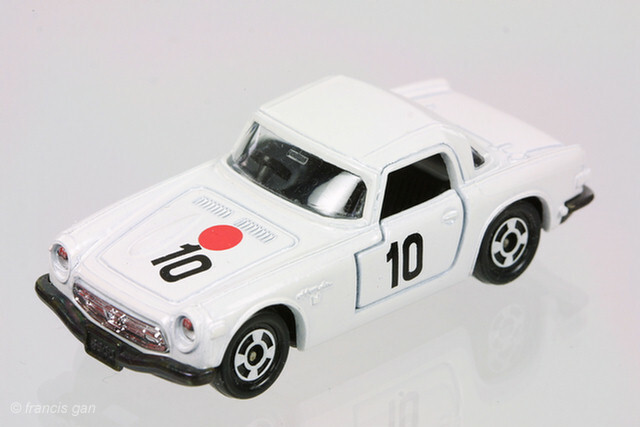 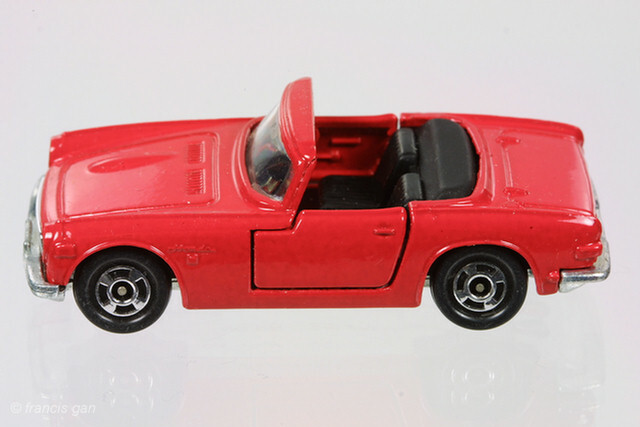 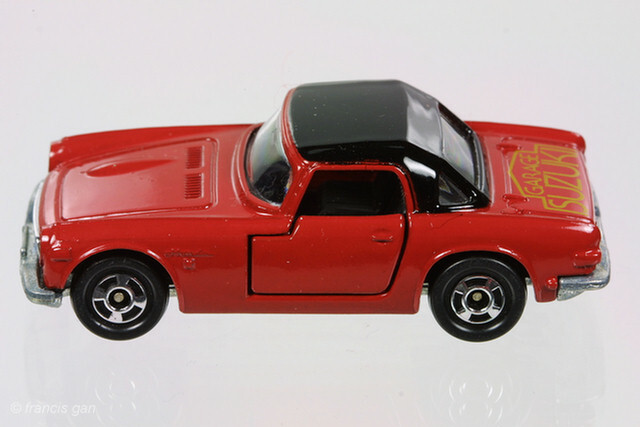 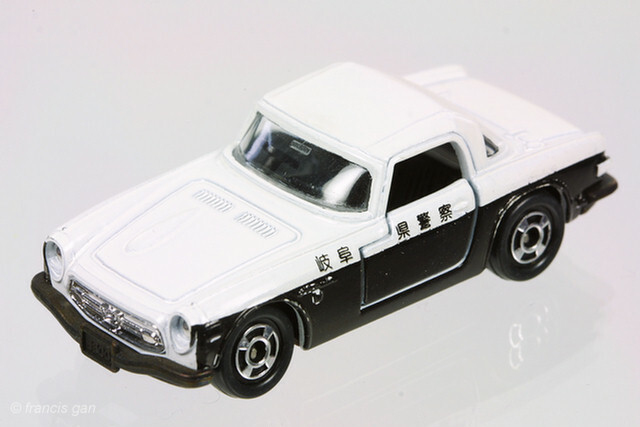 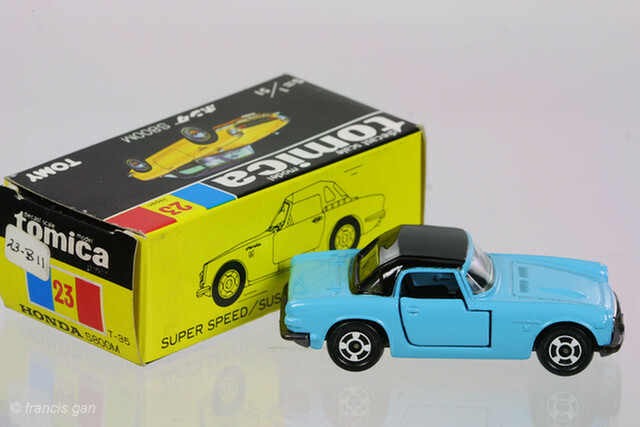 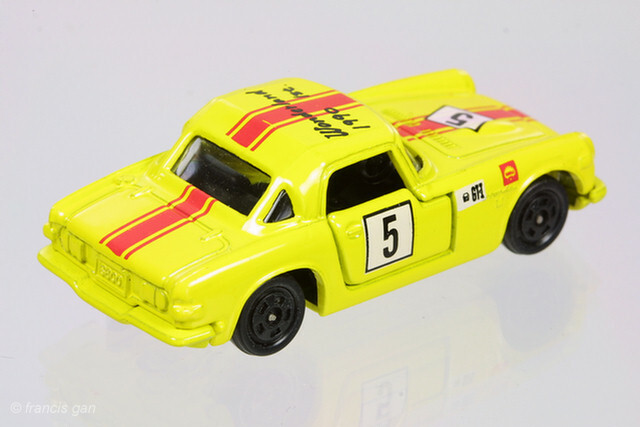 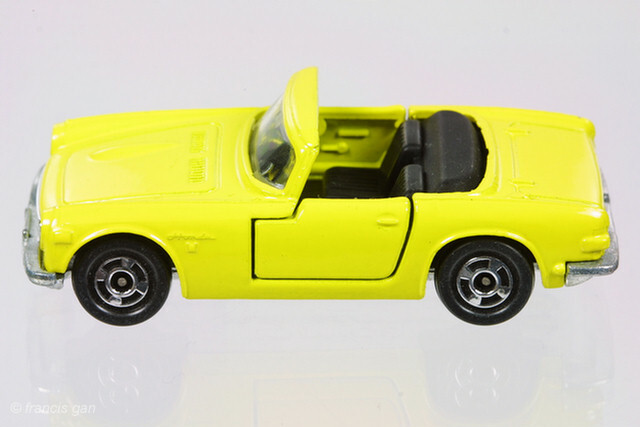 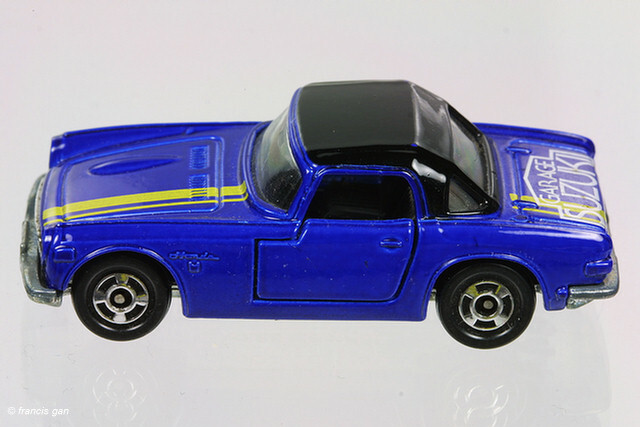 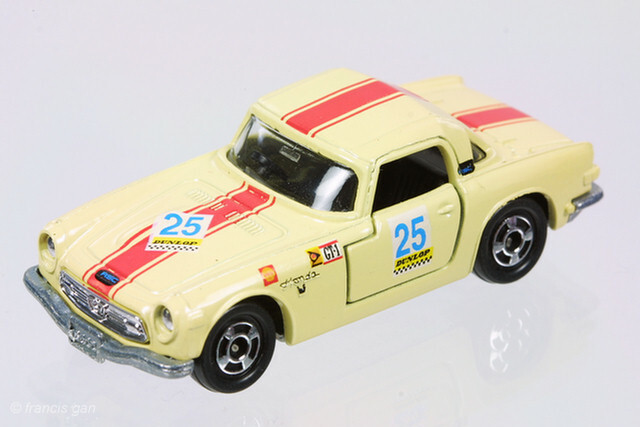 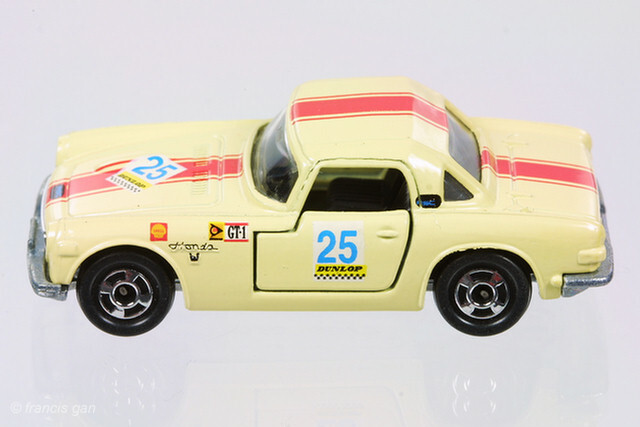 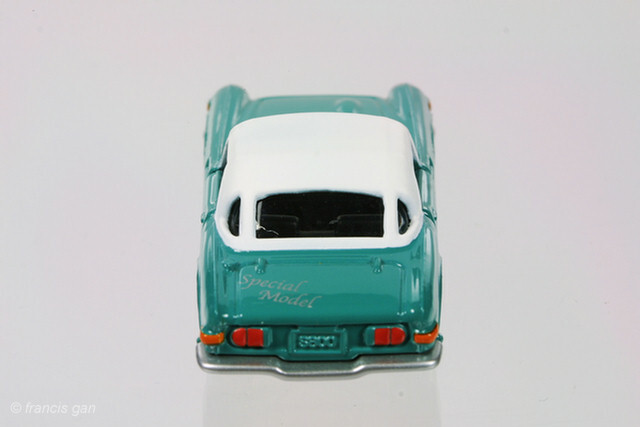 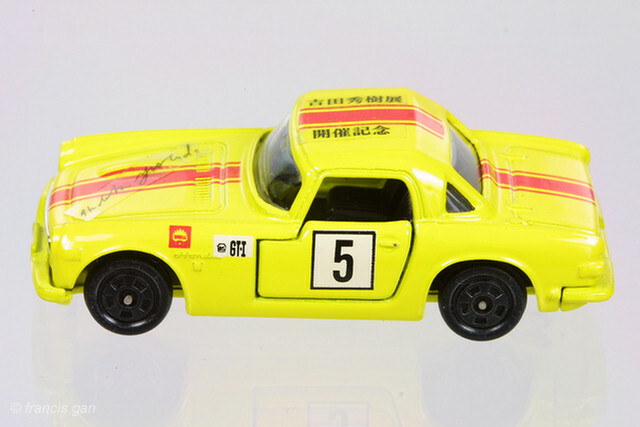 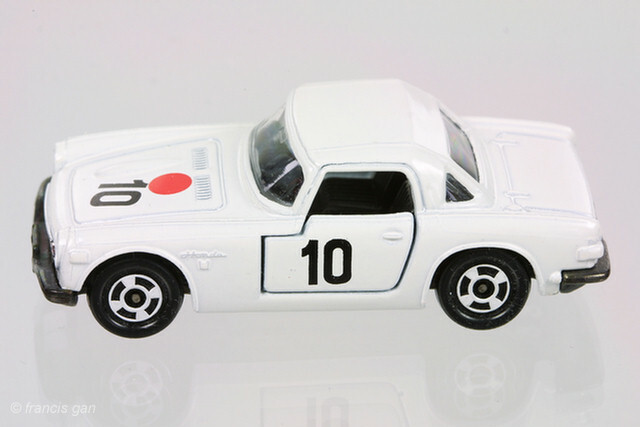 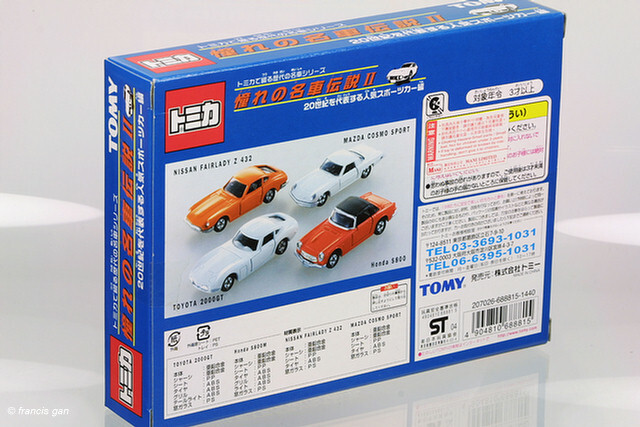 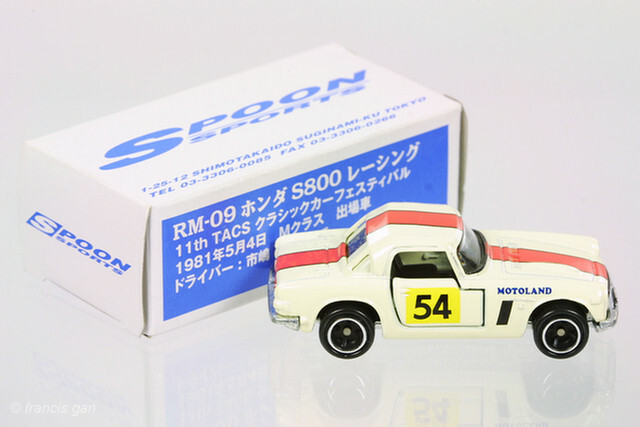 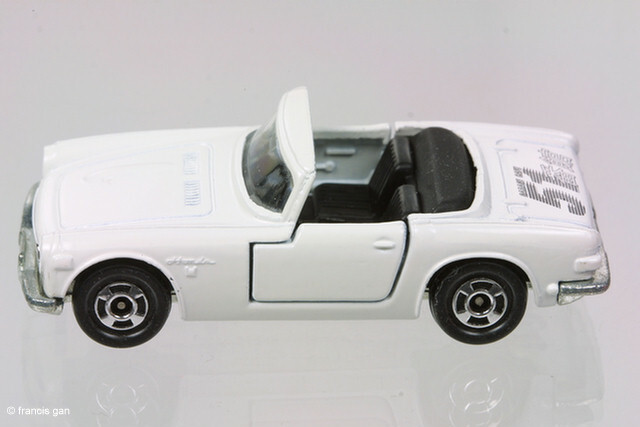 A special "Sting" version in a specially marked box from the Hamamatsu 60's Sports Car Club. 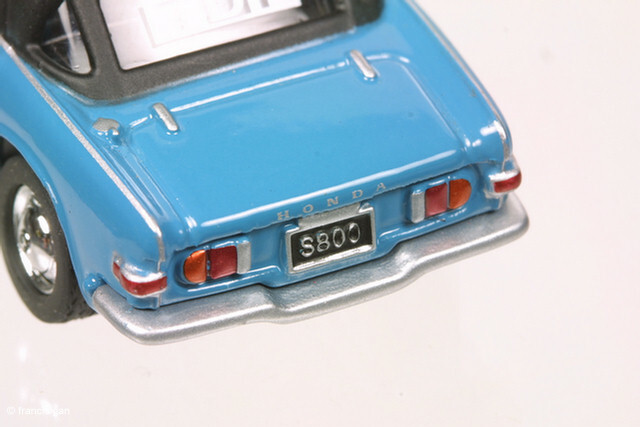 A Police version of the S800. 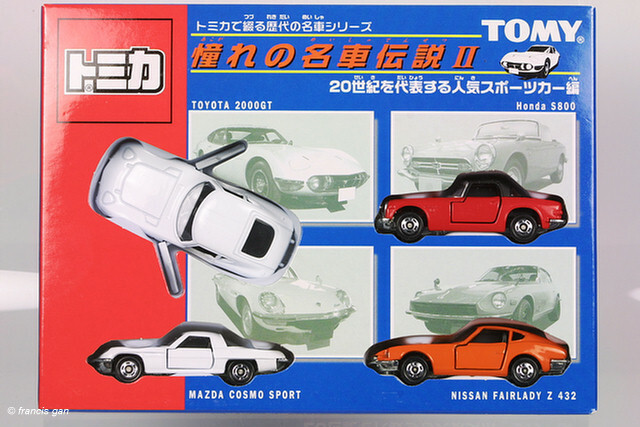 Packaging unknown, though judging from the bronze anodized base plate, it is likely this made in Japan version came in a black/yellow T35 box. 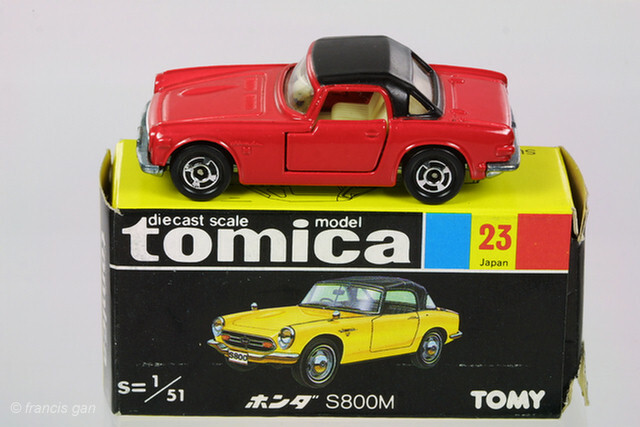 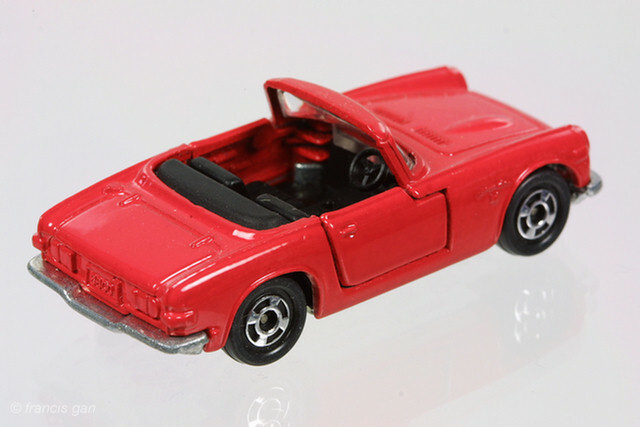 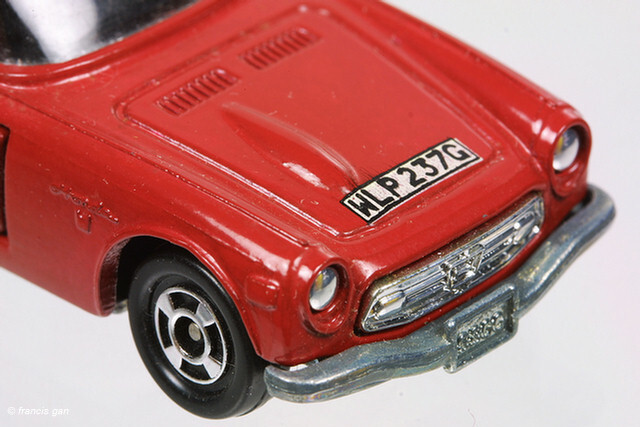 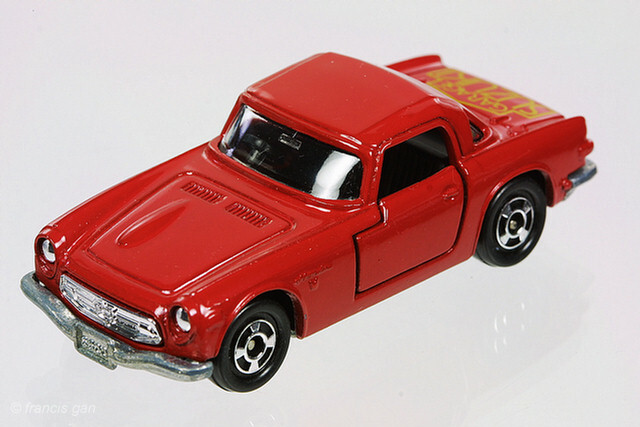 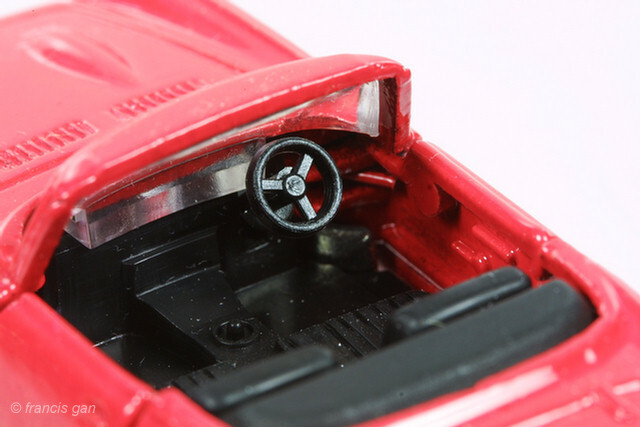 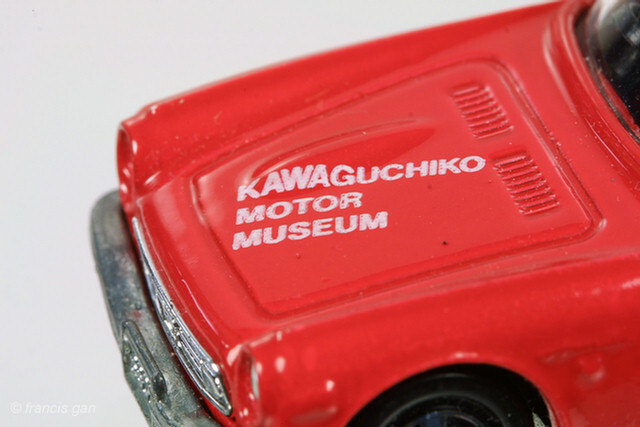 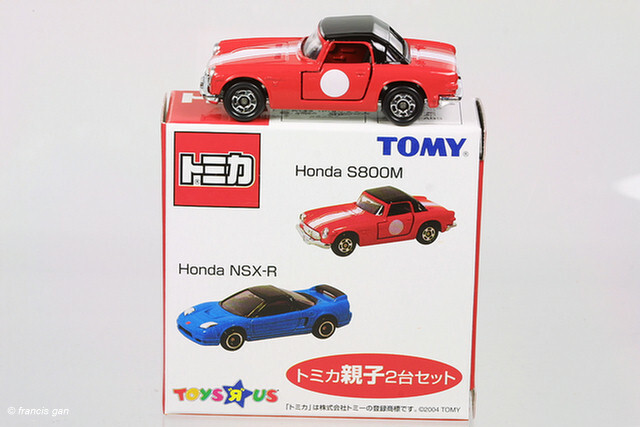 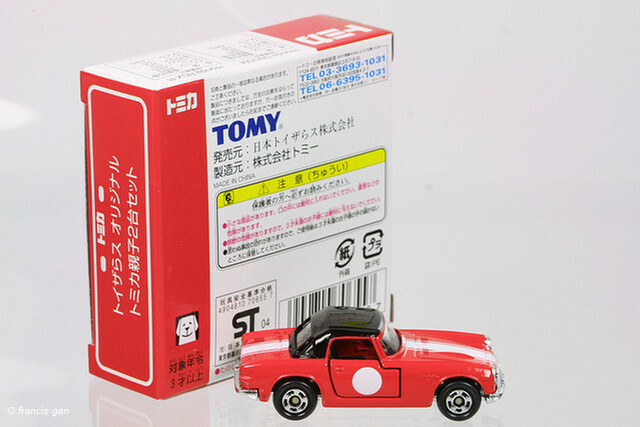 A red S800 was introduced in the Tomica Limited series. 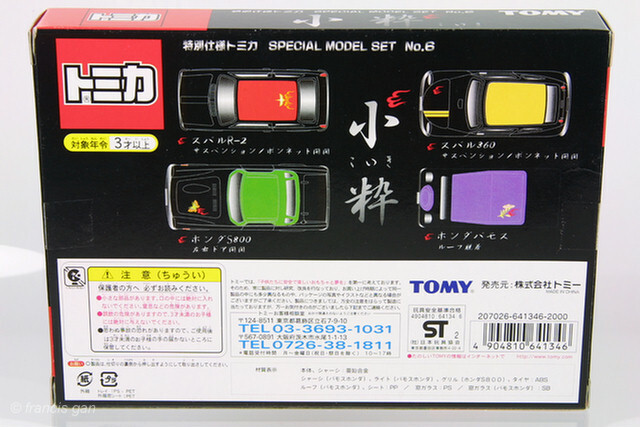 The limited series cars came in nicer display boxes with a metal name plate and lots of painted details. A red S800 with a custom box made in China. 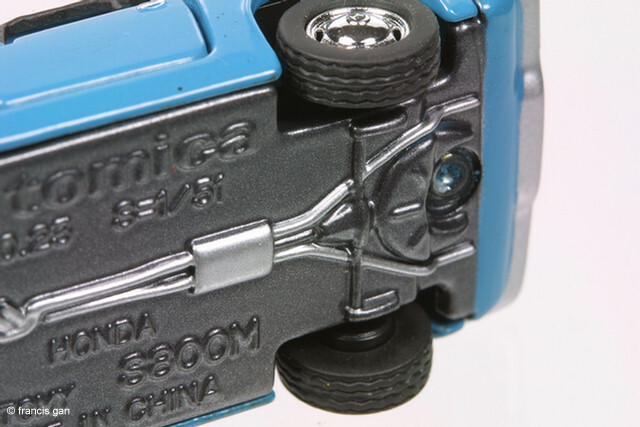 A later issue made in China version with painted headlight trim. 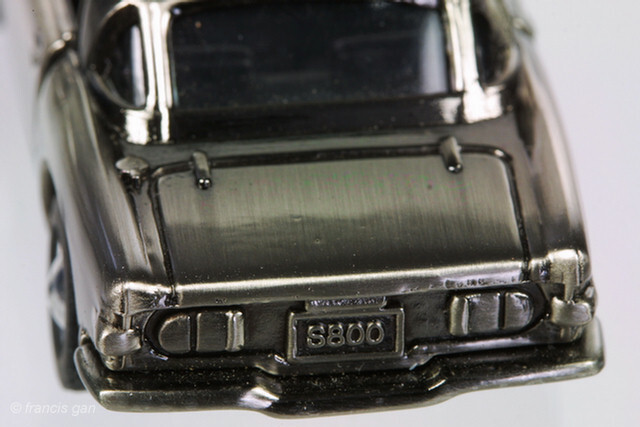 This black S800 was part of the Special Model Set No. 6. 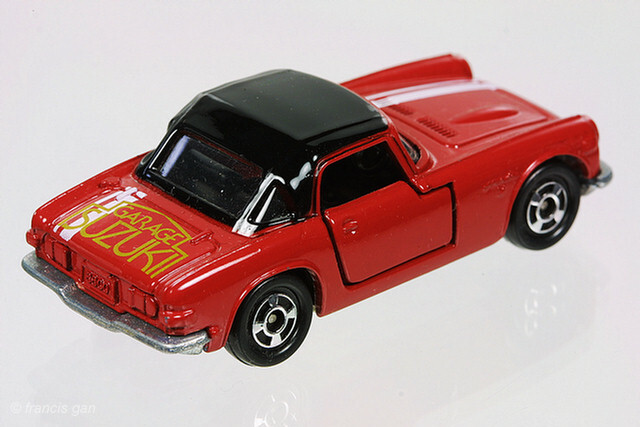 Here are 3 variations in the custom "Thank you kids" version. 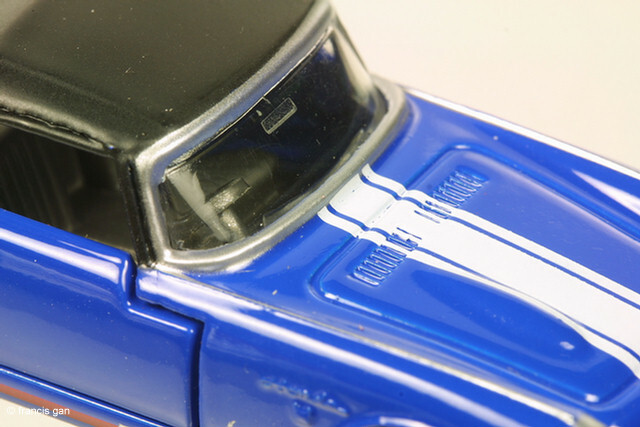 They all come in identical boxes with variations in the hood and roof decals. 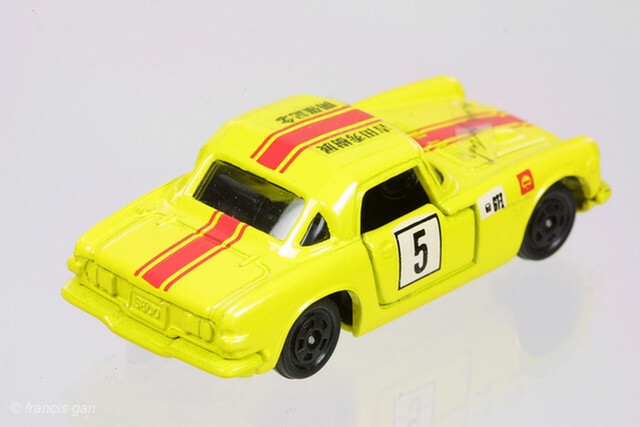 The uniqueness of this custom version are the black wheels and yellow bases. 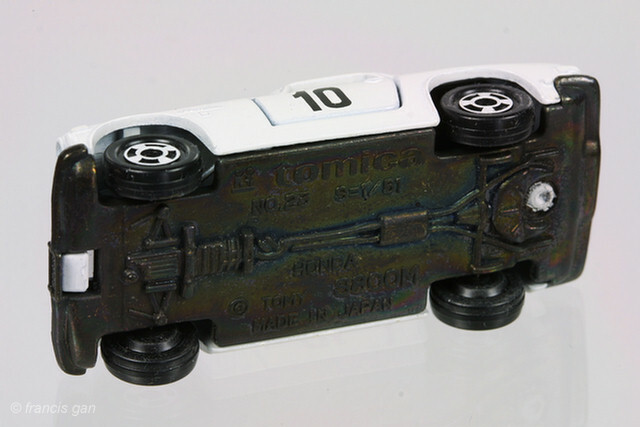 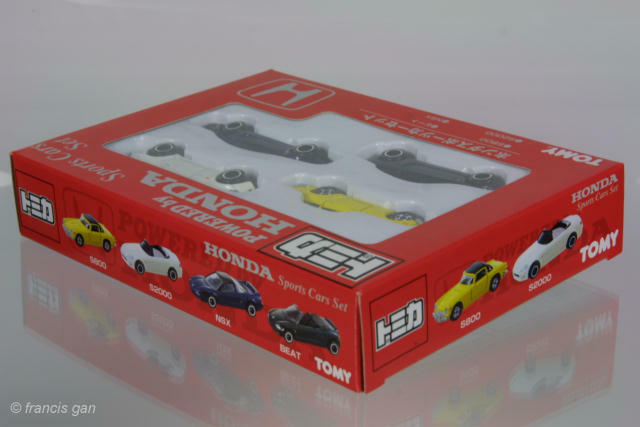 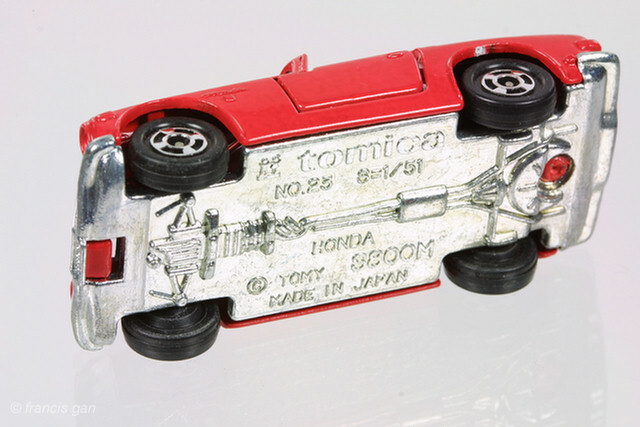 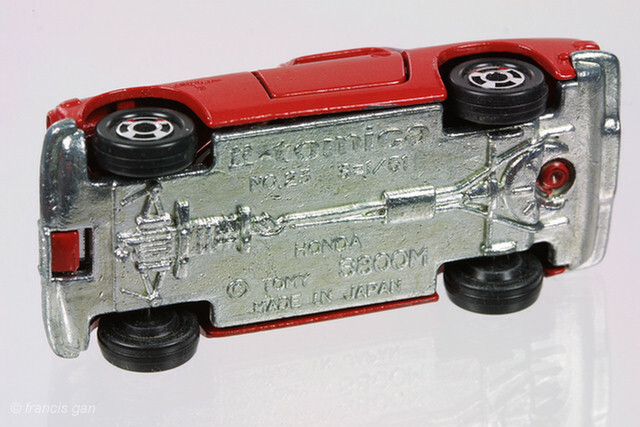 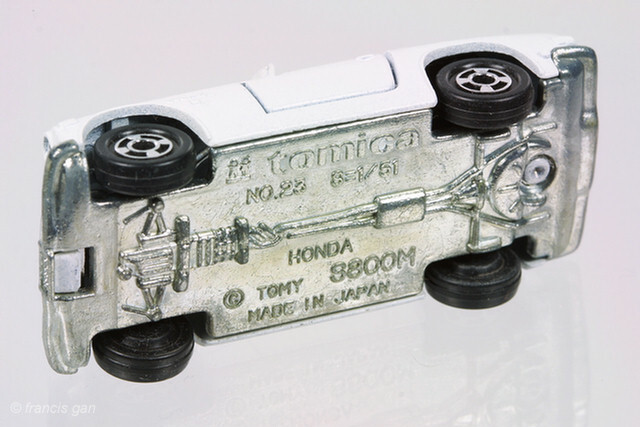 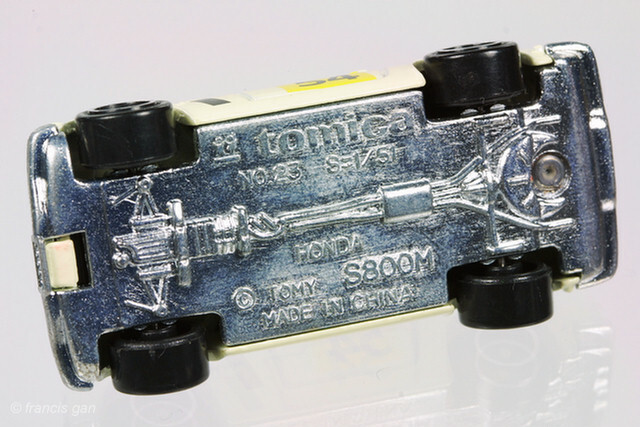 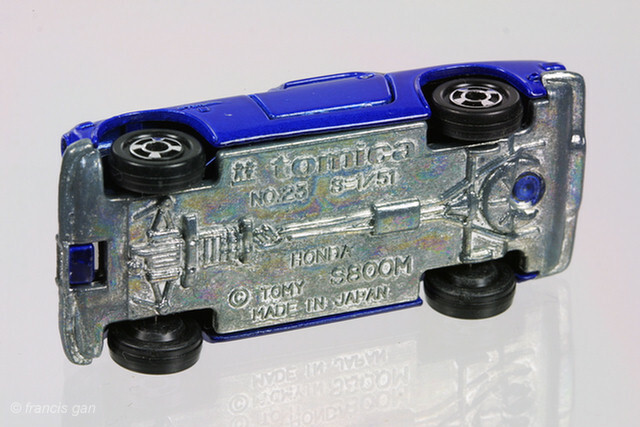 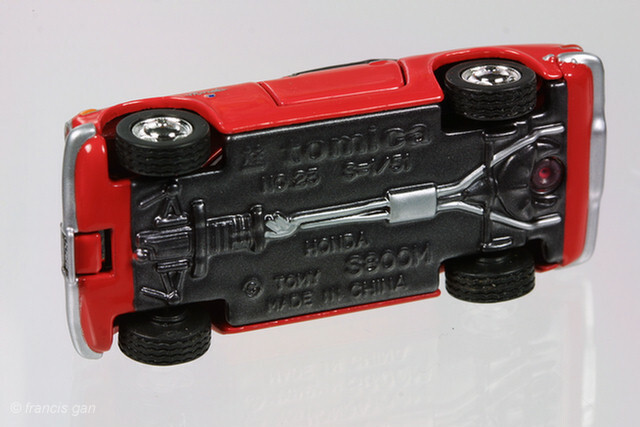 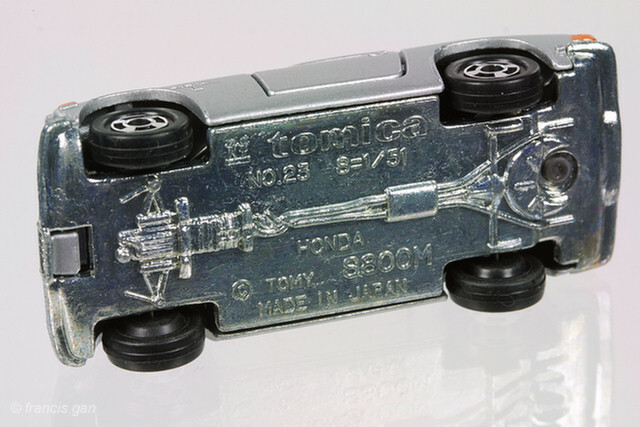 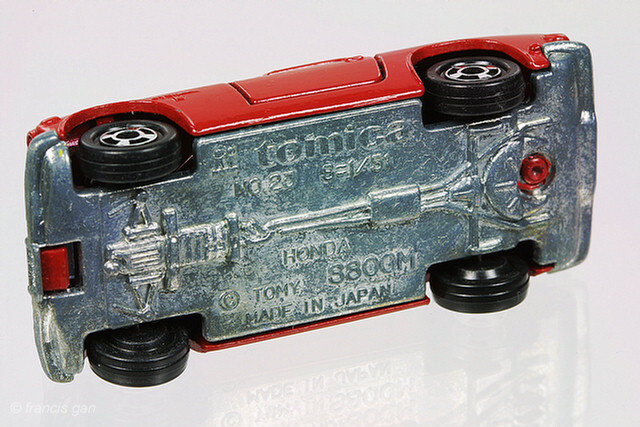 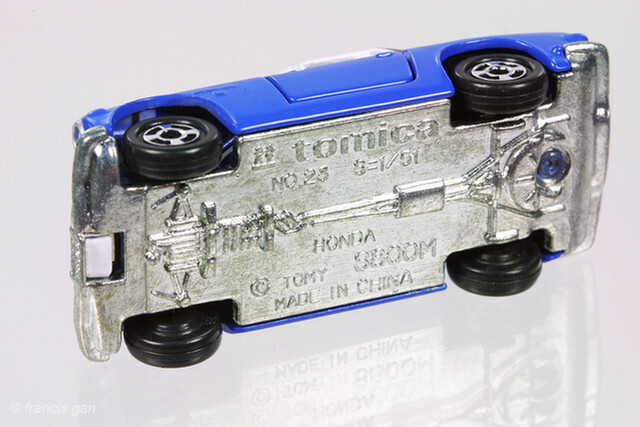 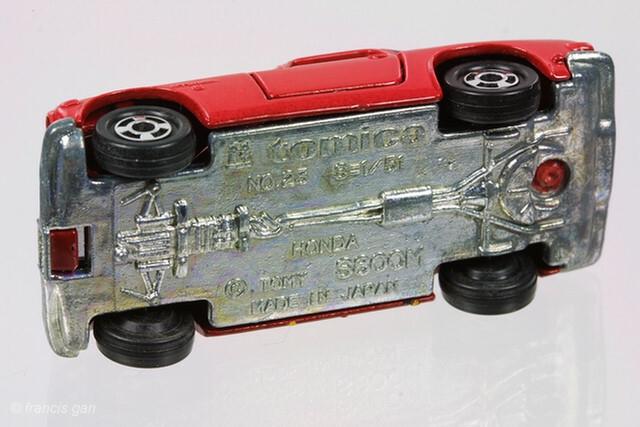 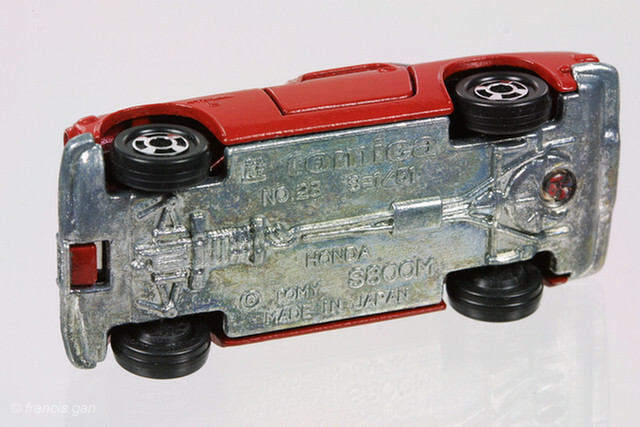 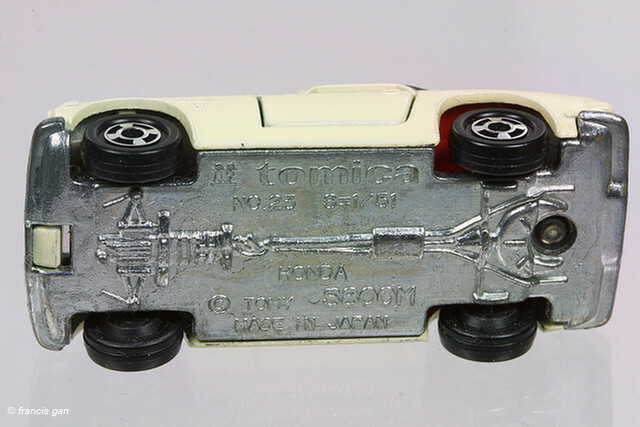 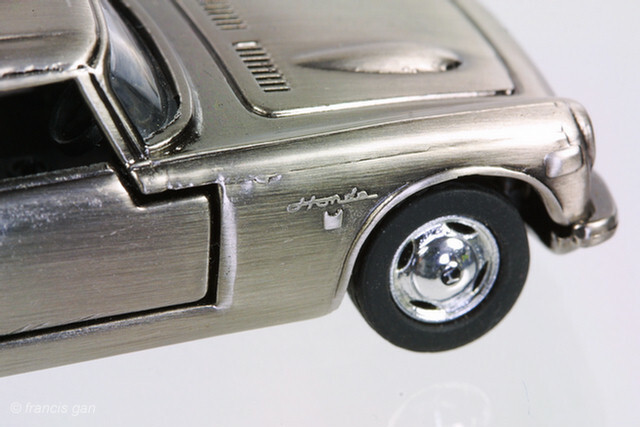 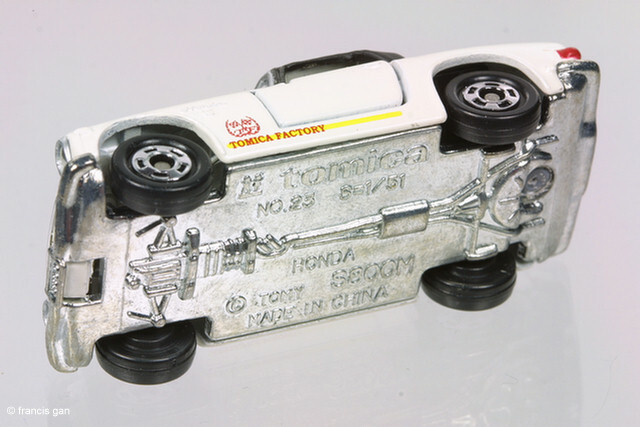 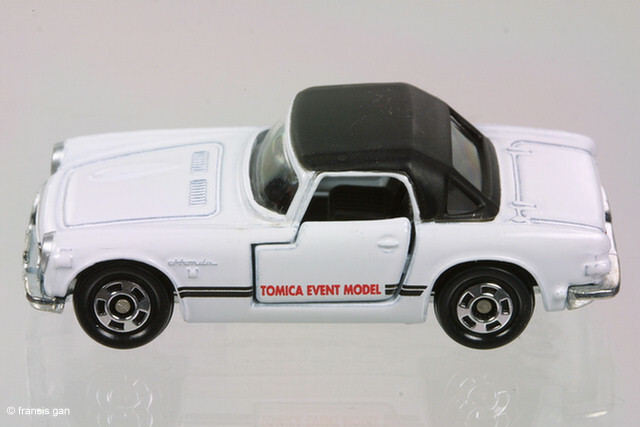 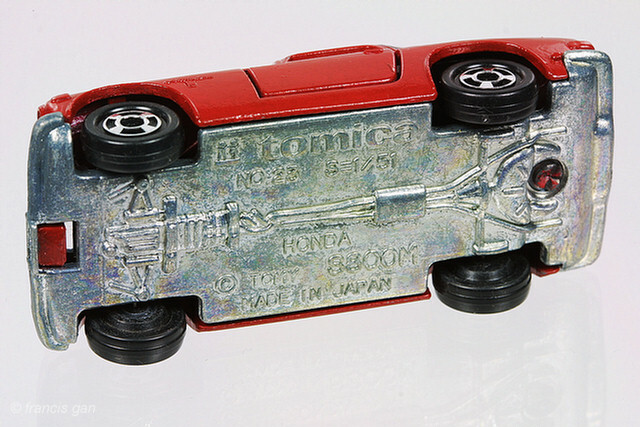 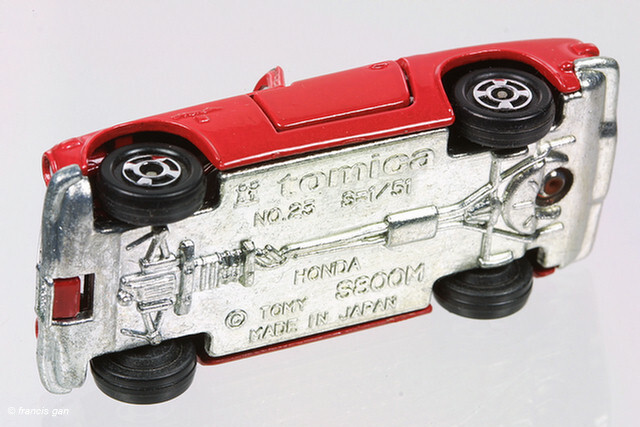 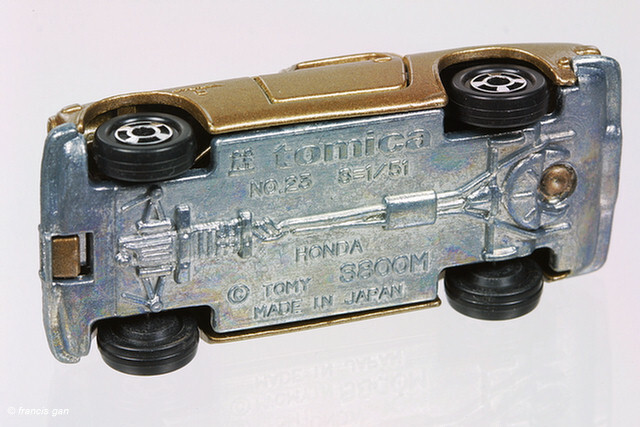 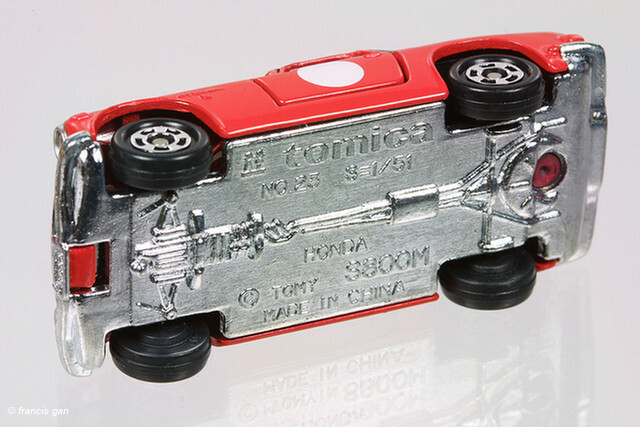 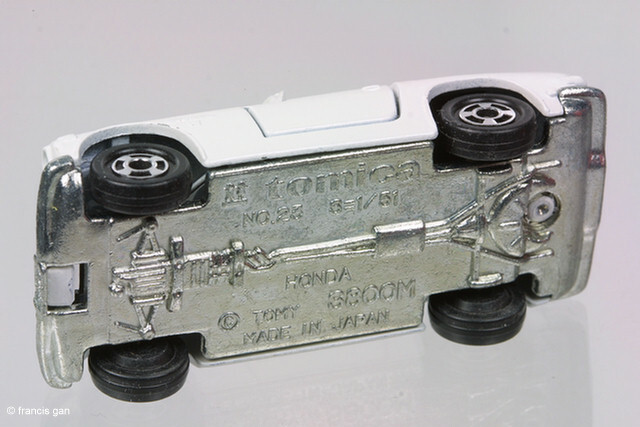 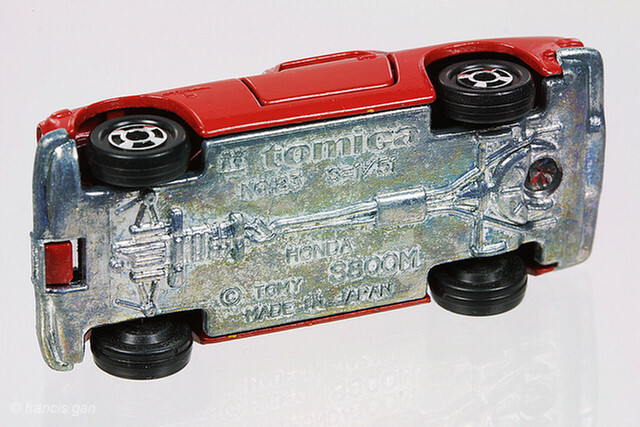 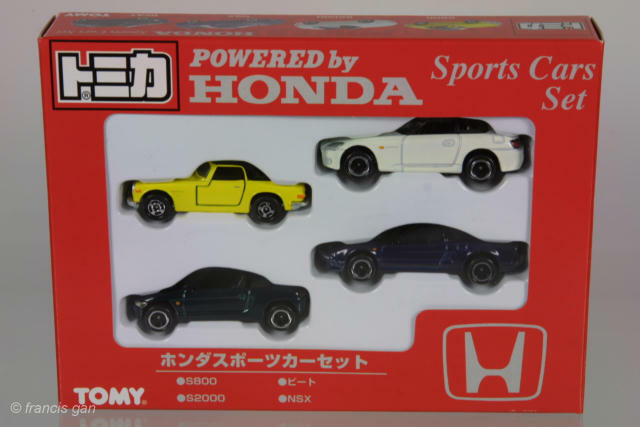 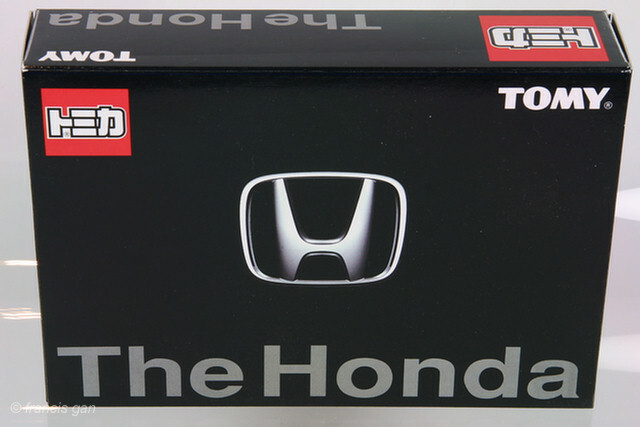 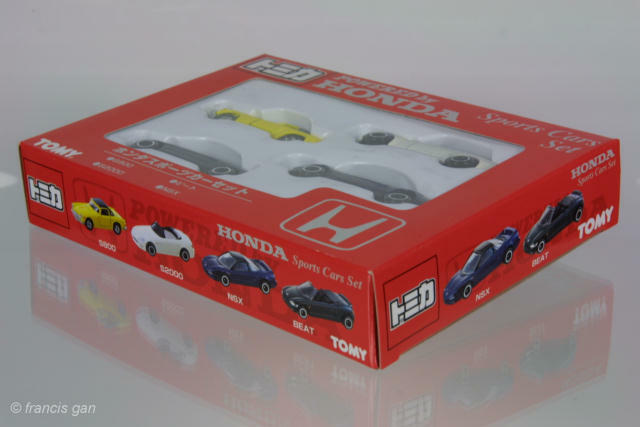 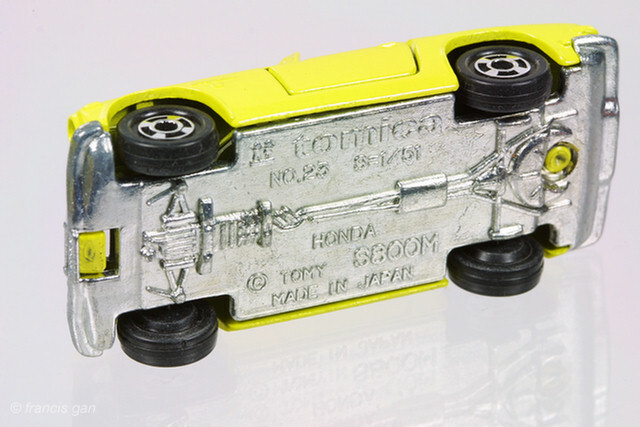 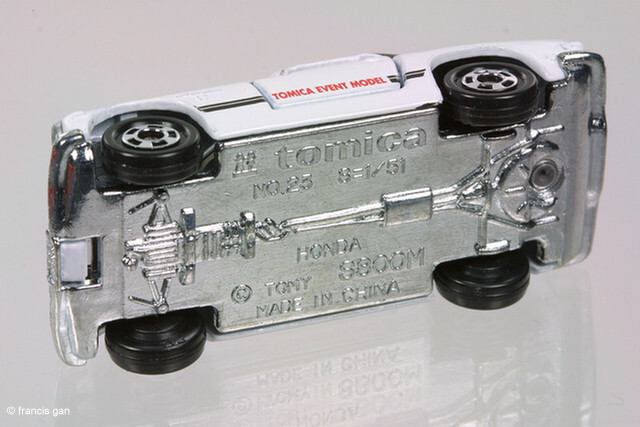 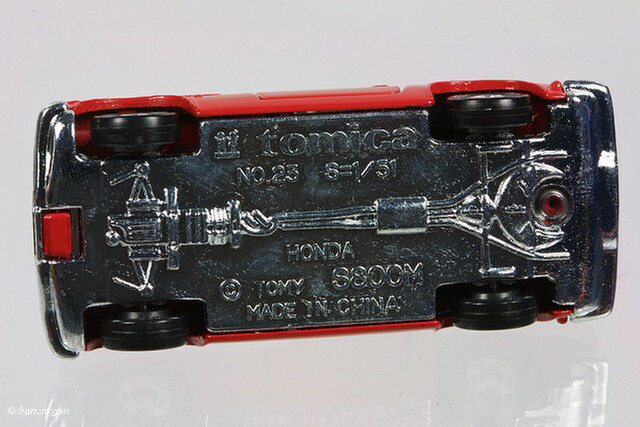 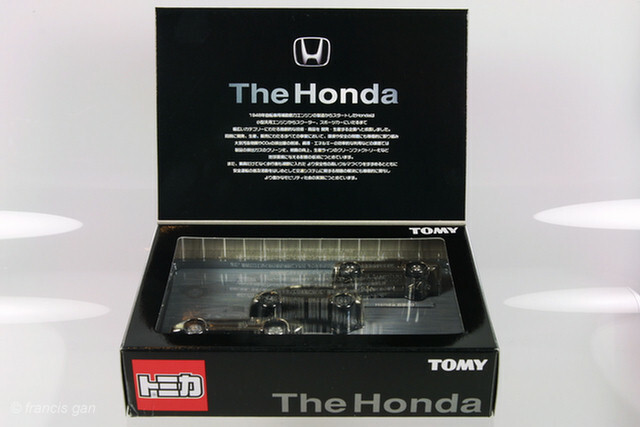 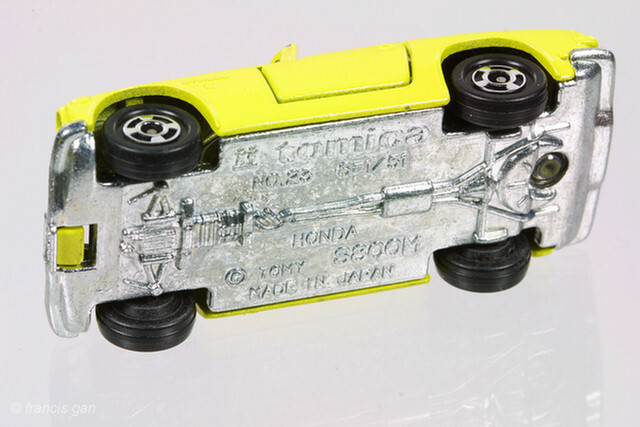 In the "The Honda" set, Tomica released 3 cars (Fit, NSX, S800M) that were brush nickel finished. 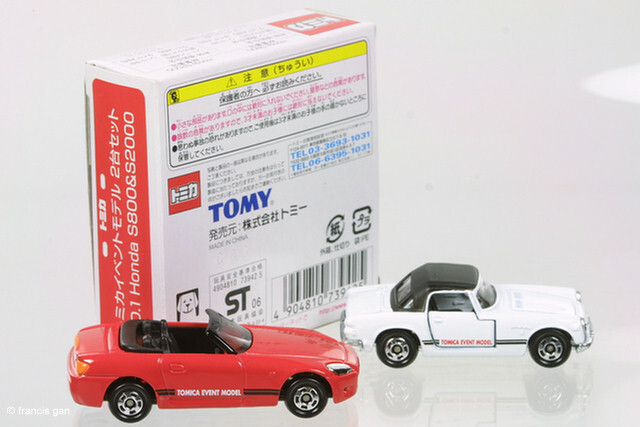 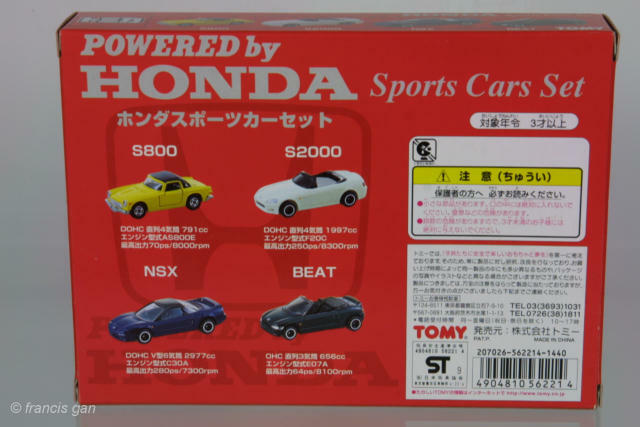 The S800 and NSX were from the Tomica Limited series will a lot of additional details including special wheels and tires. 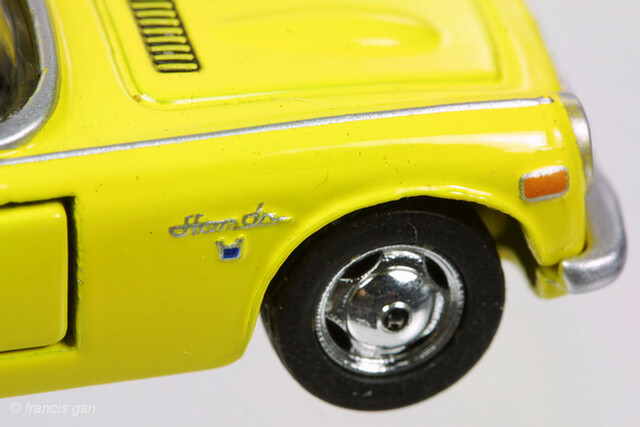 Notice the details on the chrome wheels! 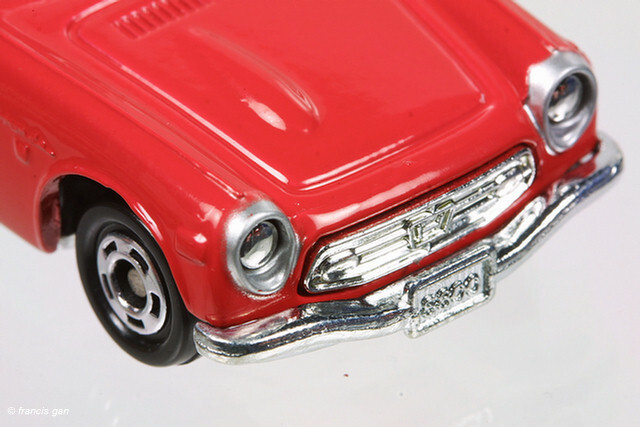 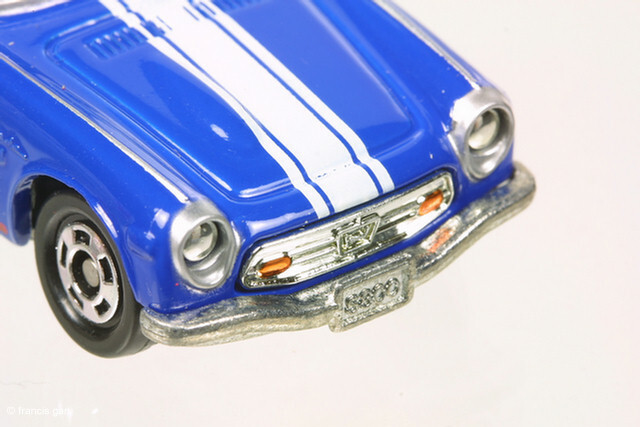 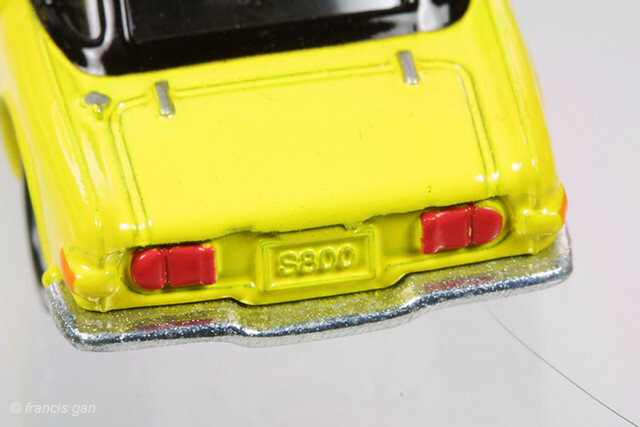 The S800 from the Legends II set has silver windshield and headlight trim but lacks any other detail. 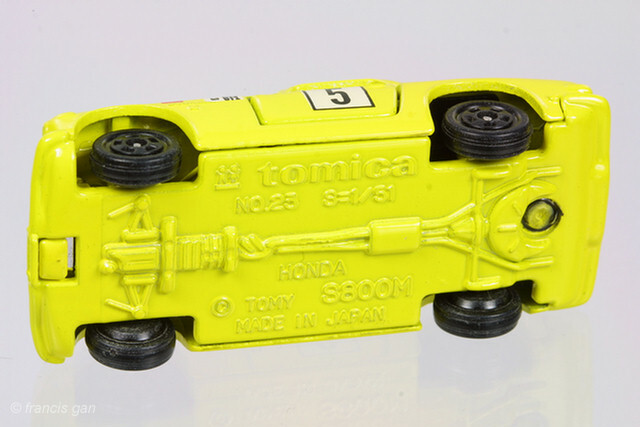 Comes with 5 spoke wheels. 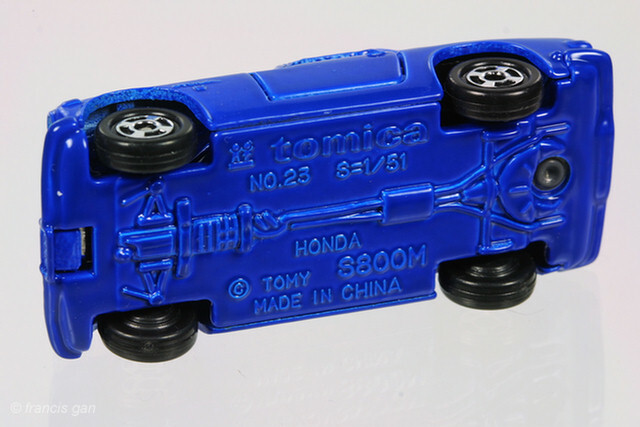 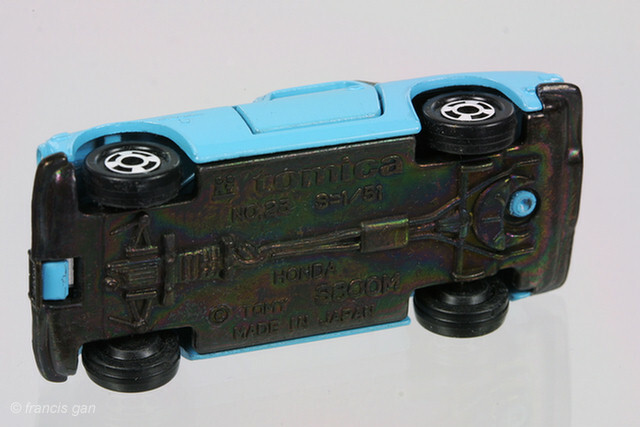 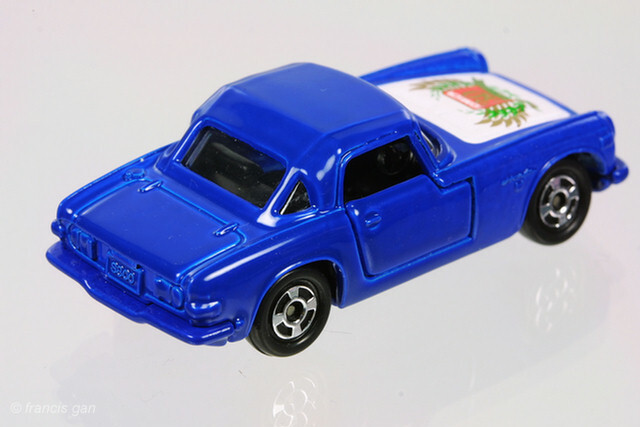 A blue S800 that came in a ChoroQ - Tomica set. 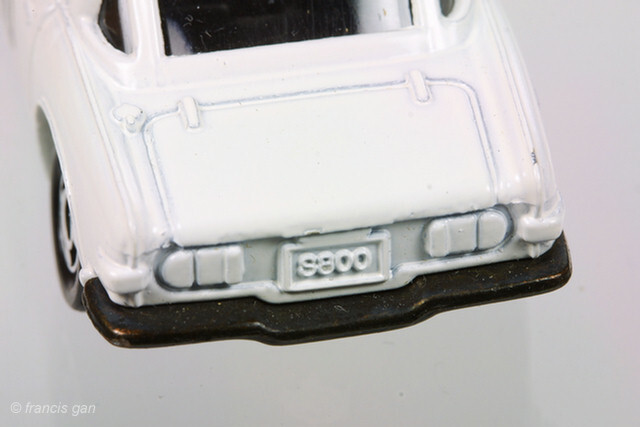 This S800 is the higher detail version. 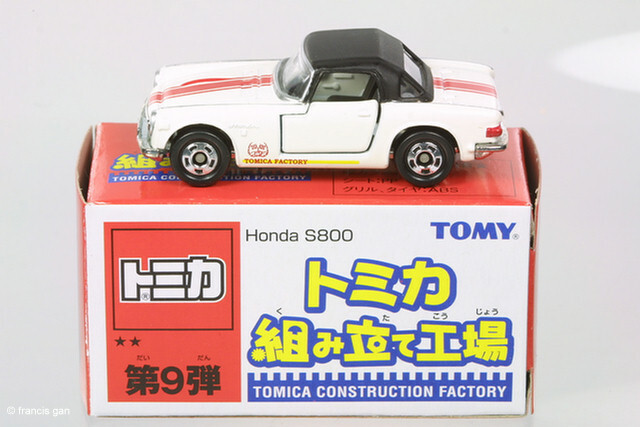 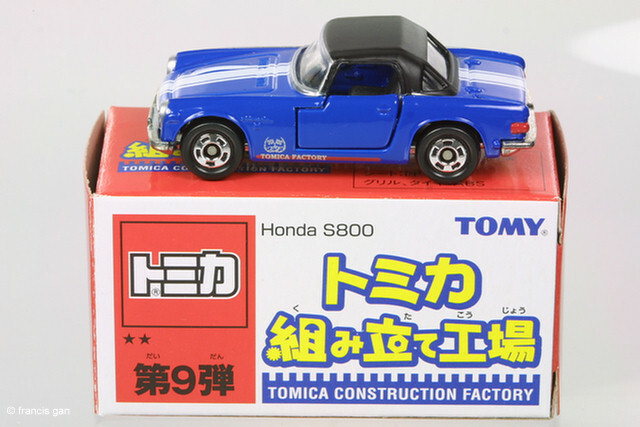 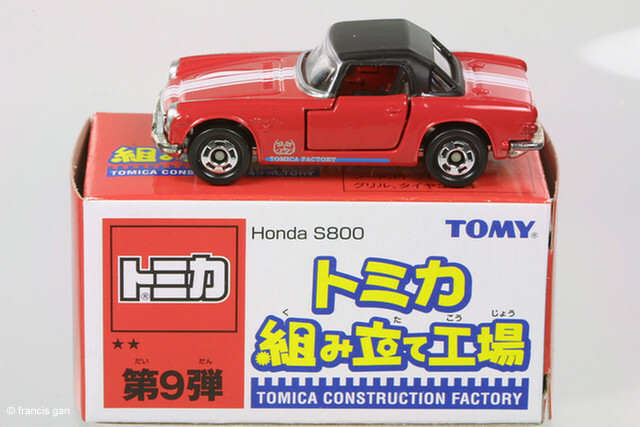 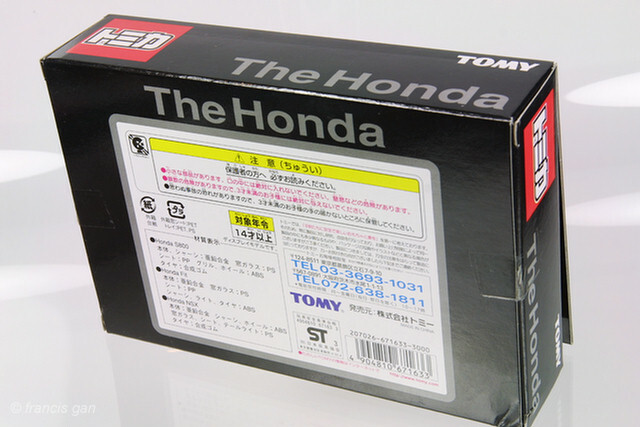 In 2006, Tomica released a set of Tomica Construction Factory commemorative versions of the S800 in Red, Blue and White with stripes.